The last time I passed through this section of woods I couldn’t have been more than 12 years old. The house I grew up in was just a few yards from the railroad tracks and I’d guess I started walking those tracks almost as soon as I could walk. I knew that if I followed them one way (north) I’d get to my grandmother’s house and then downtown Keene further on. But I didn’t know where the other direction went, so one day I decided it was time to find out. It would be my first great adventure. There was a slight problem though. 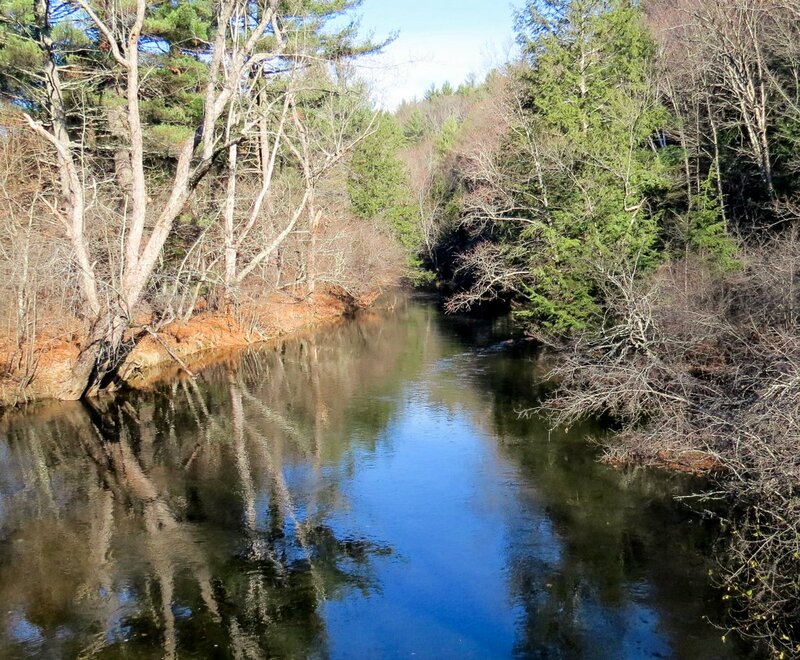 The Ashuelot River was also just a few yards from the house and if I was going to follow the tracks the way I’d never been I had to cross it by way of the train trestle over the Ashuelot River. The trestle had gaps between the ties and if you weren’t careful my grandmother said, a skinny little boy like me could fall right through one of those gaps and end up in the river. That thought had held me back for a long time as she knew it would but on this day I was determined, so off I went across the trestle for the first time, headed south. My father knew that a boy had to run and explore and learn, and he let me off the leash early on. I had no mother to say otherwise so I simply loved life and made my own fun. Unlike the other boys I knew who could only seem to focus on what they didn’t have I saw what I did have, and though we were poor when it came to money I knew that I was rich; I could see it, sharp and clear, and even at twelve years old I knew that no boy anywhere else on earth was having a better boyhood than I was. But even so my father would have had something to say about this adventure and I probably would have had to eat standing up for a few days if he’d found out. That’s because he knew the river drew me like a magnet. He was forever having to tell me to stay away from it, and with good reason. As I was taking photos of the frozen river on this day it began to groan and crack open and my stomach fell into my shoes. It was the same sound I’d heard when I was walking down the middle of it so many years ago when the ice gave way. Even after 50+ years it’s a sound that can still make my stomach lurch and my hands shake. I could have drowned that day but instead I learned a good lesson, and it’s one I’ve never forgotten. In fact I learned all kinds of things along these rail lines because I was curious and I wanted to know the answers to the thousand and one questions I had in my head. Since nobody I knew could answer the questions I turned to books. 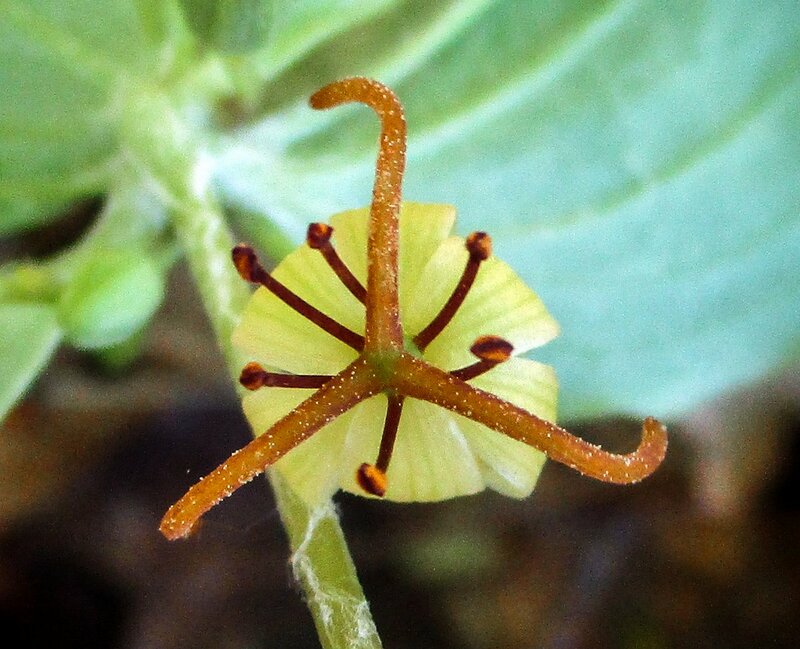 Botany books, wildflower books, tree books, bird books, I had them all and I learned from them, but even so I’m still what I call “overly curious” when it comes to the natural world, and it’s that curiosity that fuels this blog. 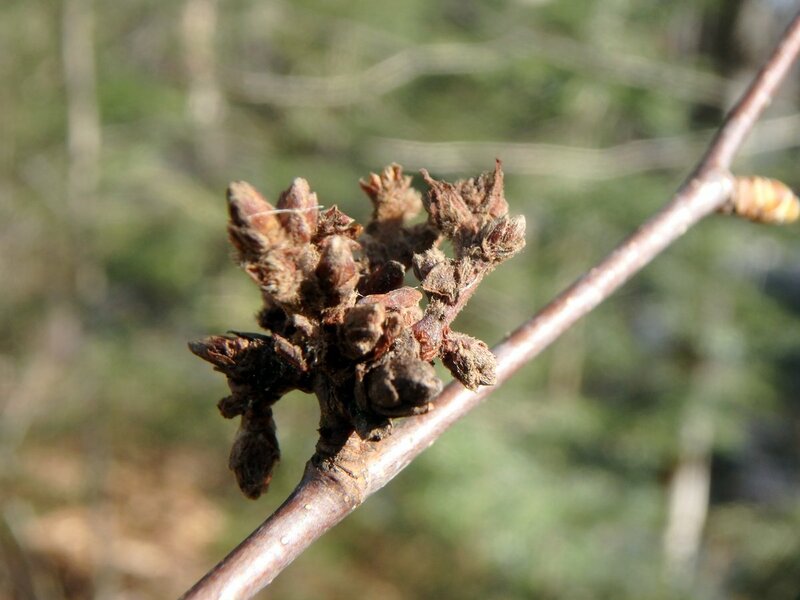 For instance I’ve wondered for years why the buds on a black birch will suddenly form a cluster of buds like that in the above photo. It’s almost like a witches’ broom but not quite because they don’t seem to grow after they knot up like this. Actually I think they die. 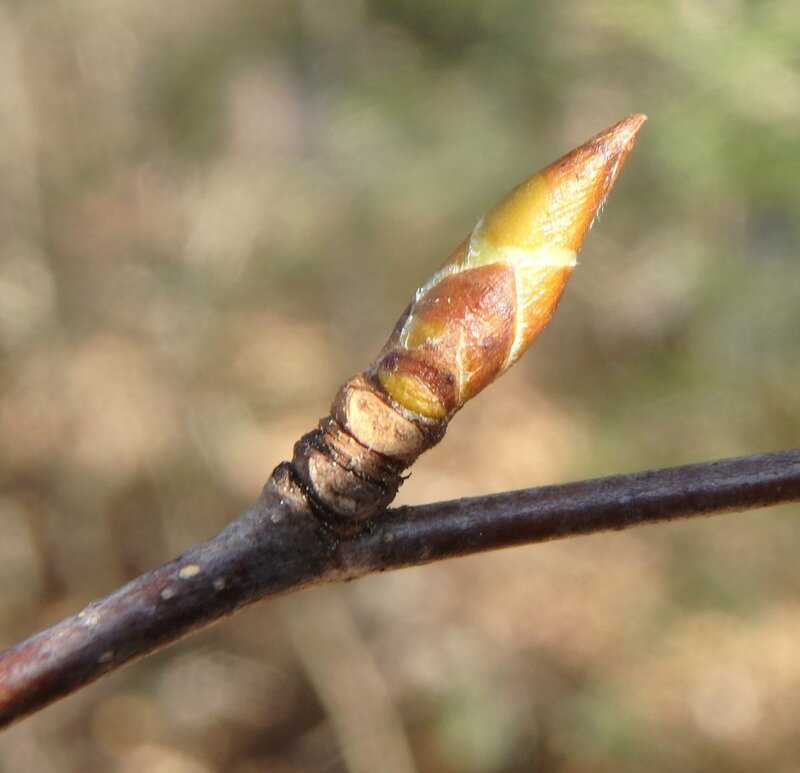 This is what a normal, healthy black birch bud (Betula lenta) looks like. The young bark of these trees looks a lot like cherry bark but if you nibble a twig and taste wintergreen, it’s a black birch. It’s also called sweet birch and cherry birch, and birch beer was once made from it and so was oil of wintergreen. 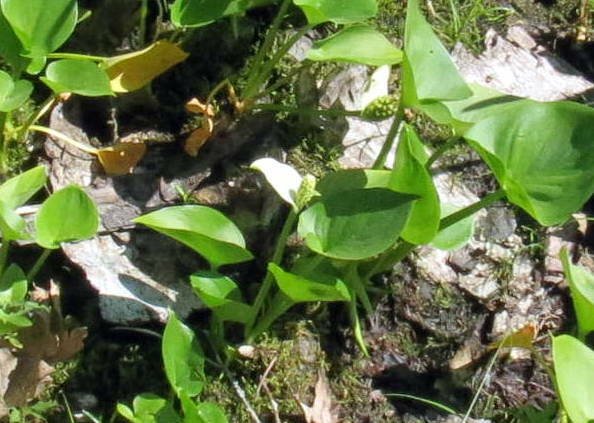 In fact so many trees were taken to make oil of wintergreen for many years the trees were very hard to find. This is the only birch that I’ve seen the strange bud clusters on. 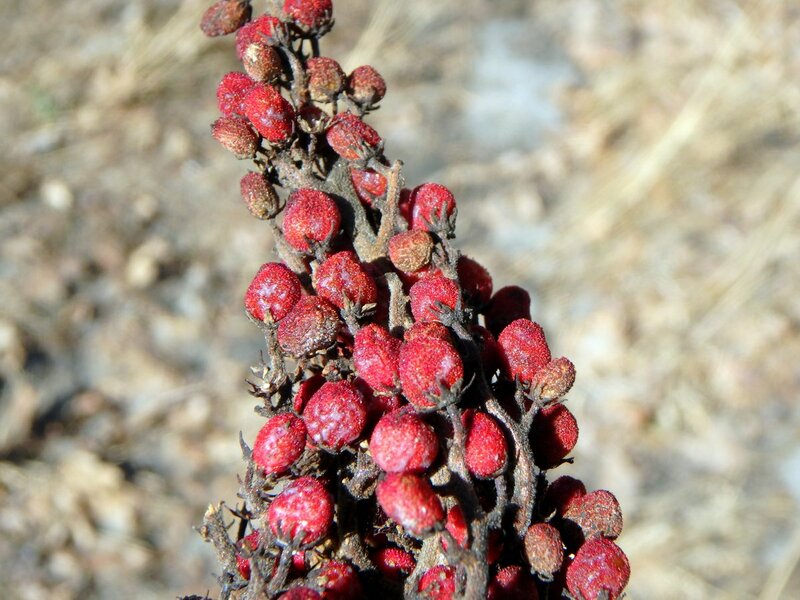 Another mystery is why birds don’t eat sumac berries until spring in this part of the country. I’ve heard that in other parts of the country they snap them up as soon as they ripen but here they’re still on the bushes even into April in some years. I’ve heard that they’re low in fat and not very nutritious so that might have something to do with it, but why wouldn’t that be true everywhere? The berries seen here are those of the smooth sumac (Rhus glabra) but smooth or staghorn sumac berries, most will still be there in spring. 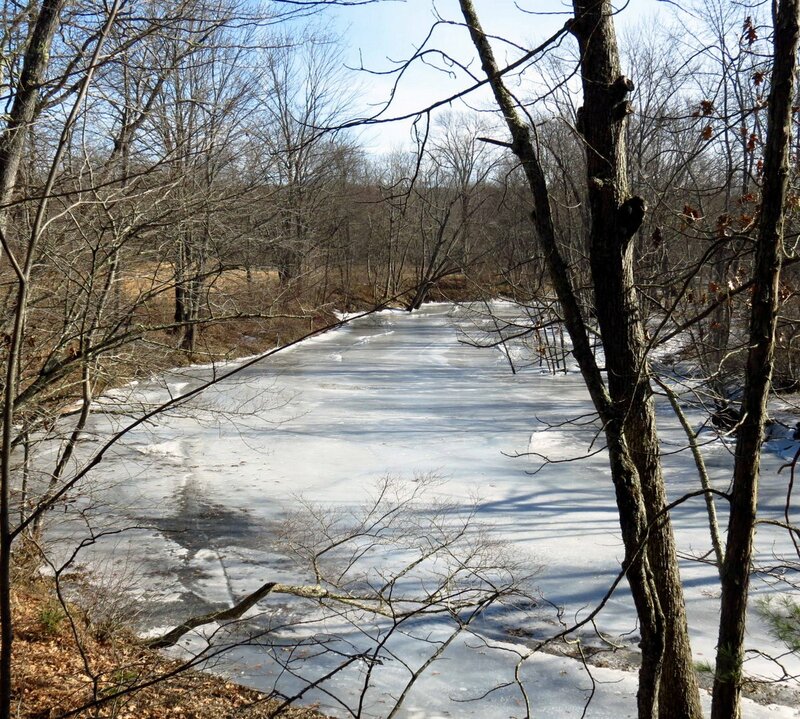 Another mystery is how can a river look frozen solid in one place and then be free of ice less than a mile downstream. It could have something to do with restricted flow, I think. The place where I took the photo of the iced over river has a kind of S curve and an island, and both would slow down the flow. 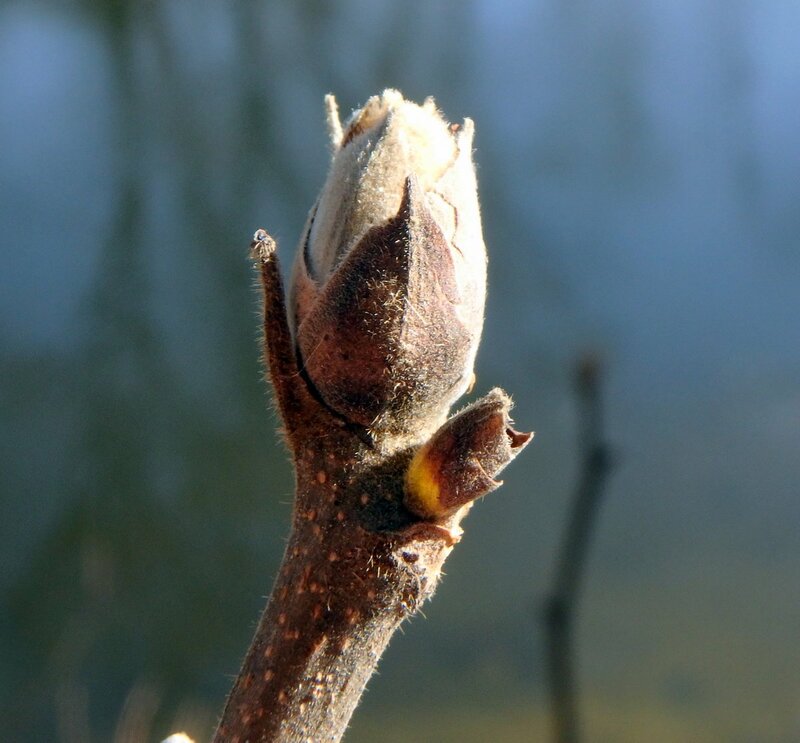 I had to have a look at the shagbark hickory buds (Carya ovata) while I was here. 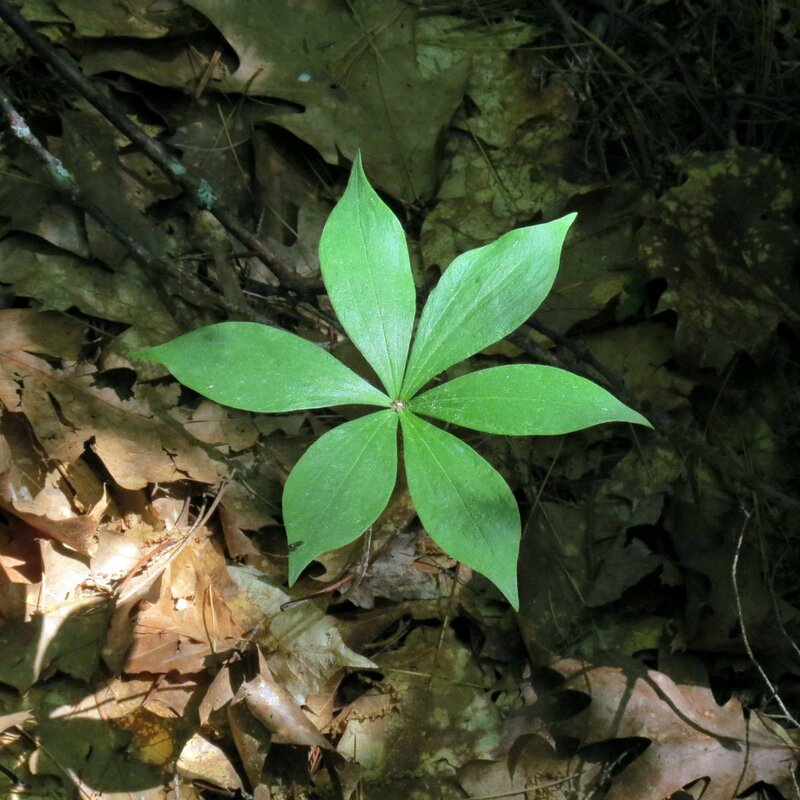 There is no sign of any movement yet but come mid-May they’ll open to reveal some of the most beautiful sights in the spring forest. I did see some movement in some of the beech buds (Fagus grandifolia) I looked at though it was almost imperceptible. 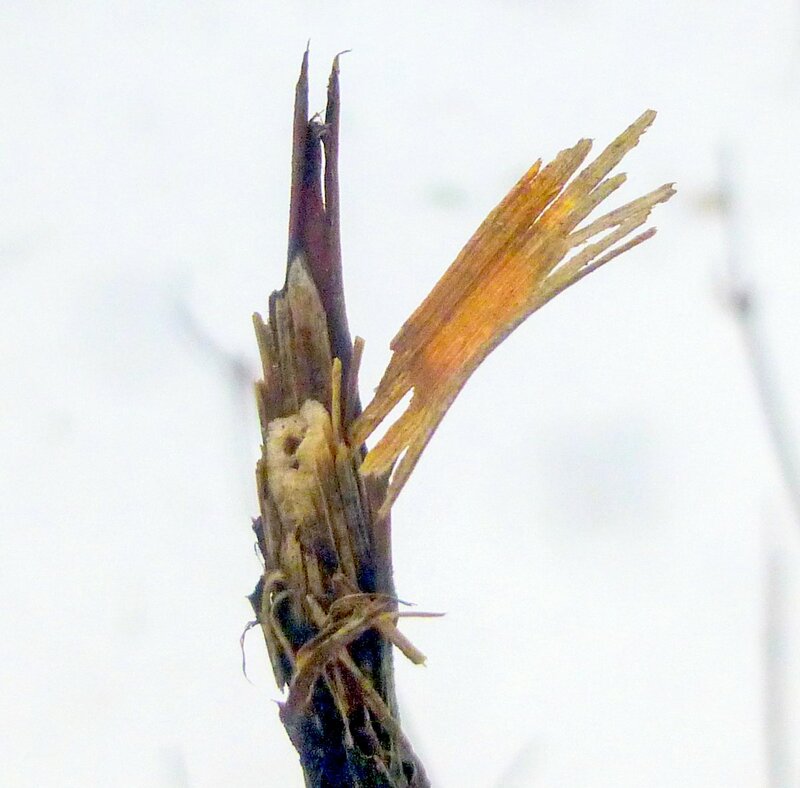 You can just see how some of the silvery white tips of the bud scales have barely pulled away from the bud. Soon they will start to grow and lengthen and then in May will finally open, and then the trees will look as if they’ve been hung with tiny angel wings. In places the woods were full of ice. And in other places they were nearly ice free. 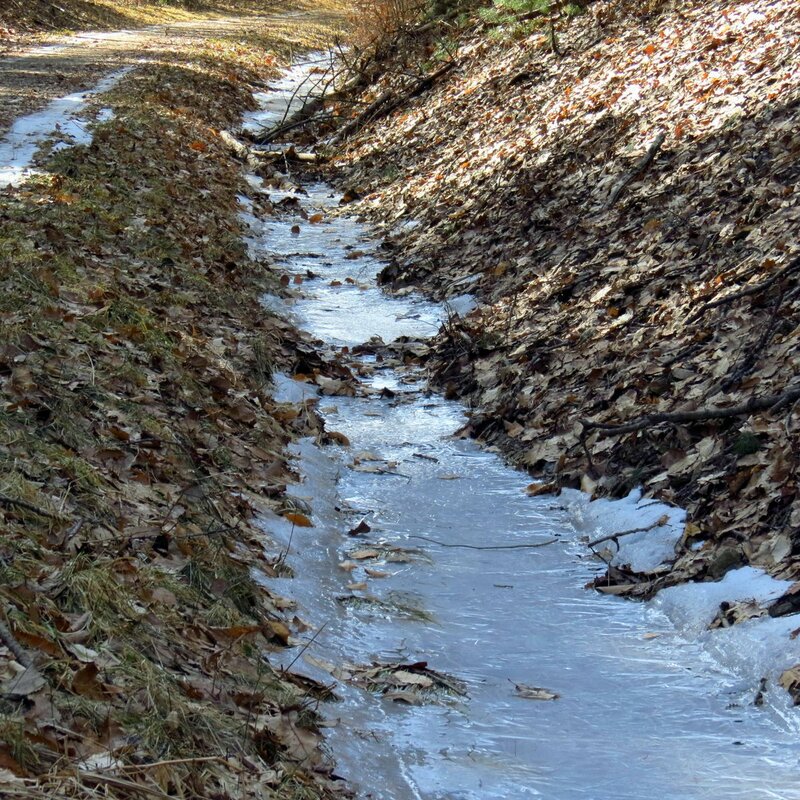 The drainage ditches that were dug by the railroad 150 years ago were still working fine, though they were ice covered. 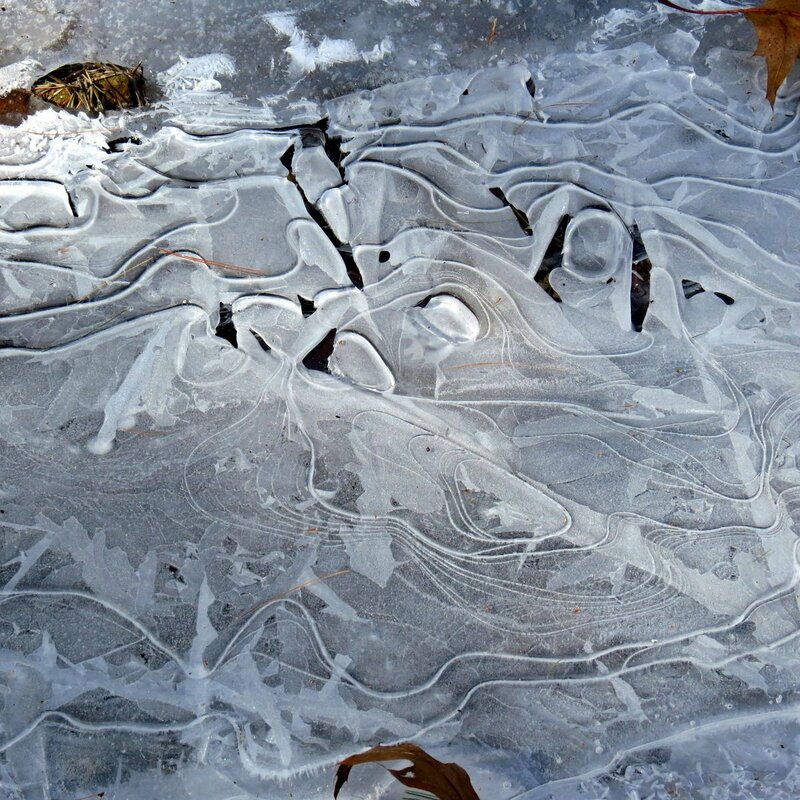 What interests me most about this ice is the oak leaf shape in the lower left corner. I can’t even guess how that would have happened. Ice is such fascinating stuff. There are lots of old stone walls out here. They are “tossed” or “thrown” walls, where the stones were literally just thrown on top of one another, because the object was to get them out of what would become cropland as quickly as possible. I know this wall is quite old because of the lichens and mosses on the stones. 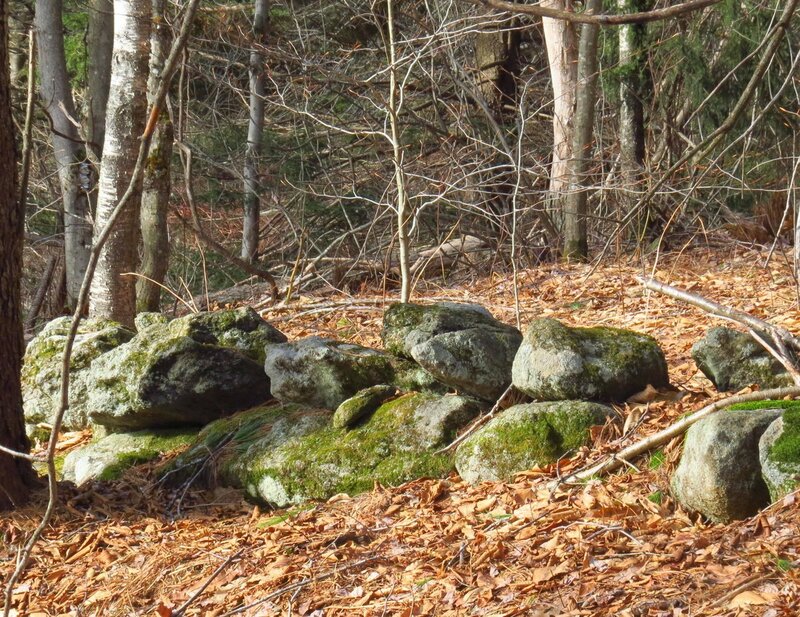 Walls I built 45 years ago still don’t have any mosses or lichens on them and the stones haven’t even grayed yet. I’d guess this one must be at least 200 years old, built even before the railroad came through. 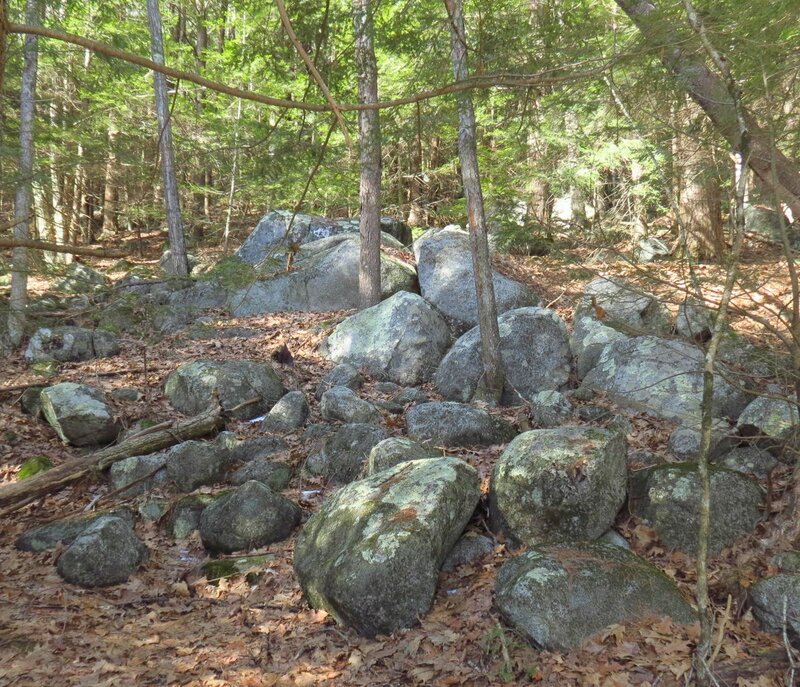 This boulder pile shows what those who first cleared the land faced. Left here by the last glacier, they had to be moved if you were going to plant crops. I’ve collected stones to build walls with and I can say that it is backbreaking work. 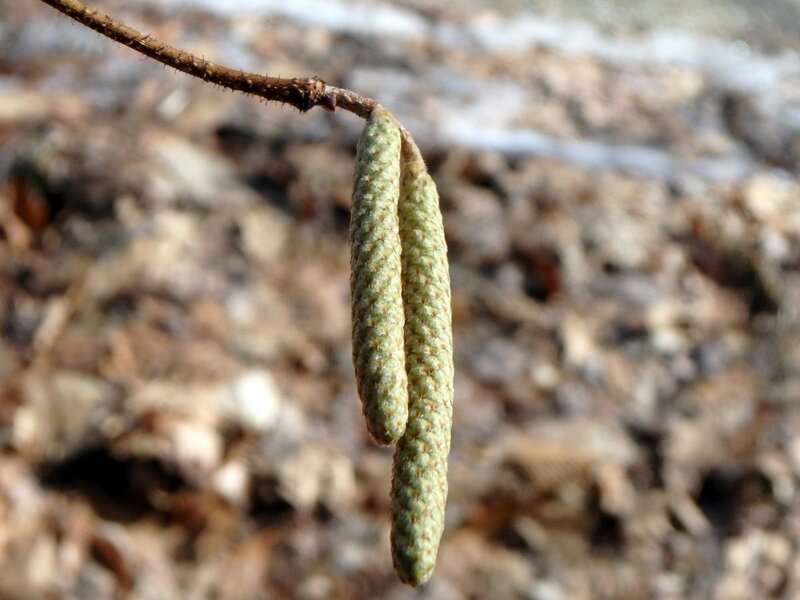 I hoped to see some signs of hazelnut catkins opening but these were still closed tight. It won’t be long now though. 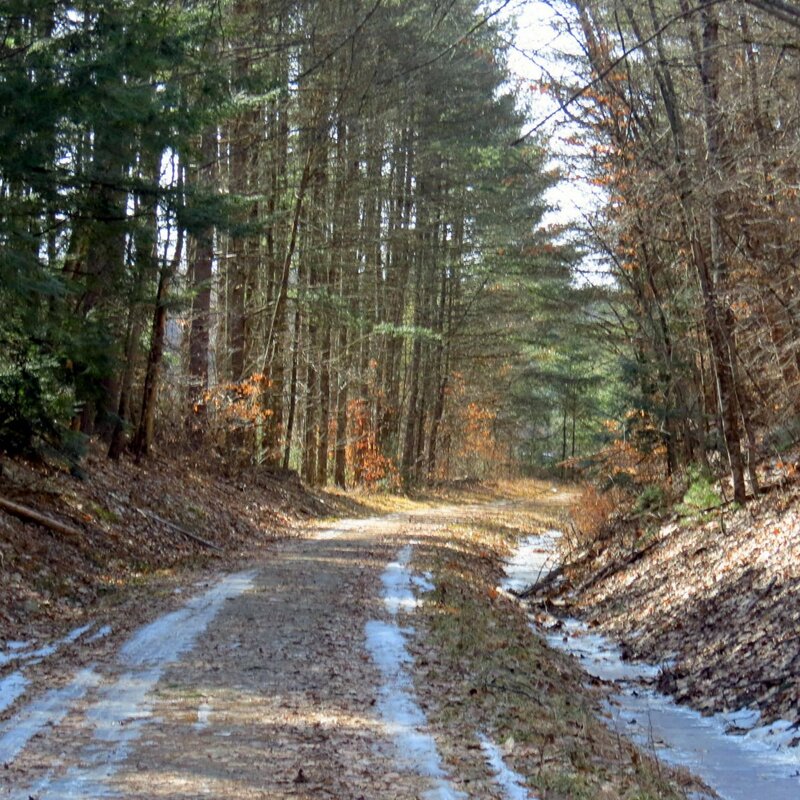 Distances seemed longer and time passed much slower when I was a child and this walk seemed very long indeed, but for the first time I had actually left my town and crossed into another: Swanzey, and that was quite a feat in my opinion. 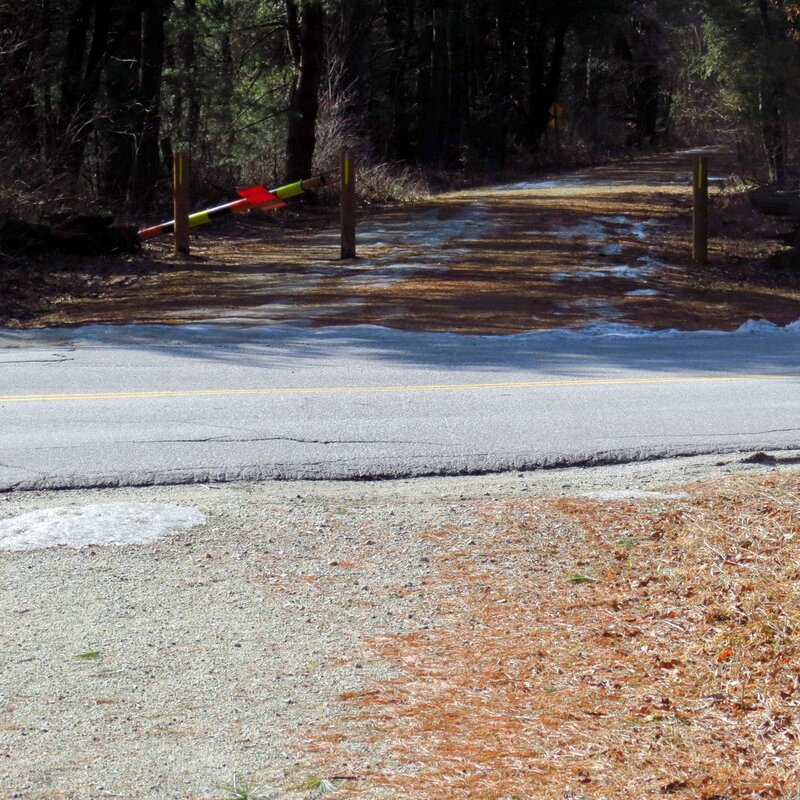 Swanzey lies to the south of Keene and it isn’t very far but I remember feeling so tired that day when I came to this road, and I had the walk home still ahead of me. I could have waited for the Boston and Maine freight and hopped it, but my grandmother told me in graphic detail what can happen to little boys who try to hop on trains. Of course she did that to keep me from hopping the trains I saw creeping by twice a day, and it was very effective. I wanted badly to try, but I never did. So I walked back home dog tired but elated, and as I retraced those steps on this day once again I realized how very lucky I was to have had this place to grow up in; to be able to run and play in the fields and forests along the river, surrounded by and immersed in nature. It was such a glorious life and if I ever had a choice of where and when I could return to it would be that place and that time, because for me there is simply nothing better. I really do hope that all of you have a place that you feel the same about, and I hope you’re lucky enough to be at least able to revisit it occasionally. Santa brought me some Kahtoola Micro Spikes for Christmas this year, so of course I had to try them. 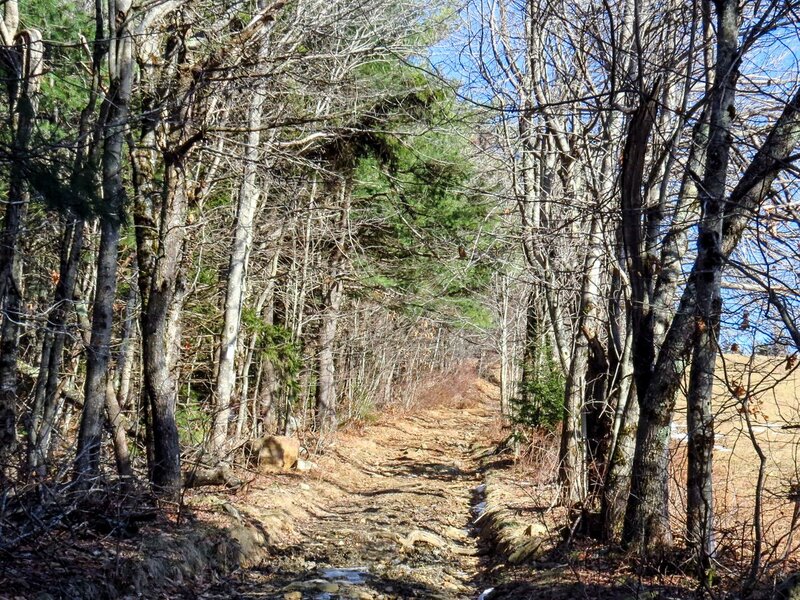 On the day after Christmas I decided that climbing Pitcher Mountain over in Stoddard would be as good a trial as any and as luck would have it the trail was covered in snow and ice. I’ve heard a lot of good things about micro spikes and I have to say that I won’t be without them from now on. I purposely walked over ice with them on and didn’t slip or skid at all. 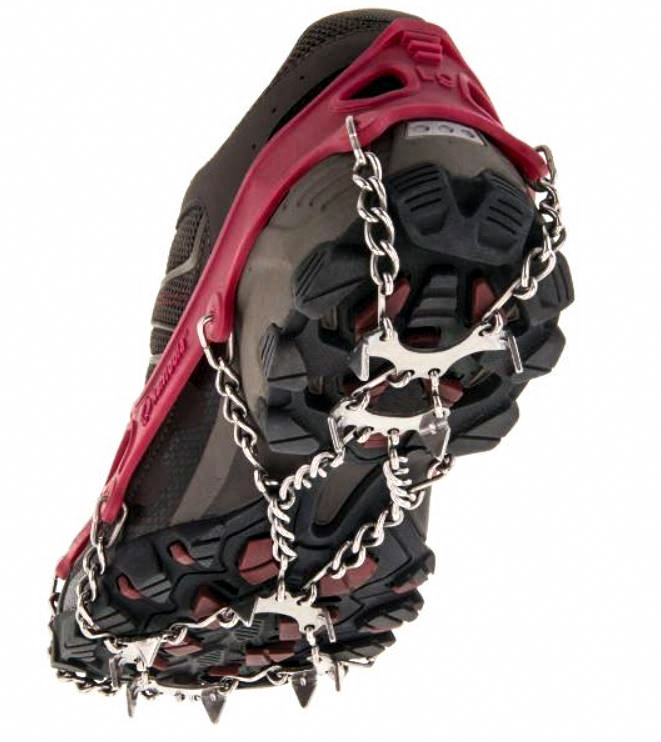 I found this photo online for those who haven’t seen micro spikes. They really grip. The message was a good one but was a little late, I thought. Or maybe it was me who saw it too late. There was quite a pile of wood chips at the base of a dead tree, so I looked up. 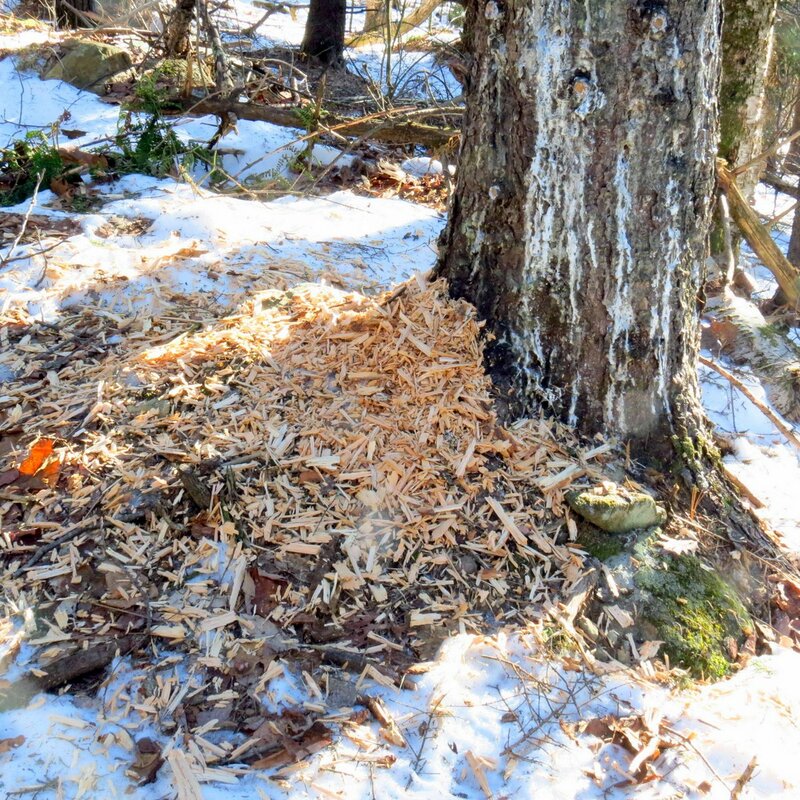 Sure enough a pileated woodpecker had been looking for lunch. 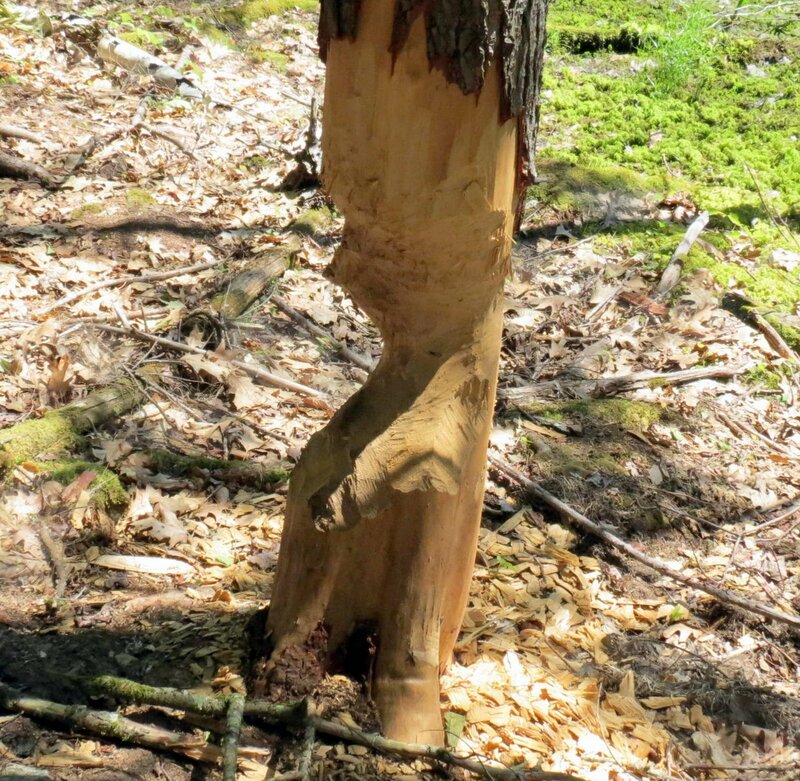 Pileated woodpeckers are our largest woodpecker and you can tell their holes by the more or less rectangular shape. 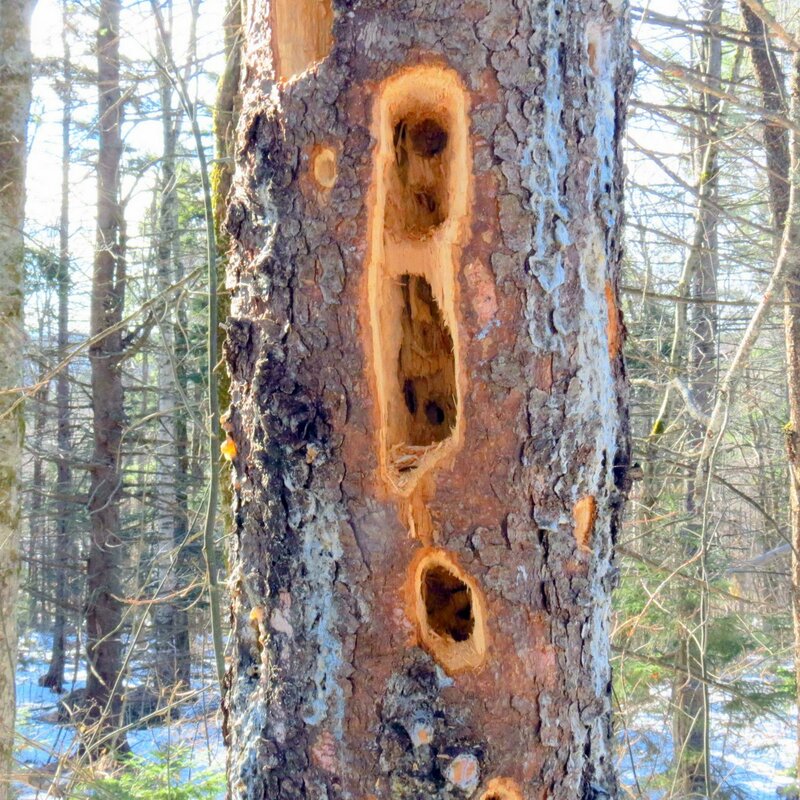 The unusual thing about this was the perfectly round holes made by a smaller woodpecker inside the pileated woodpecker holes. I’ve never seen this before. The smaller bird was smart to let the bigger bird do most of the work. If there are carpenter ants inside they’re usually in the heartwood of the tree. Before you know it you’re at the meadow where Scottish Highland cattle sometimes graze. I didn’t see any on this day though. 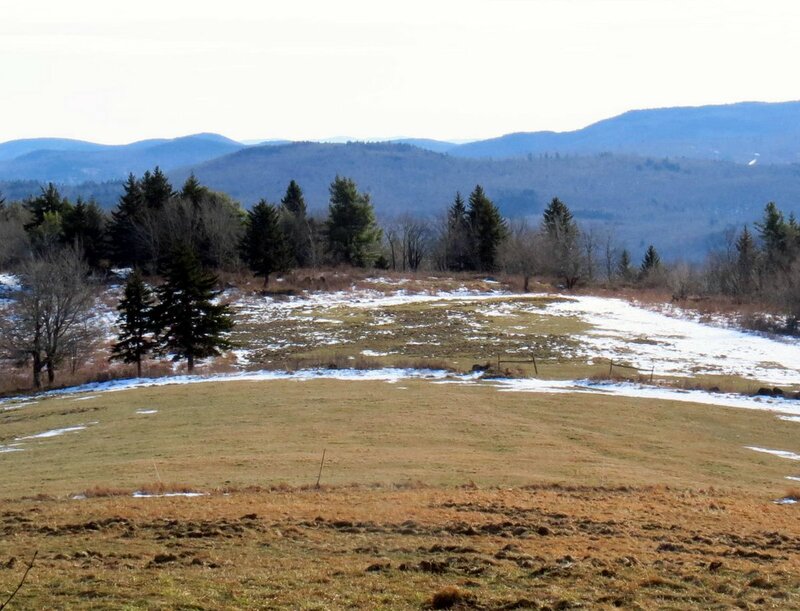 The trail takes a sharp left at the meadow and gets a little steeper. So far legs, lungs and micro spikes were all working well but the snow had melted on this leg of the trail. 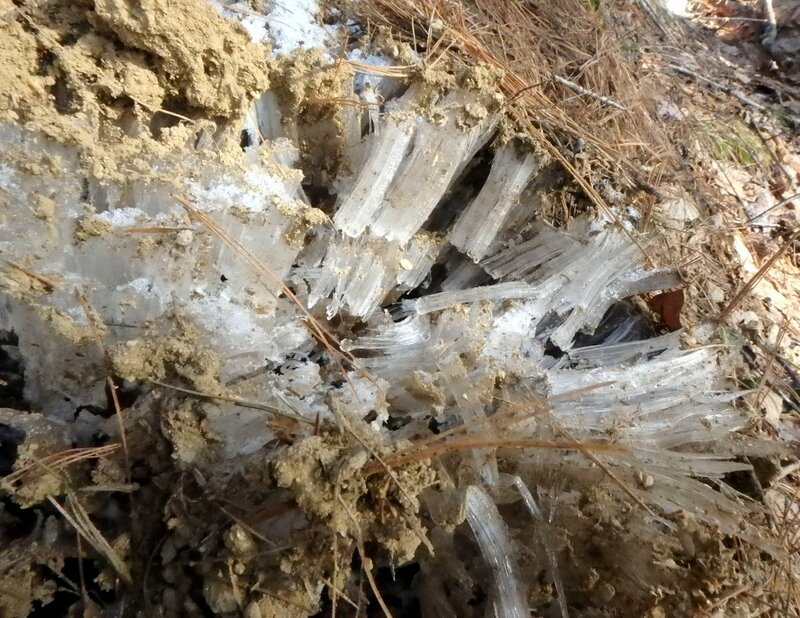 The crunchy, frozen soil told me I was walking on ice needles and there were plenty of them to see. A lot has to happen for these to form but I’ve explained it many times, so I’ll spare you this time. It has to be cold for them to form, with the temperature right at 32 degrees at the soil surface. Air temperature was about 22 degrees F. when I started. 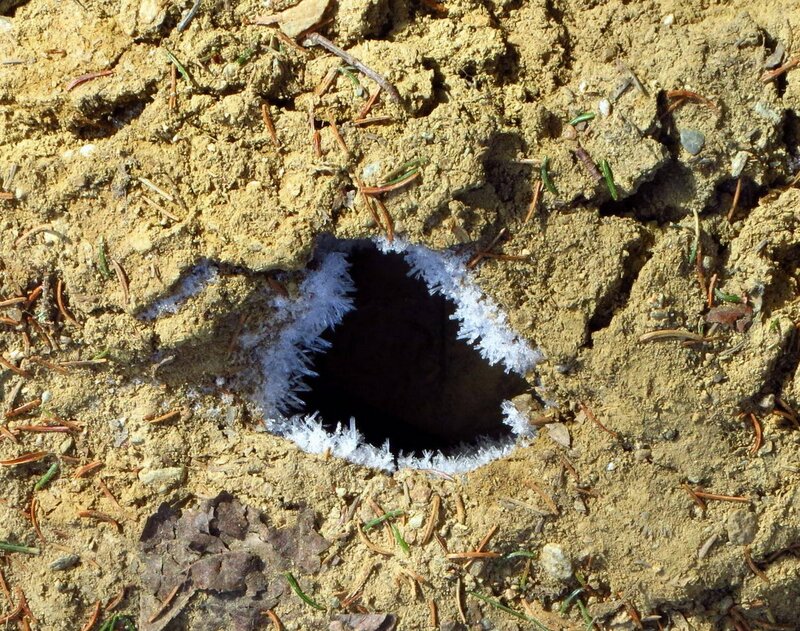 Hoar frost grew around the mouths of chipmunk and snake holes in the soil. The earth’s warm breath meeting the cold air of winter. Stone walls made me think of the Pitcher family, who settled here in the 1700s and most likely built this wall. They gave their name to this mountain. One of my favorite places marks the second sharp left turn along the trail. After essentially living in a forest all of my life wide open places like this one seem almost other worldly. It’s just you, the earth and the sky. Minimalism at its finest. 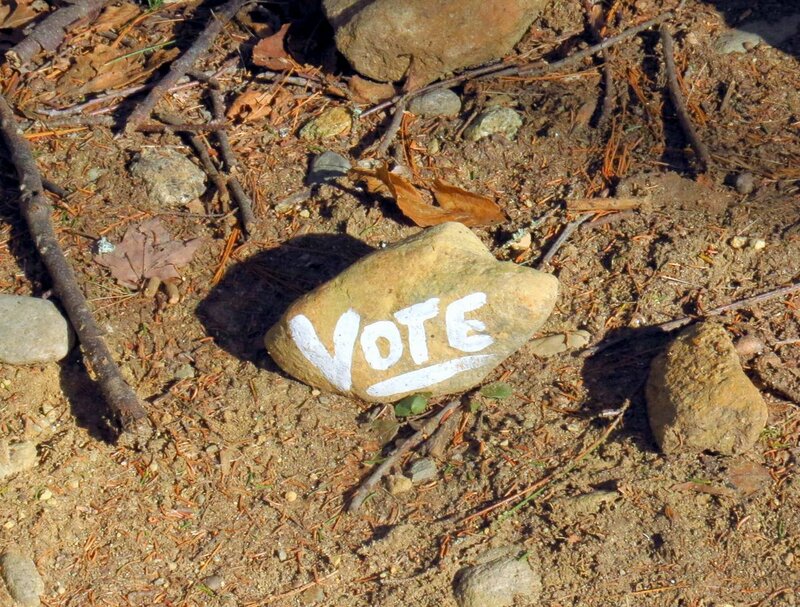 Quite often you’ll find a place where the ground looks like it has heaved up and around stones. 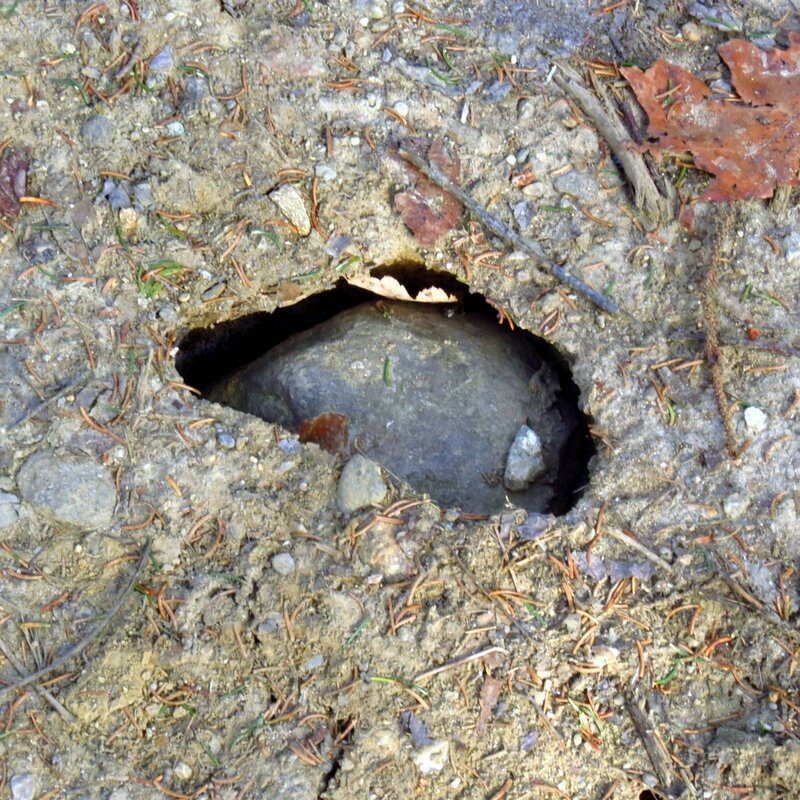 The stone sits at the bottom of a hole that is usually shaped exactly like it is, so it also looks like the sun has heated the stone enough for it to melt down into the frozen soil. I doubt that is the answer though because the sun would heat the surrounding stones as well, but they haven’t melted into the soil. I think the ground must have heaved up and lifted all the soil and smaller stones that surrounded the bigger one. 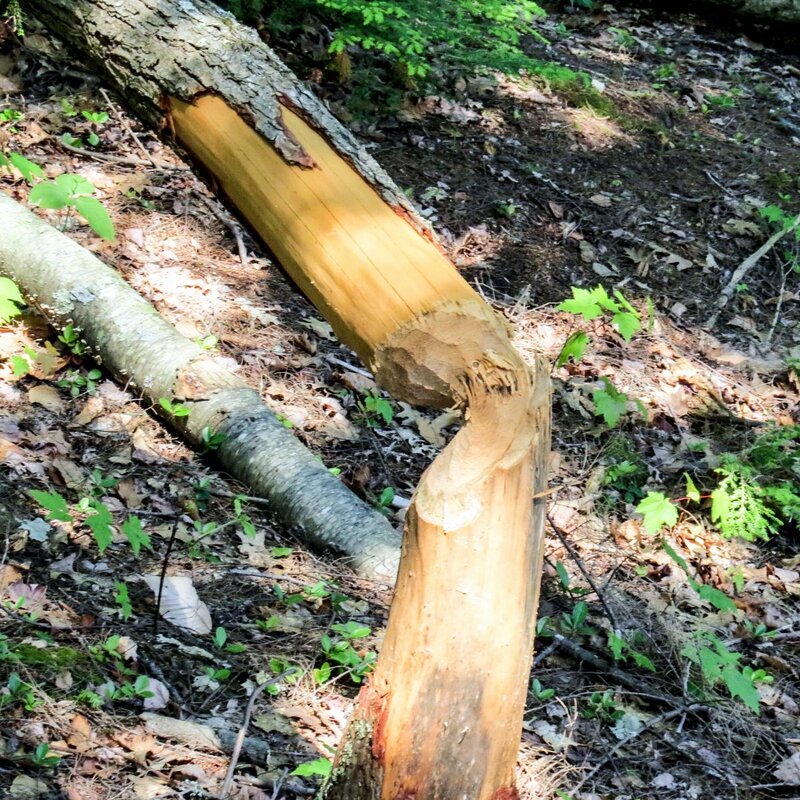 I saw that this had happened in several places along the trail. The inner bark of staghorn sumac is sometimes brightly colored like the thin strip at the top of this piece, which my color finding software tells me is coral and salmon pink along with a little orange. I saw that colorful strip and peeled the section of bark it was on. I was surprised to see that the inner bark still attached to the wood was Indian red, dark salmon pink, and a lot of sienna. Why this bark colors like this when the tree dies, I don’t know. When bark is removed from a tree, as long as the tree isn’t girdled it will live and try to heal itself, but I’ve been watching this young staghorn sumac for a few years and it hasn’t healed at all. 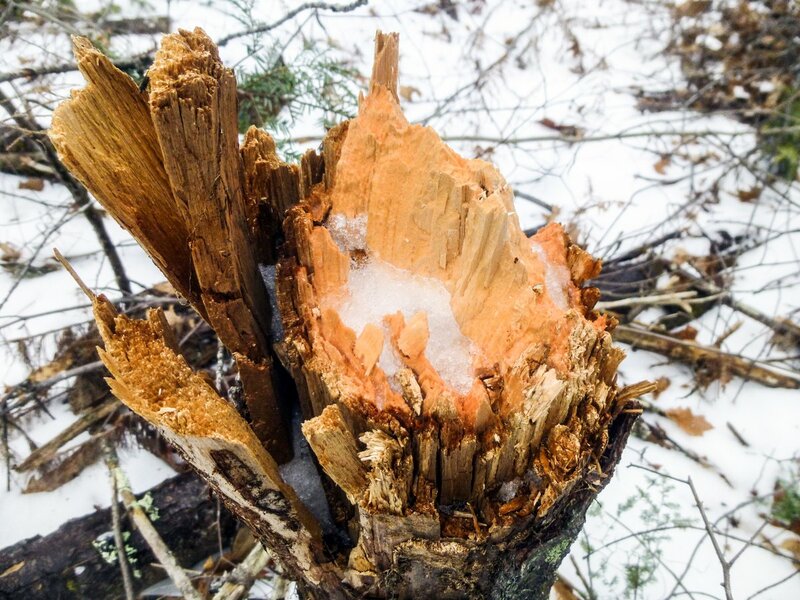 I think that’s because deer are using it to rub their antlers on, because the wound on the tree is always fresh. 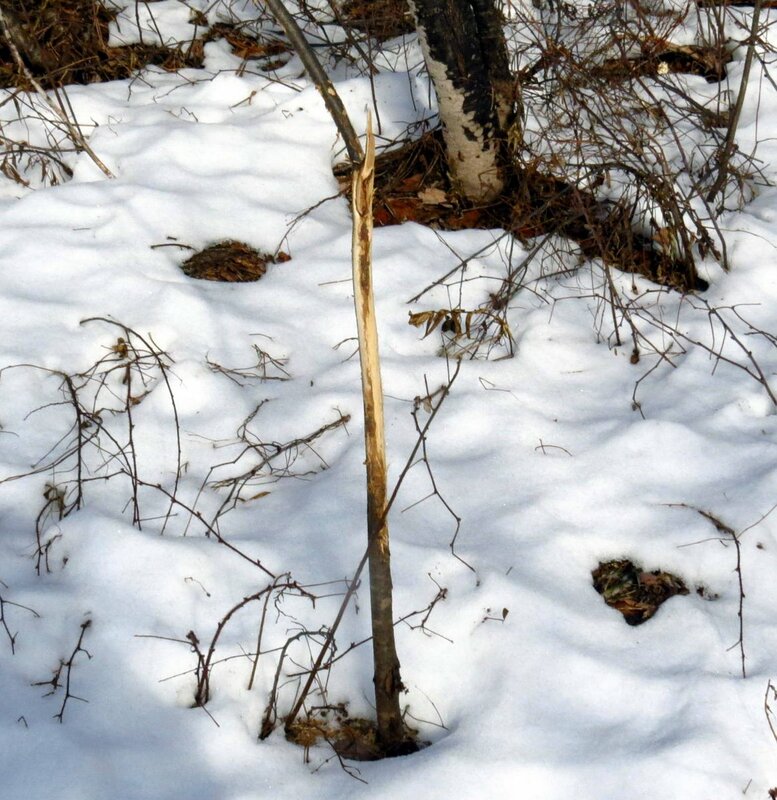 Male white tail deer, called bucks, rub their antlers on trees for different reasons, but it seems fitting that they would choose a staghorn sumac. Staghorn sumacs get that name because of the hairs all along their stems that resemble the velvet on a stag’s antlers. Maybe this deer thought he was fencing with another deer. 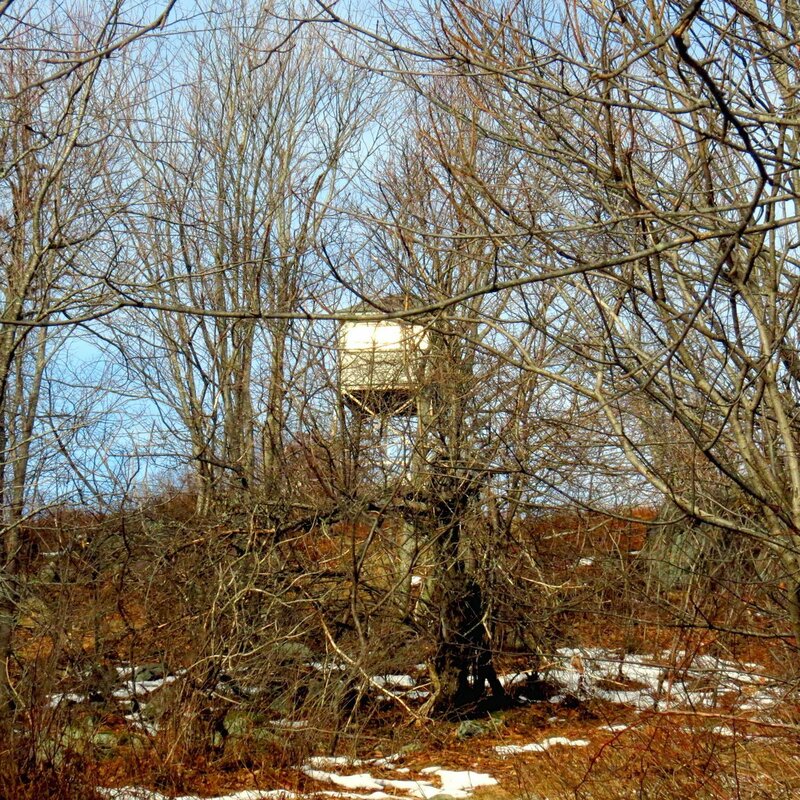 You can get a glimpse of the fire tower through the trees in some spots. The sunshine was glaring off the windows on this day. 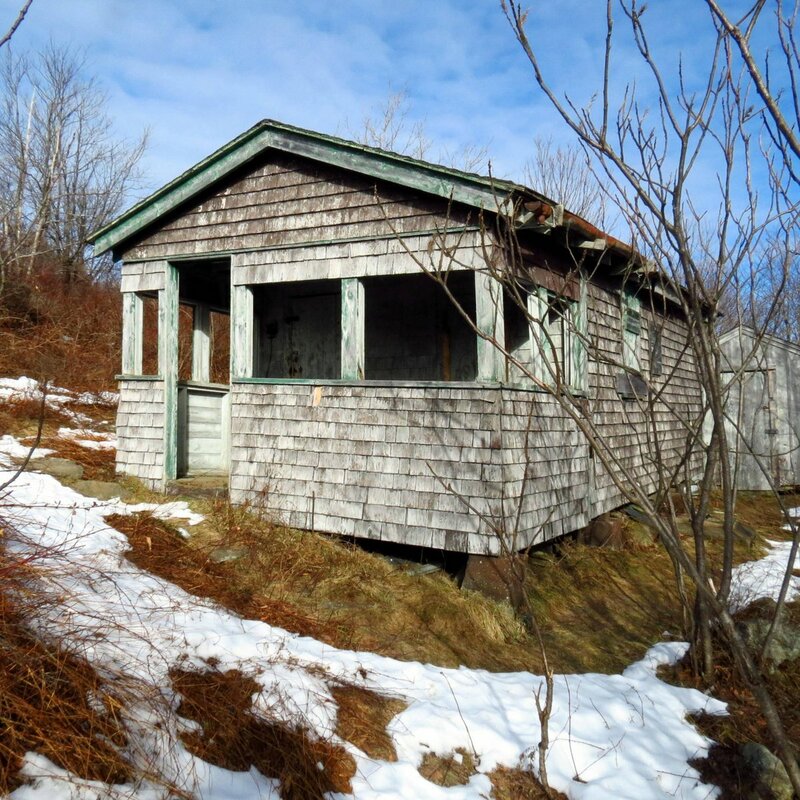 The old ranger cabin is having a relatively easy winter so far but I’m sure it has seen winters up here when the snow almost buried it. The concrete piers and blocks it rests on have all shifted and I wonder how much longer it will be able to resist the pull of gravity. I wouldn’t be surprised to climb up here one day and find that it had tumbled down the mountainside. The fire tower must be manned at some point during the year but I’ve only seen people in it once out of all the times I’ve been up here. There were a lot of people up here that day and they all wanted to get into the tower, so I passed on it. 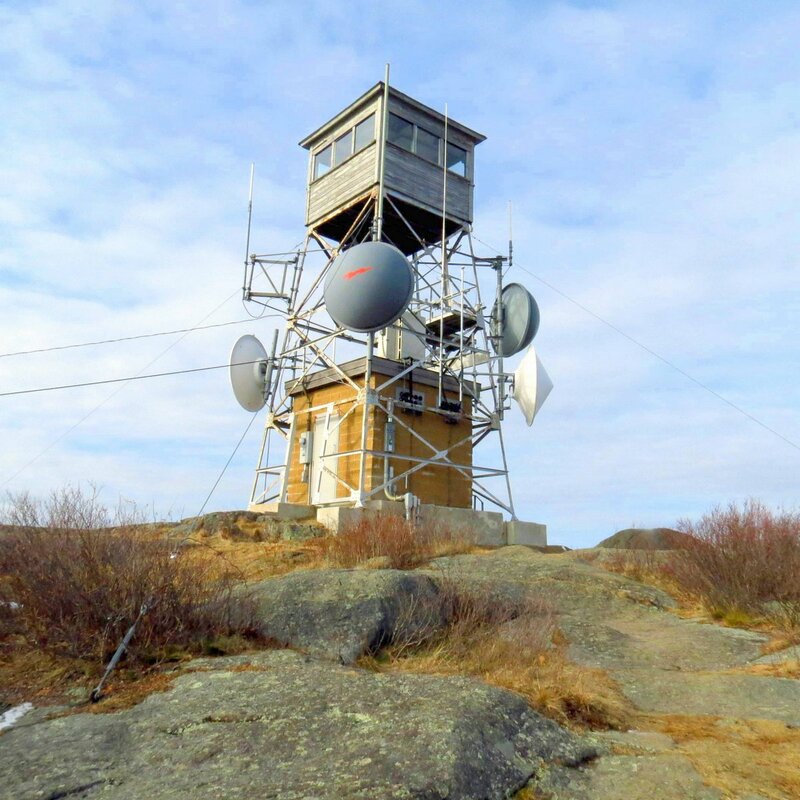 It can be very windy up here so the tower is tied down to the bedrock by steel cables. The tie down shown was used for the original tower, which burned in 1940 in one of the worst forest fires this state has ever seen. 27,000 acres burned, including all the trees on this summit. The views weren’t too bad but it was windy and that made it feel colder so I didn’t stay long. I liked this view because you could see how snowy the distant hills were. 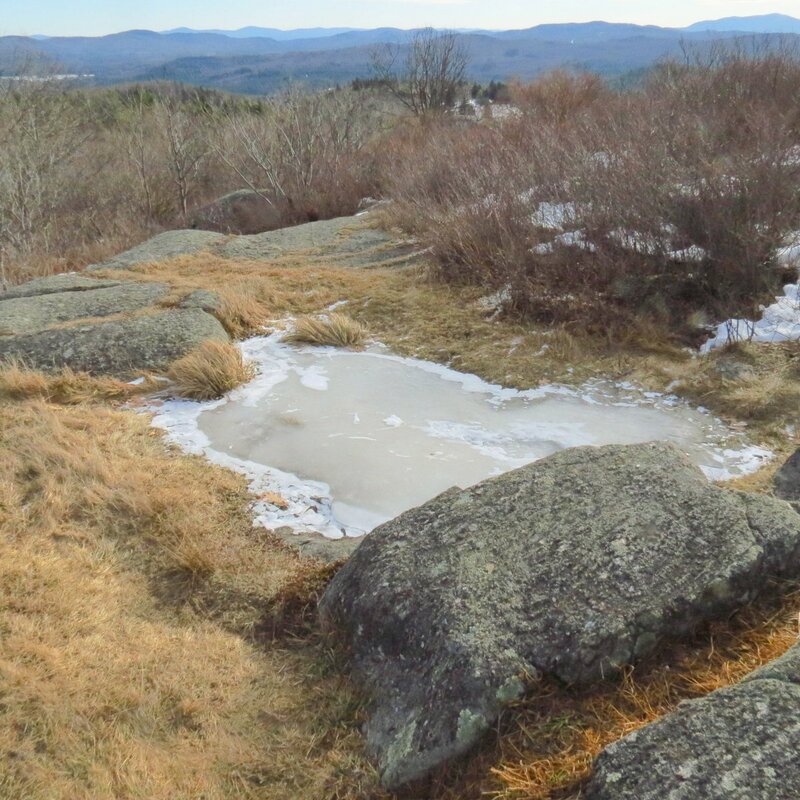 There was ice on the summit but I didn’t worry about slipping with the micros spikes on. They even seem to make walking on uneven stones easier. 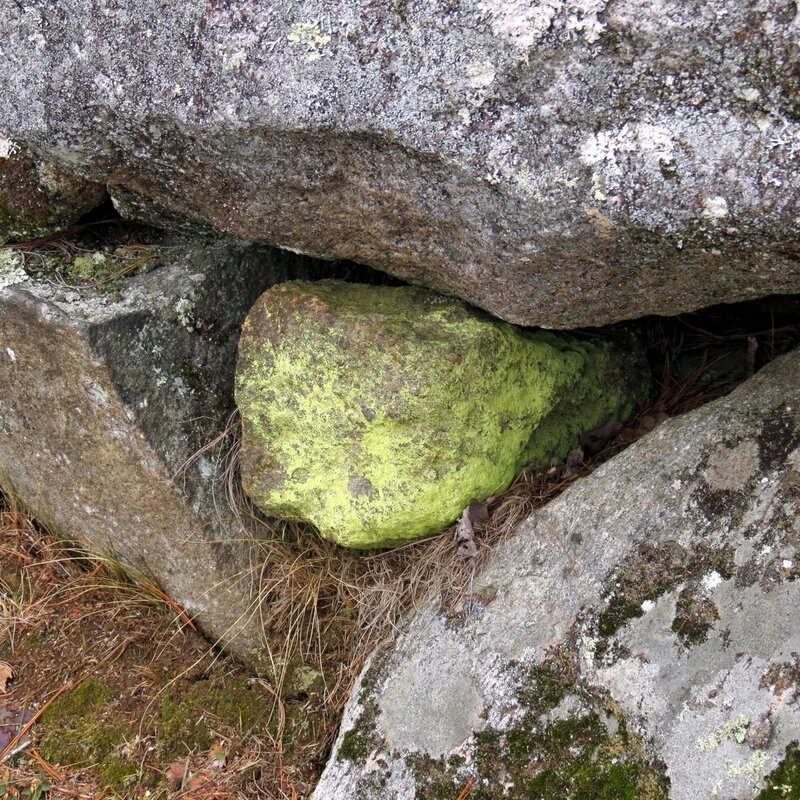 A close look at the bedrock on the summit shows that it is almost entirely covered by lichens. 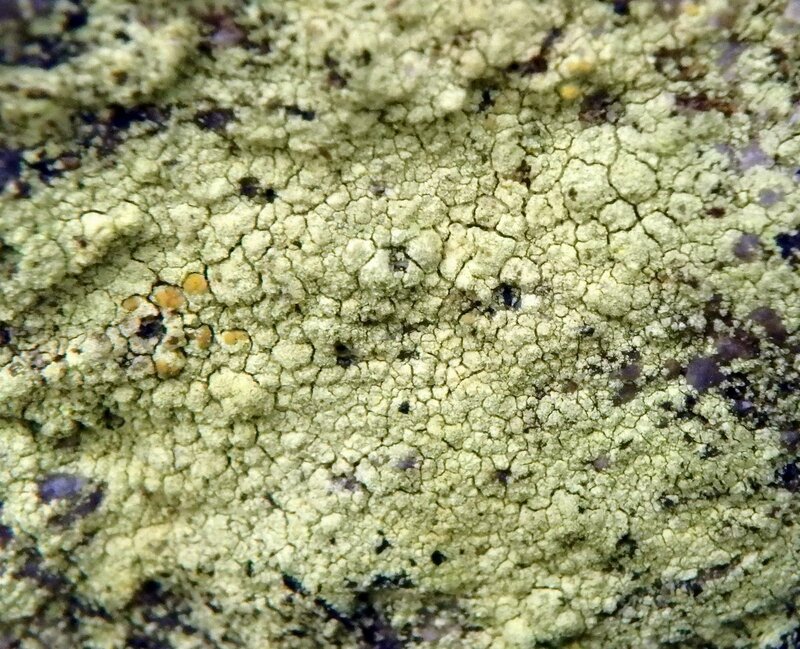 One of my favorite lichens that grow here is the common goldspeck lichen (Candelariella vitellina.) 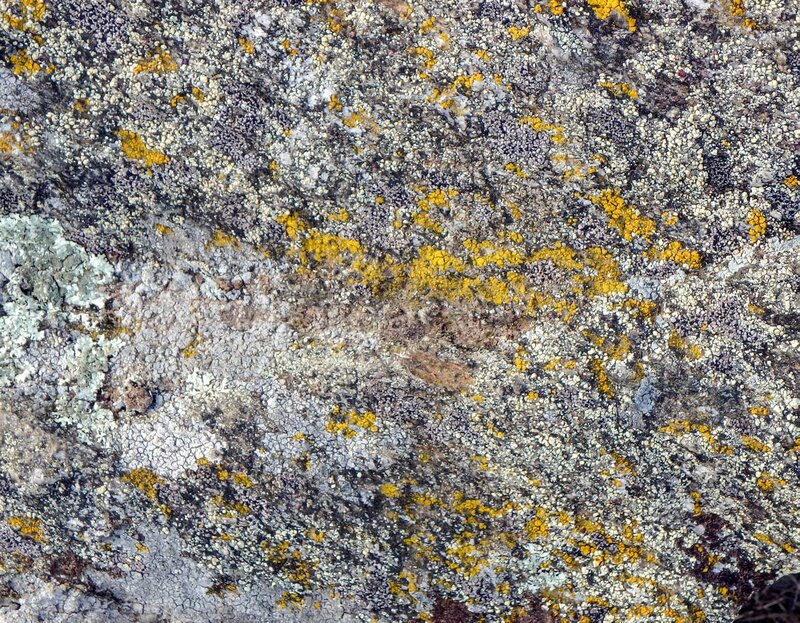 This pretty lichen contains a yellow pigment called calysin and it was once used to dye wool yellow in Sweden. How they ever got it off the stones, I don’t know. Two of my great loves are history and botany and one of the best ways I know of to get a good dose of both is by following stone walls. 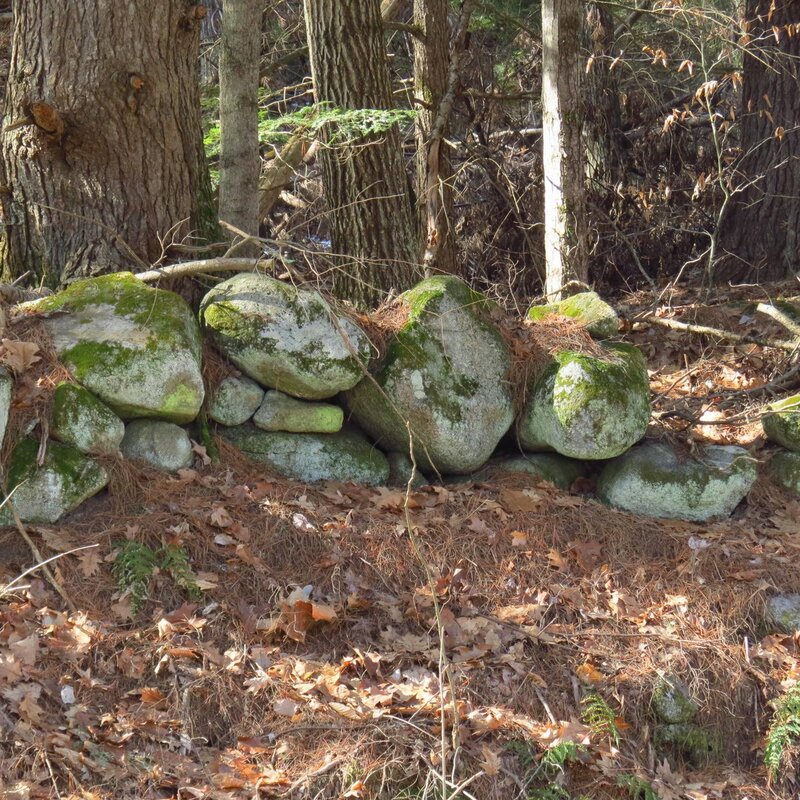 This particular wall is in Swanzey, New Hampshire and surrounds what I believe is the oldest cemetery in town. Revolutionary war soldiers are buried here so it certainly has some age. 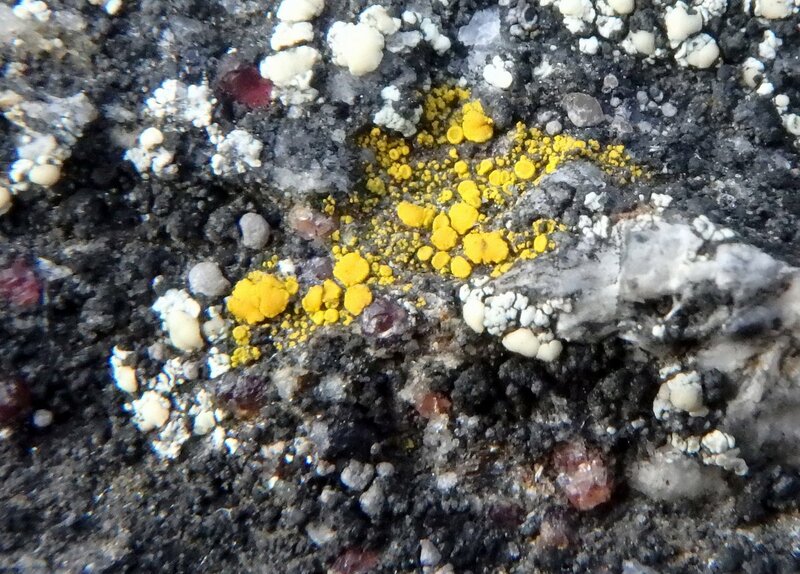 Right off I spotted some sulfur dust lichen (Chrysothrix chlorina.) It’s very yellow and hides under overhangs so it doesn’t get rained on. At least I think that’s why I always find it tucked away like this, but this is odd behavior for a lichen because they usually like a lot of rain and sunshine. Sulfur dust lichens are kind of granular in texture. If you’re lucky you can sometimes find them with fruiting bodies (apothecia) but more often than not I see them when they aren’t producing spores. There are stone walls called “lace walls” which are built of a stack of stones just one stone wide, and which are full of holes that make them look like lace, but this is a tossed wall sometimes three or four stones wide and it was built to keep animals, probably sheep, out. There were no holes when it was built but there are now, as this photo shows. I can’t explain how it happened but I’ve built enough dry stone walls to know that building a hole like this one into a tossed wall would be close to impossible. In a tossed wall the stones are literally just tossed on top of one another. The object wasn’t to build a pretty wall; it was to get rid of the stones as quickly and efficiently as possible. I think a stone must have fallen or been taken out of the wall to create such a hole. 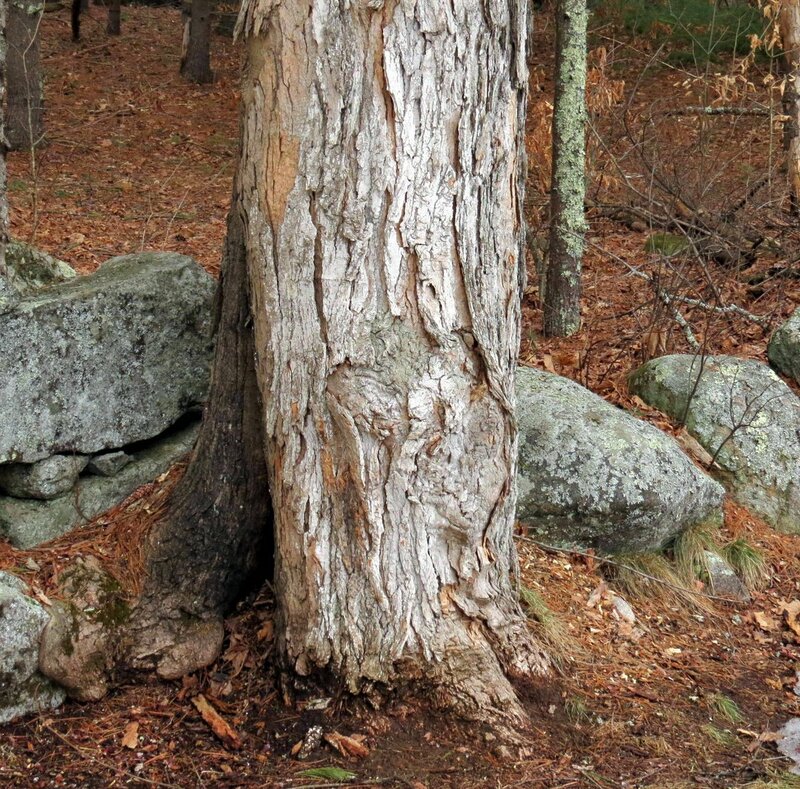 There are a lot of tree stumps along the wall and some of them, like the one above, are very old. Not only was this one covered with moss and lichens, it also had birch trees growing out of it. 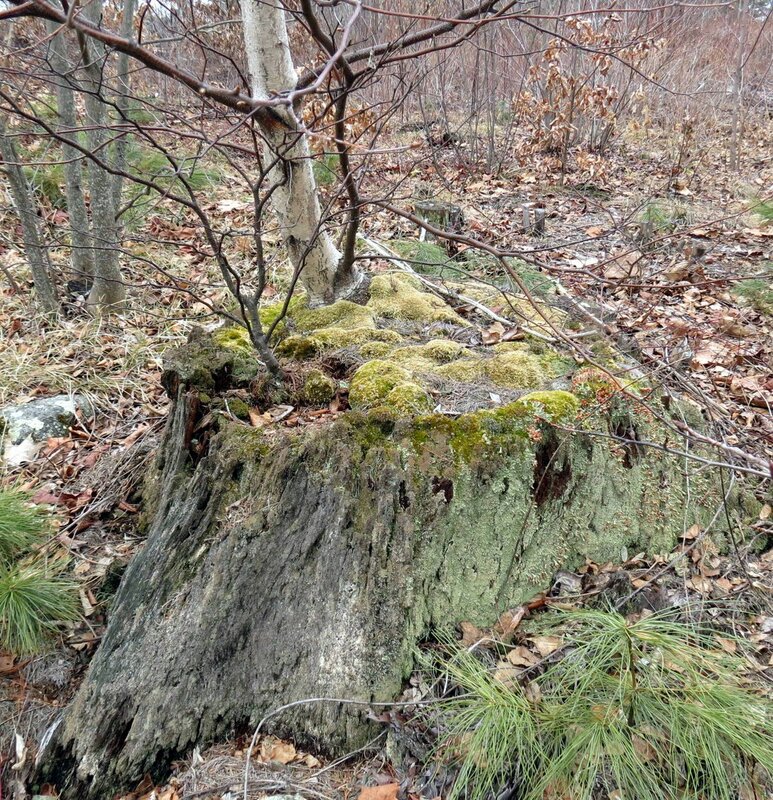 Stumps like this are always worth a second look. The old stump had more British soldier lichens (Cladonia cristatella) growing on it than I’ve ever seen in one place. Old rotted logs and stumps are the perfect spots to find them. 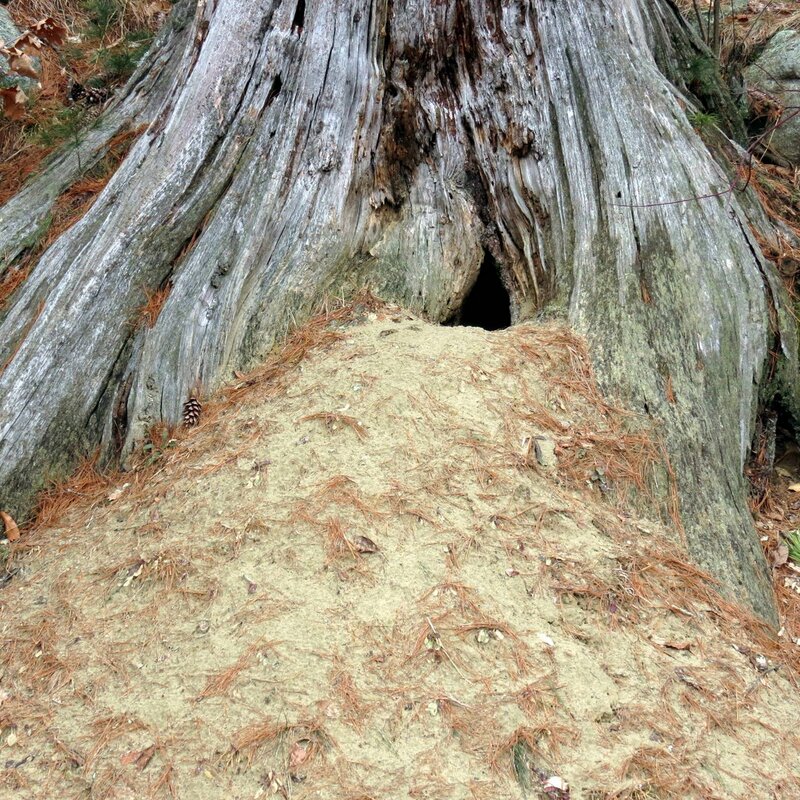 A large pile of sand at the base of another hollow tree stump meant that something was living under it. Possibly a ground hog, but I didn’t see a single paw print. 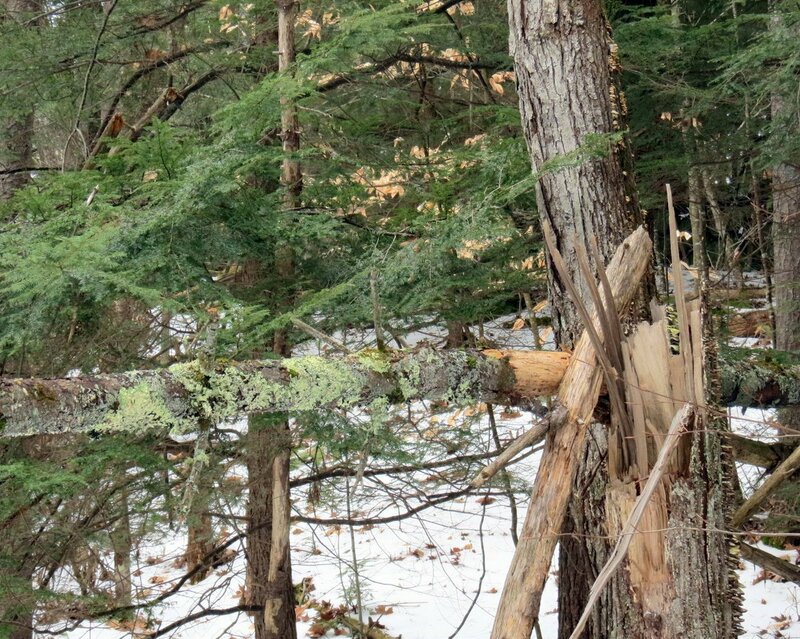 This old maple tree was covered on its sunny side by whitewash lichen (Phlyctis argena.) 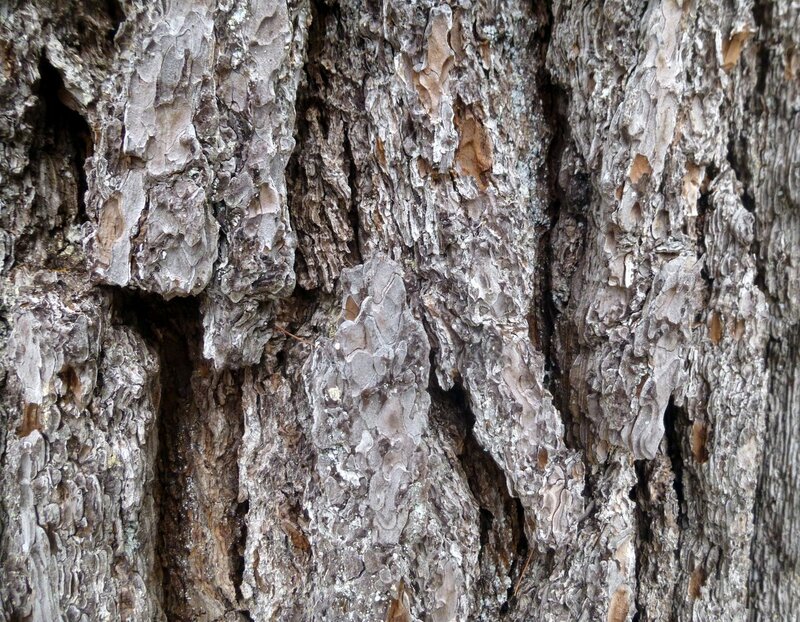 This is a tough, crusty lichen that is fairly common on hardwood tree bark. They can cover quite a large area and make the tree look as if it has been painted, hence the common name. 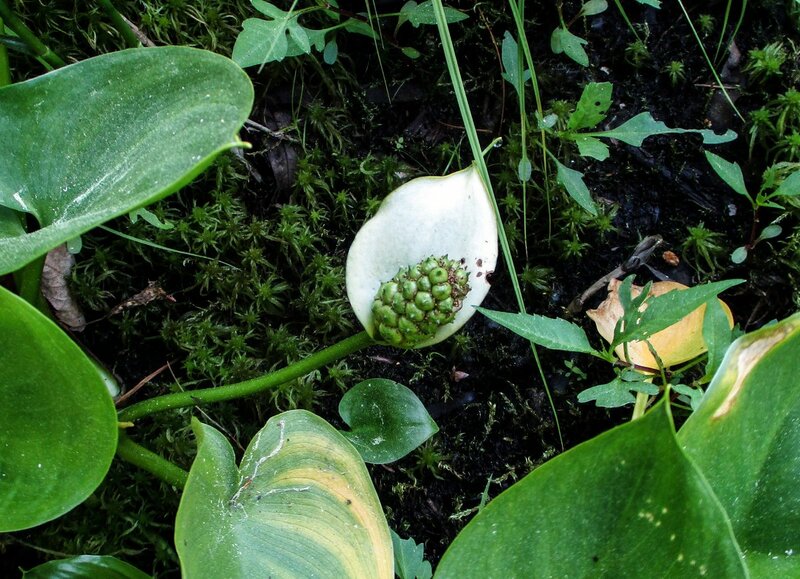 They can be greenish white, silvery, or bright white. As time passed barbed wire was often added to stone walls to keep animals in or out. 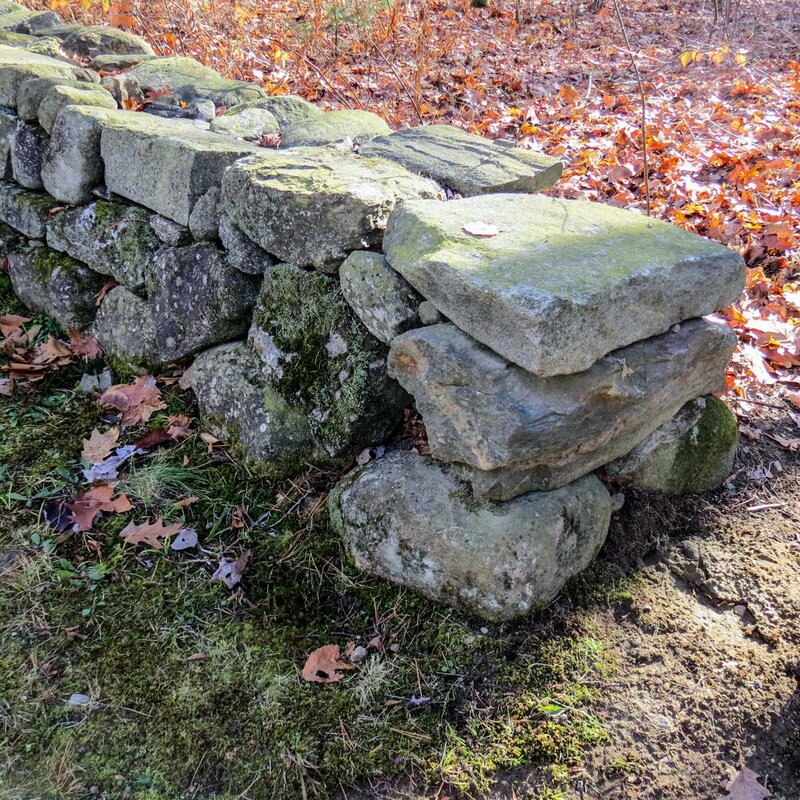 Stone walls were usually too low to be effective and cows and other farm animals often jumped right over them, so their height was increased by adding wire or other materials. You had to pay a fine if your animals escaped and were caught roaming free. They were brought to the town pound and the owner had to pay to get them back. 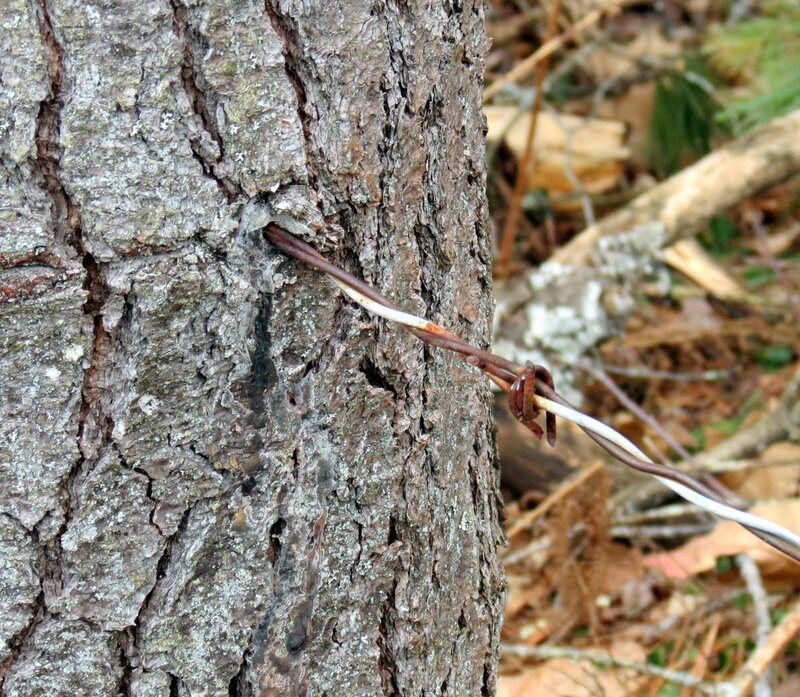 This wire grew out of the very center of a pine tree, so it has been here for quite a while. 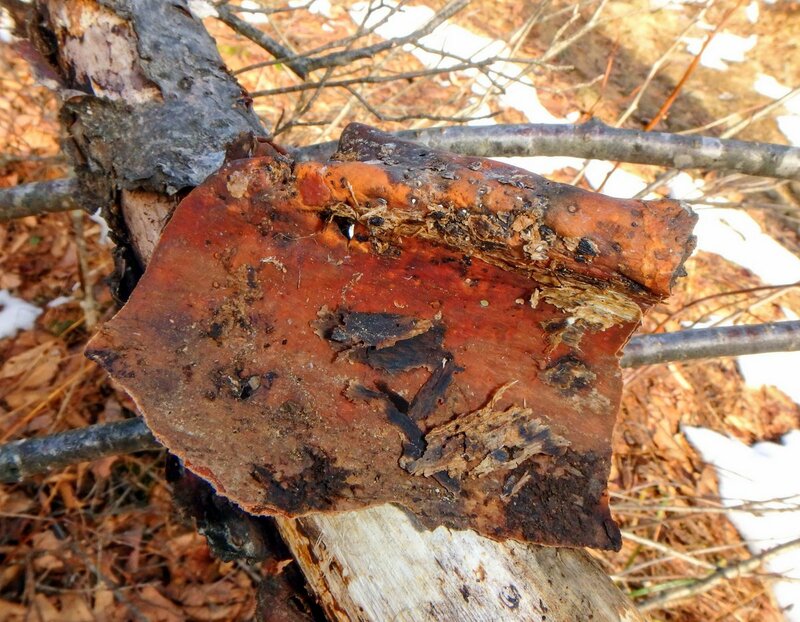 Running their saw into steel wire is one of a wood cutter’s worst nightmares come true but many things have been found inside trees, from axe heads to gravestones to even bicycles. 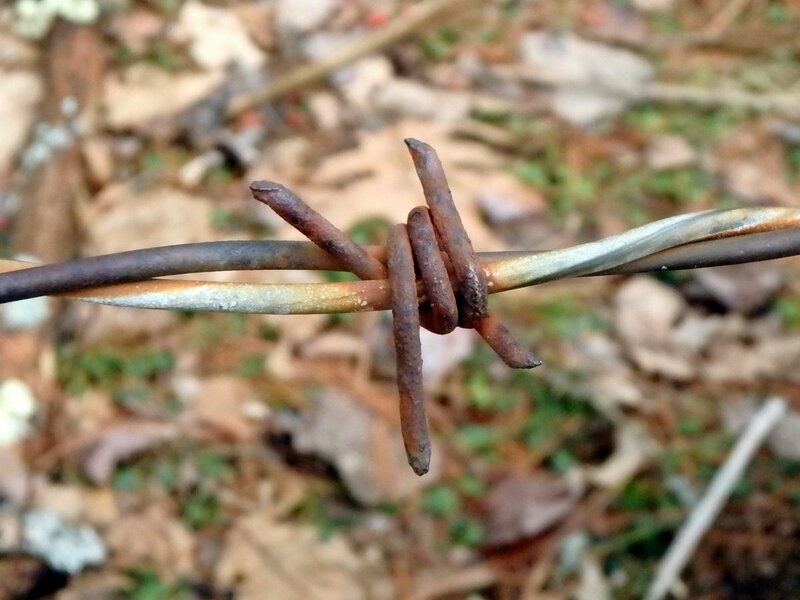 Every time I see rusty old barbed wire stapled to a tree I think about a book I read by a man who lived in a cabin in the Massachusetts woods. He said that one of his favorite things to do was run through the woods at night. He wouldn’t want to do that here. 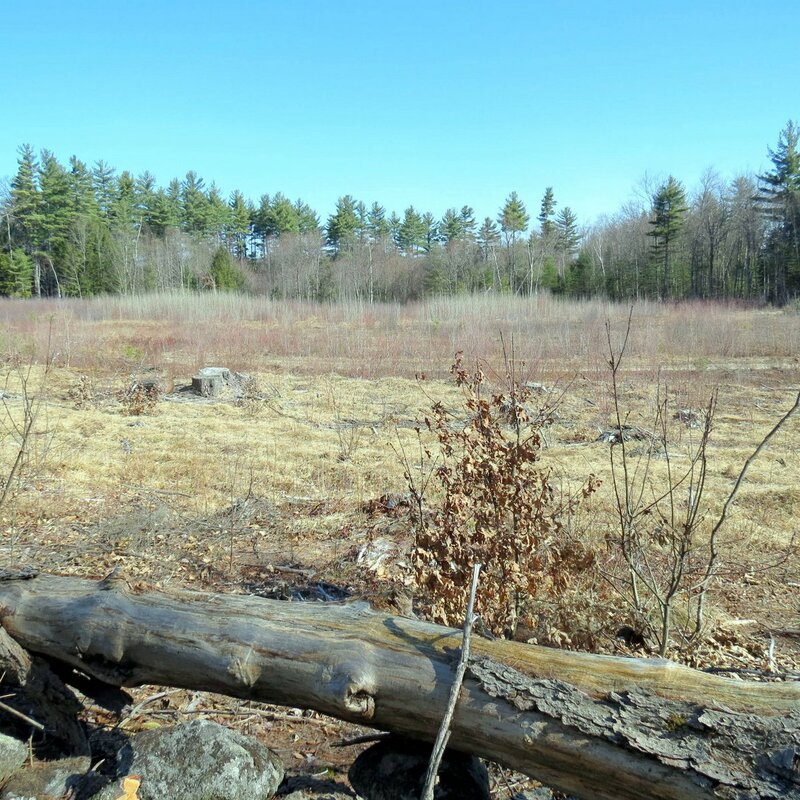 I wouldn’t even run through these woods in broad daylight because much of what is now forest was once pasture, and there is a lot of barbed wire out there. Peppered rock shield lichen (Xanthoparmelia conspersa) likes to grow on stone in full sun and I find a lot of them on stone walls. They’re a good introduction to lichen study because their brown apothecia, where their spores are produced, are large and easy to see without aid. 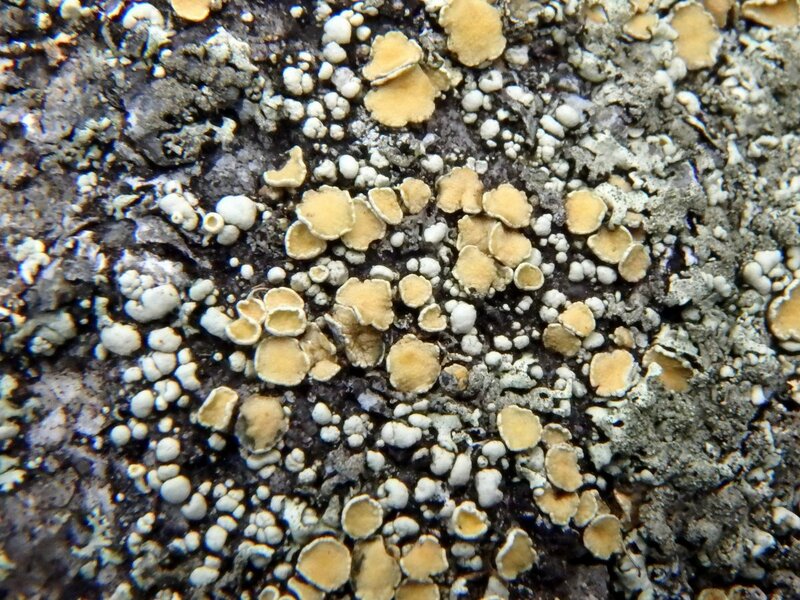 Scattered rock posy lichens (Rhizoplaca subdiscrepans) on the other hand, are quite small and difficult to see without magnification, but it’s worth looking for them because they almost always have their bright orange apothecia showing. They like to grow on stone, especially granite, in full sun. 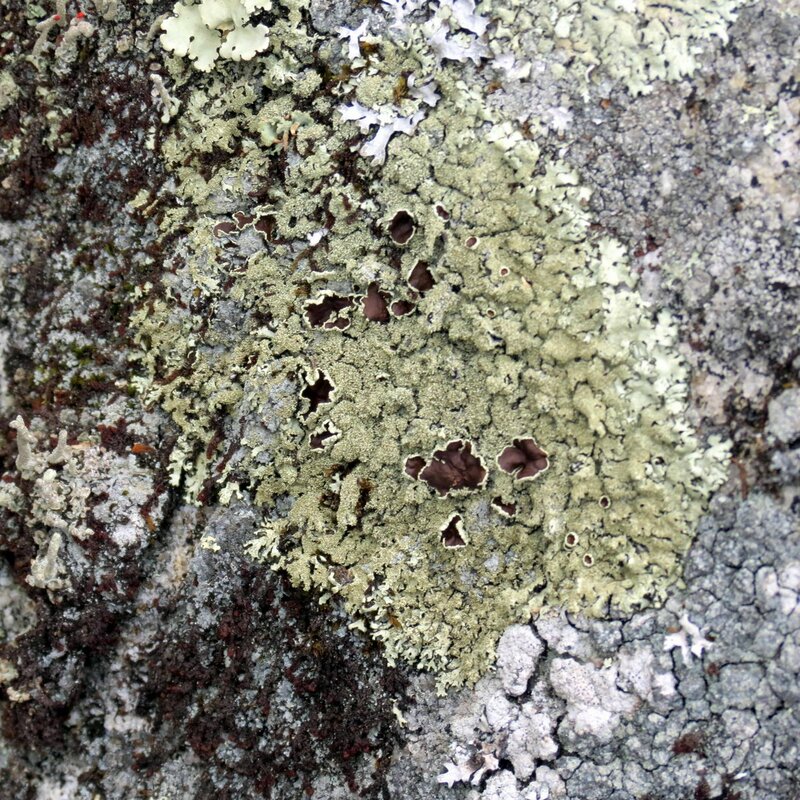 They don’t seem to change their color when they dry out like many other lichens do. 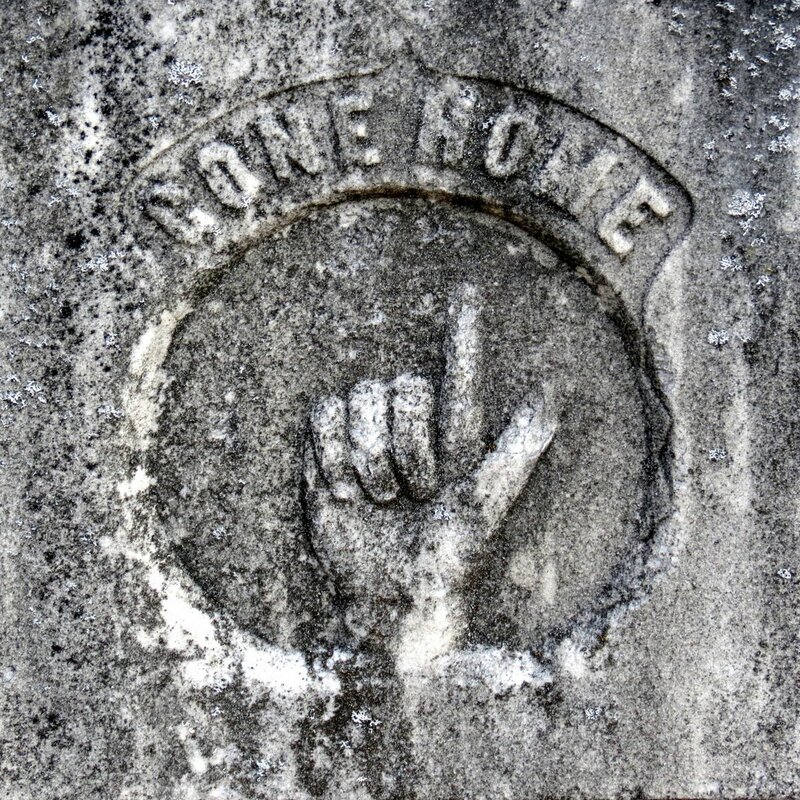 Sometimes it isn’t what is on the stone that interests me, it’s the stone itself. I’m not sure if this pattern was on the stone or part of it but it was very interesting. Also interesting was how it had absolutely nothing growing on it when all of the stones around it had mosses and lichens growing on them. 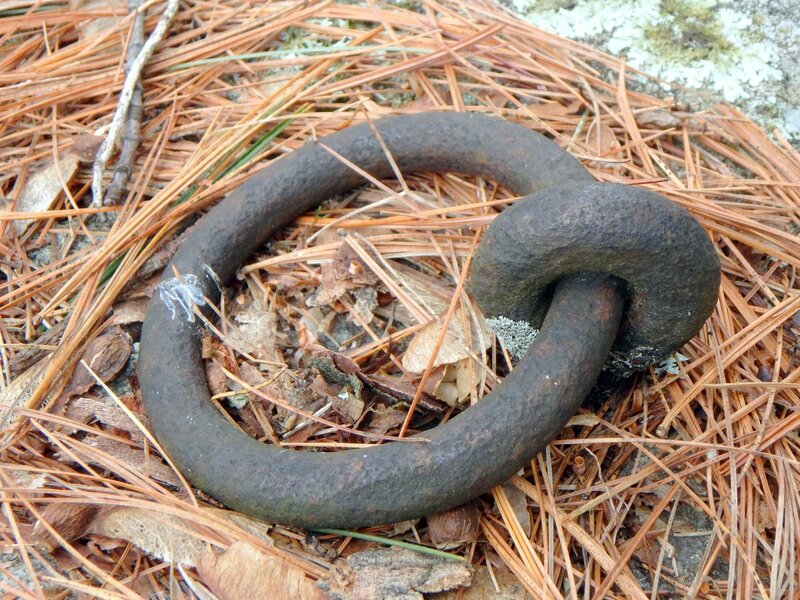 I never knew my grandfather but I do know that he made his living as the town blacksmith in Westmoreland, New Hampshire, and this old horse hitching ring brought thoughts of him to mind. If he was lucky a blacksmith might make a dollar a day but very little cash changed hands in colonial America so he most likely would have been paid in food, charcoal for the forge, lumber, or something else he needed. In the early 1800s blacksmiths charged anywhere from 2 cents for an axe wedge to $5.50 for all of the ironwork on a new wagon. That would include springs, axles, brakes, and rims for the wheels. I have a photo of my grandfather working on a wagon wheel in his blacksmith shop. The wheel sits on top of a big wooden keg that he probably made the iron hoops for. I hope he was paid more than they were in colonial times. 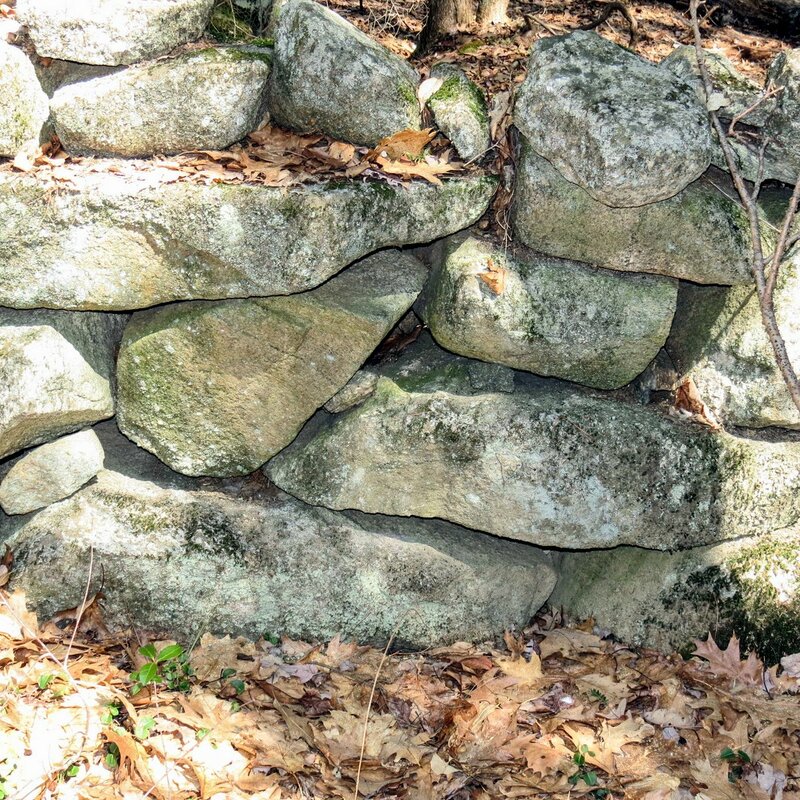 Some of the stones in this old wall are not natural, meaning they were cut or quarried. There is a large granite outcrop just up the hill from this spot and stone was taken from it using star drills and sledge hammers, I would imagine. 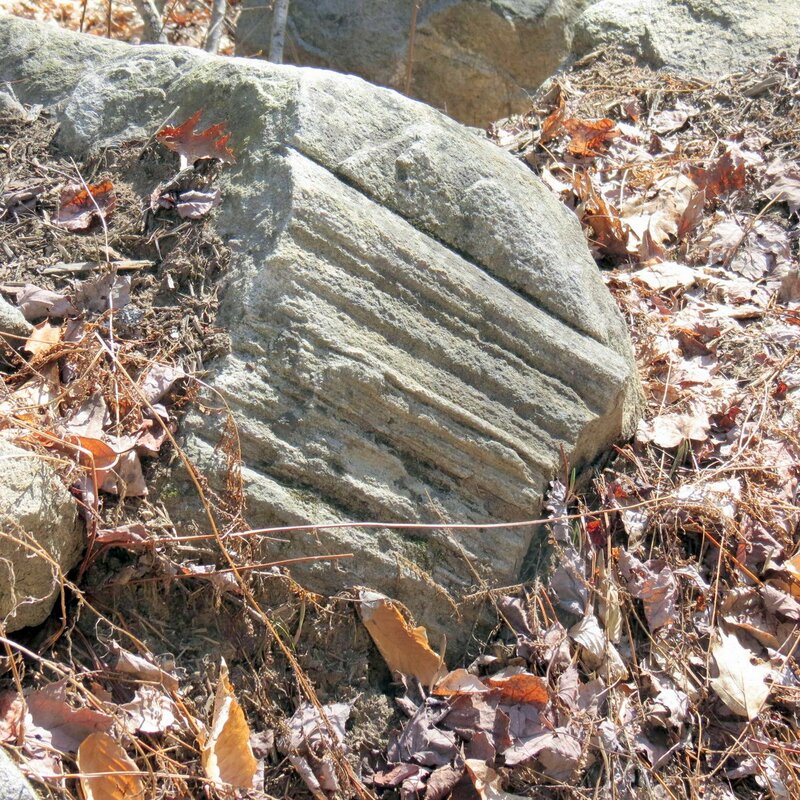 The marks of the old hand drills are still easily seen on some of the stones. 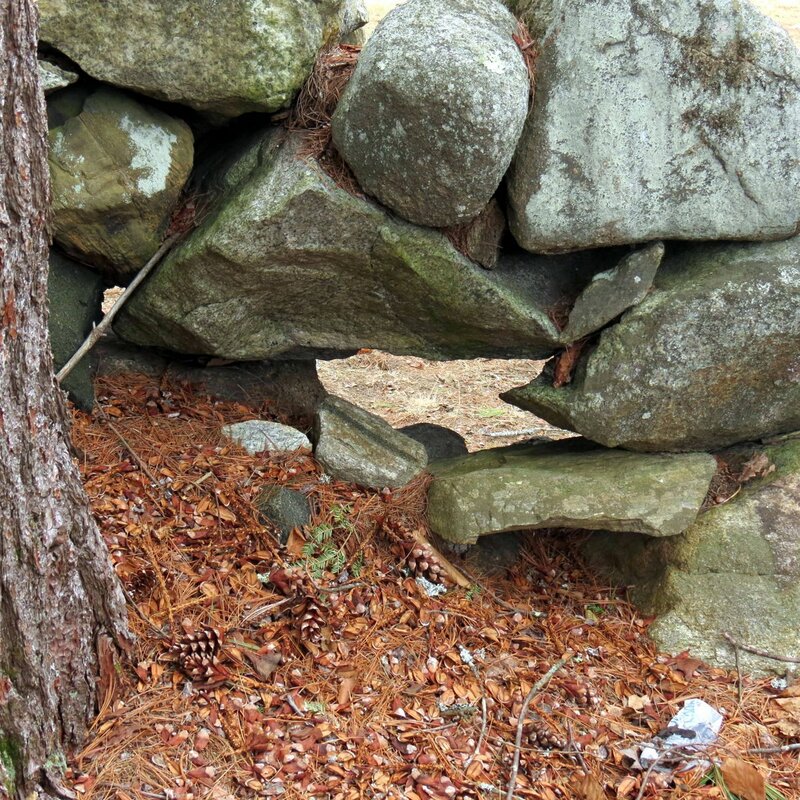 It’s unusual to see both natural and cut stones together in a wall; usually they’re made of one or the other but the farmer could have been trying to increase the height of his walls. 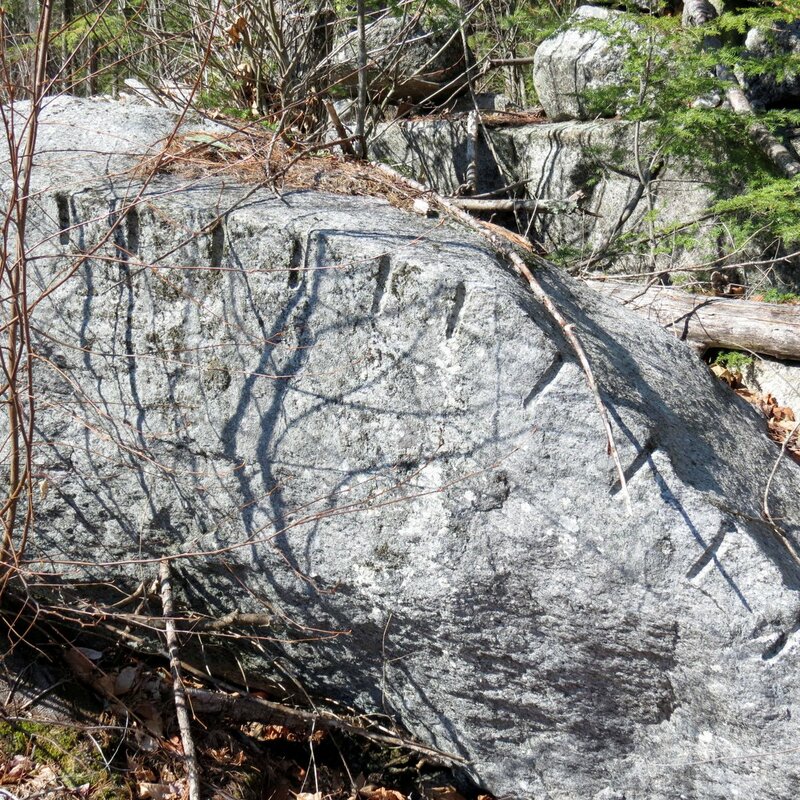 Some of the quarried granite was used for fence posts. 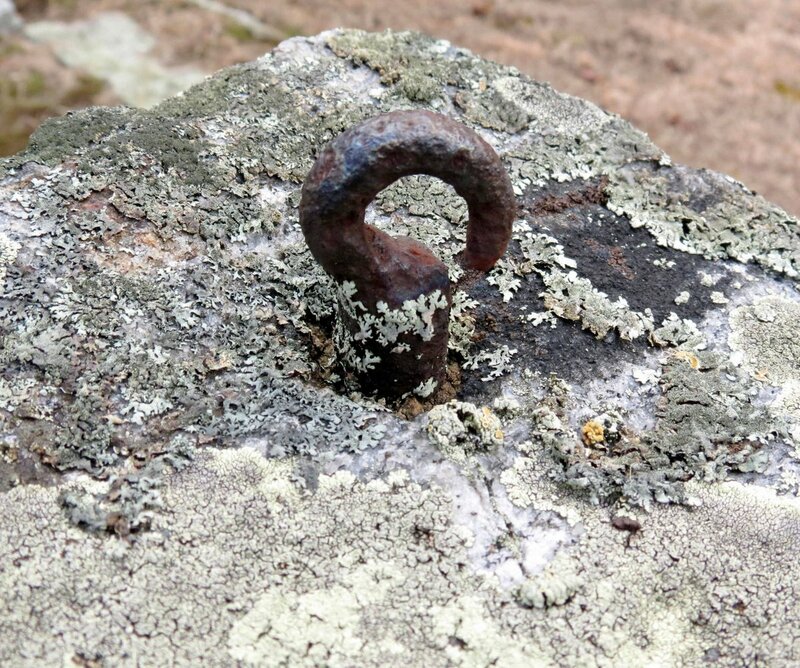 Four posts were put in around certain family plots in the cemetery and chain hooks were added by drilling a hole into the top of each post and hammering a hook into the hole. 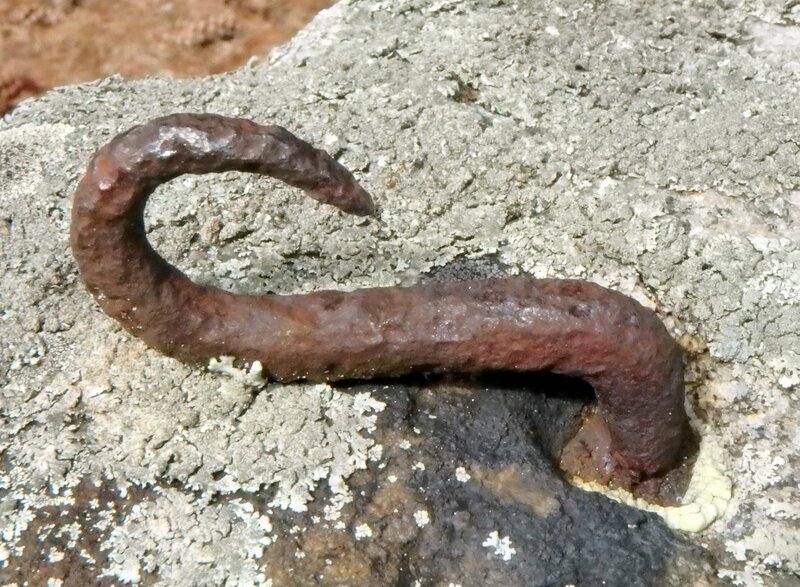 I’m not sure if friction alone held the hooks in the holes or if cement was added to hold them, but after over 200 years they are still solid and immovable. Once chain was added the family plot was enclosed but still visible to anyone trying to find it. 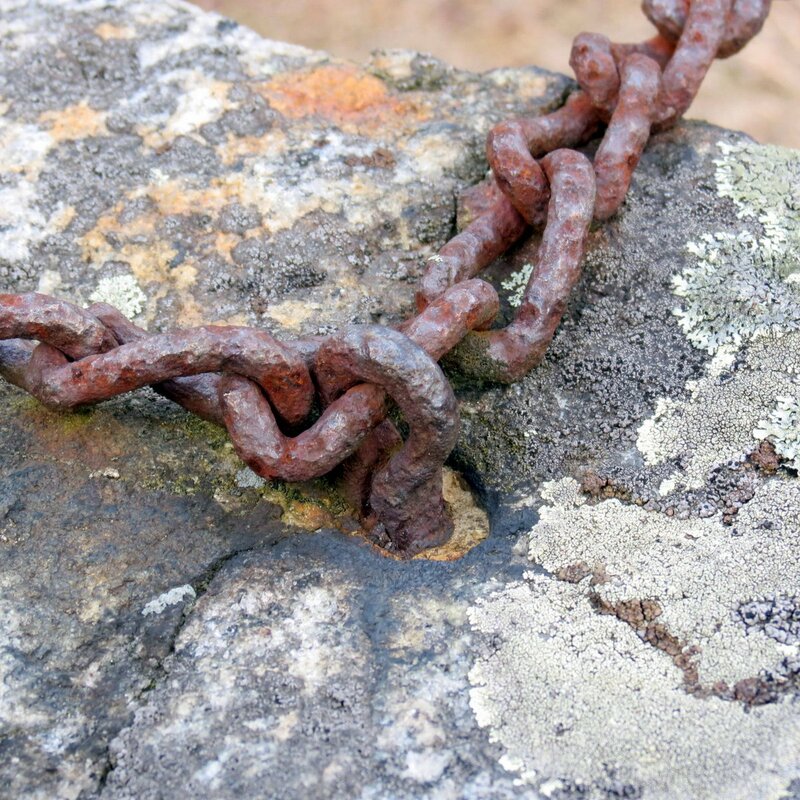 This chain looks like it was hand wrought. Blacksmiths don’t cast iron; they soften it by heating it in a forge and then shaping it with a hammer, and I love how you can see all the hammer blows on this chain hook. 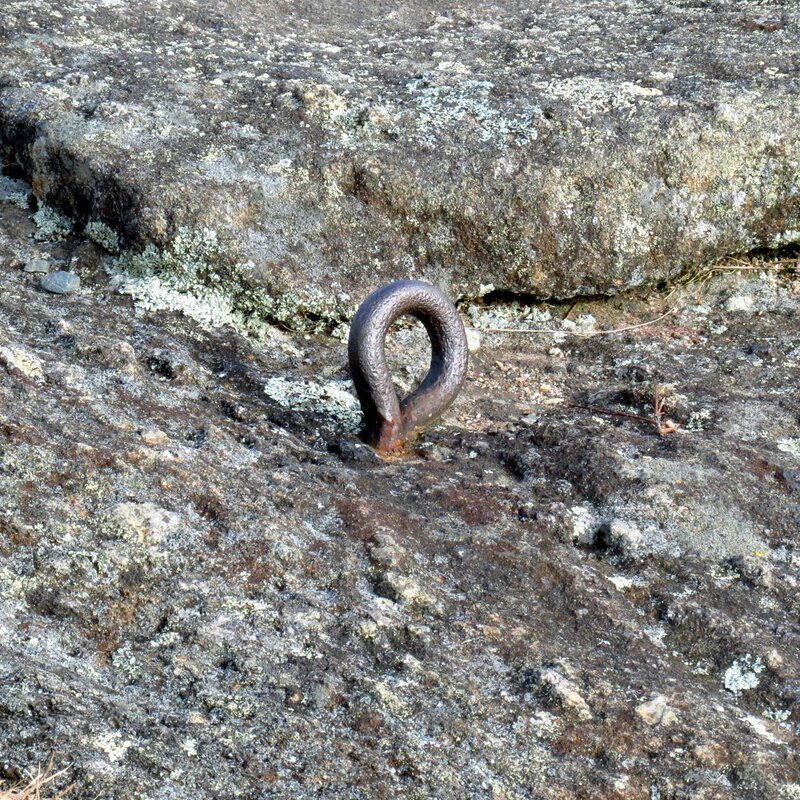 I also love how the smith fashioned something as simple as a chain hook into what looks like a dragon’s tail. He didn’t have to do this; it was extra work that he probably wasn’t paid for, but he was good and would have wanted people to know his work. If I needed ironwork done and I saw this hook and the ones in the previous photos I would have chosen the smith who made this one. It’s a beautiful thing which, if I owned it, would be considered a work of art. Sometimes these posts wander in unplanned directions and almost write themselves, and this is one of those; l felt as if I were just along for the ride instead of the one doing the writing. It began in the old cemetery and I just tagged along with the camera while the story wrote itself in my mind, so I hope you won’t mind that there is a little more history than botany in this one. Though I expected the post to be full of mosses and lichens for me the history I found was a refreshing diversion while I wait for spring flowers to appear, and thoughts of my hammer wielding grandfather ran all through the day. I wonder if he ever imagined that one of his grandsons would grow up to be a stone wall builder. 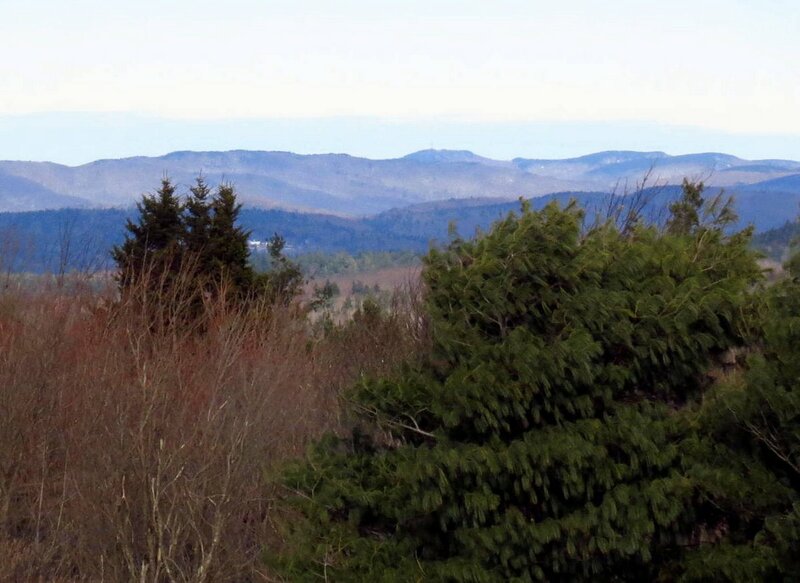 Last Sunday morning I decided to climb Mount Caesar in Swanzey. This hill seems to be a single, huge piece of granite bedrock that was thrust up out of the earth unknown eons ago. 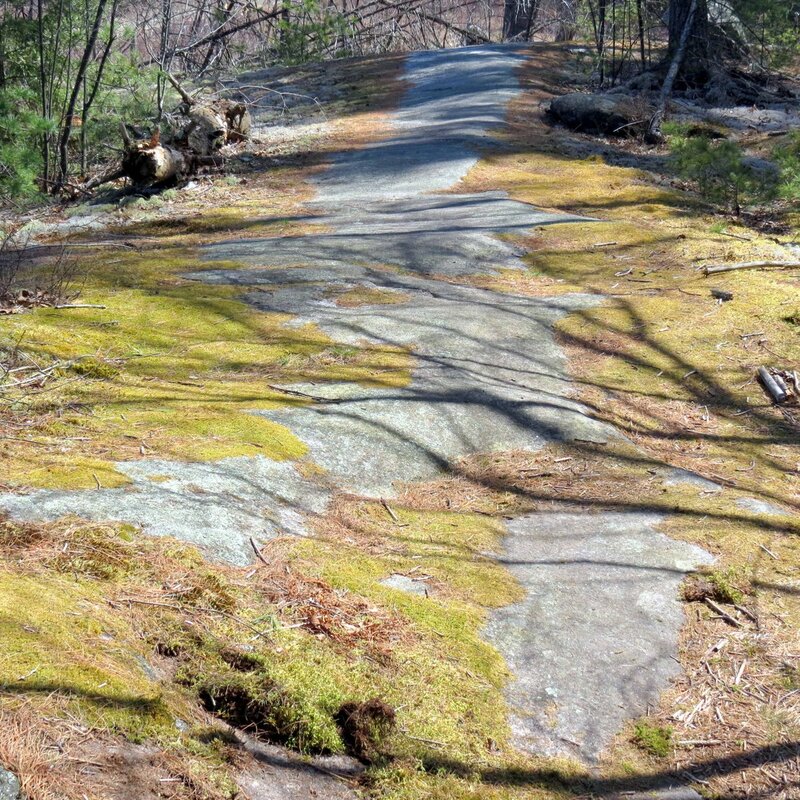 As the above photo shows, the trail starts out bare granite with a little moss and some reindeer lichens growing on the sides. Exposed granite like that shown can be seen here and there all the way to top, but there must be pockets of soil in places because settlers once went to a lot of trouble to clear it. 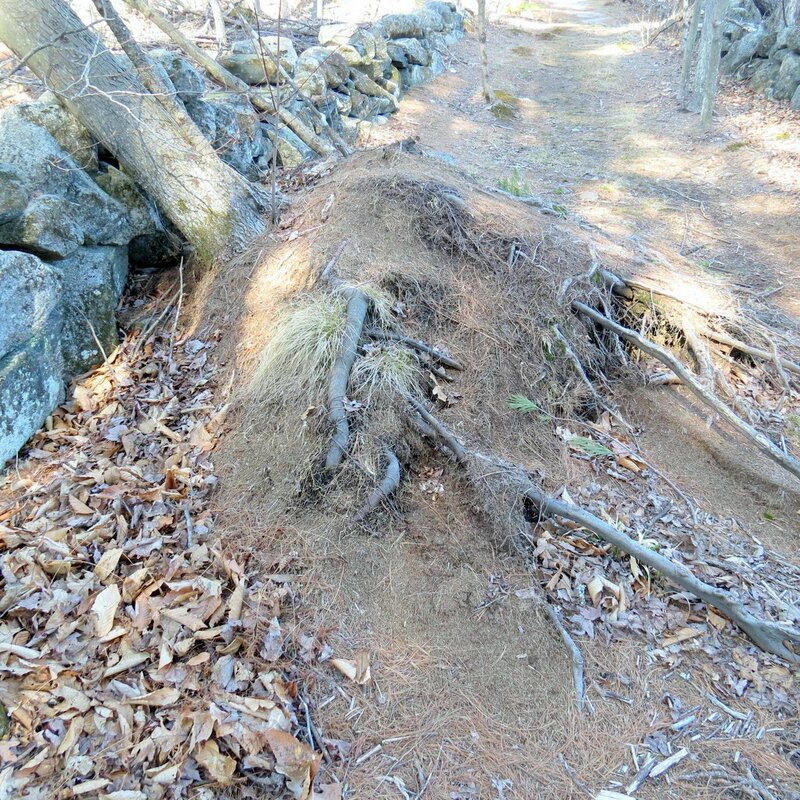 A red maple tree (Acer rubrum) has blown over onto a stone wall and its roots have humped up part of the trail. I know the tree is a red maple by the target canker on its trunk. 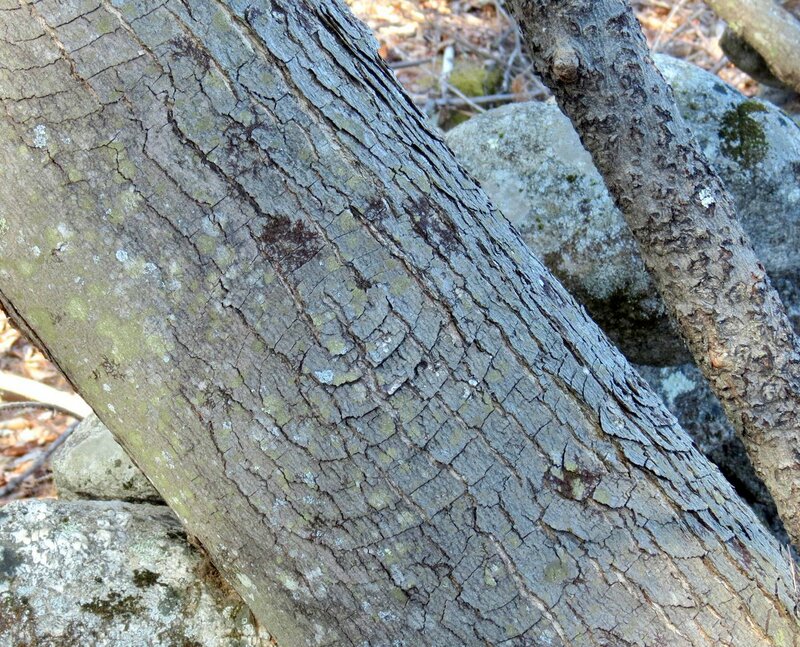 This canker doesn’t harm the tree but causes its bark to grow in circular patterns of narrow plates which helps protect it from the canker. As the tree ages the patterns disappear. If I understand what I’ve read correctly red maple is the only tree that does this. 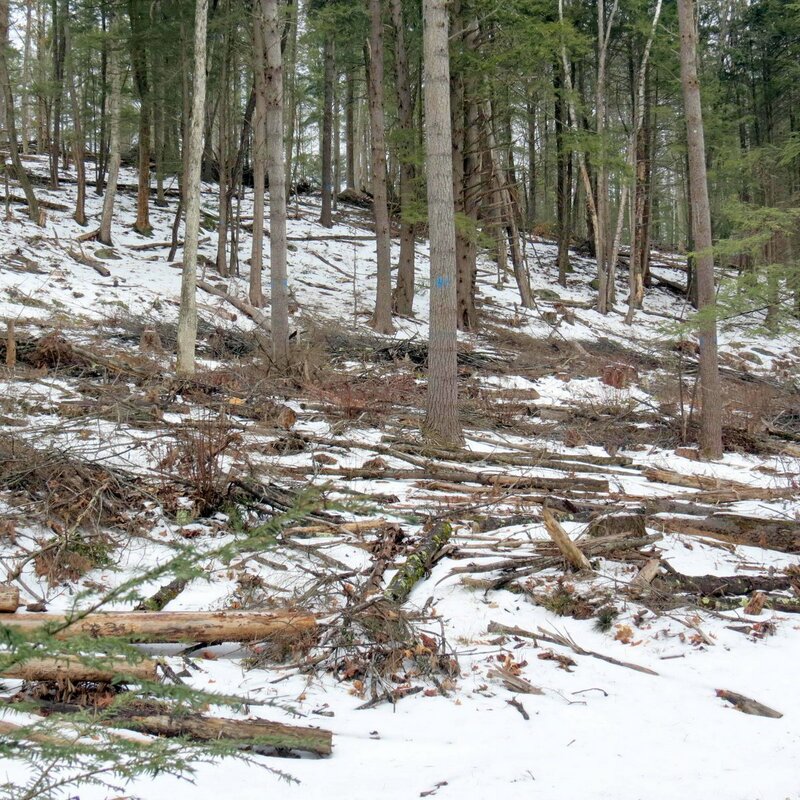 The blowdown was caused by the cutting of a large area of town owned forest, which was sold off a few years ago. A tree that has grown behind such a large windbreak all its life it doesn’t need very strong roots, but when the windbreak is removed its weak roots will let it fall. That’s why trees in a constant wind have much stronger roots than those that grow in sheltered locations. That’s also why people who have encountered hardship and adversity throughout their lives are much more able to bear the strain than those who have lived lives of sheltered ease. 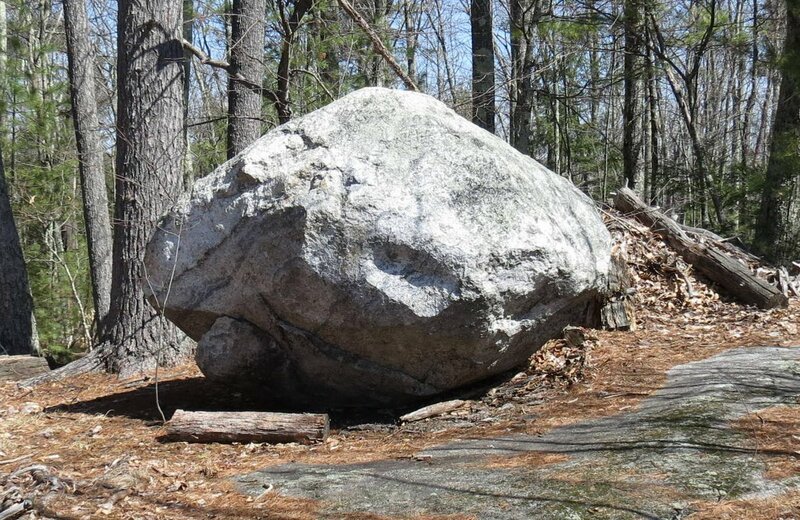 The removal of the shade provided by the forest has revealed a lot of things I haven’t noticed before, like this large boulder that was cut by someone in the past. 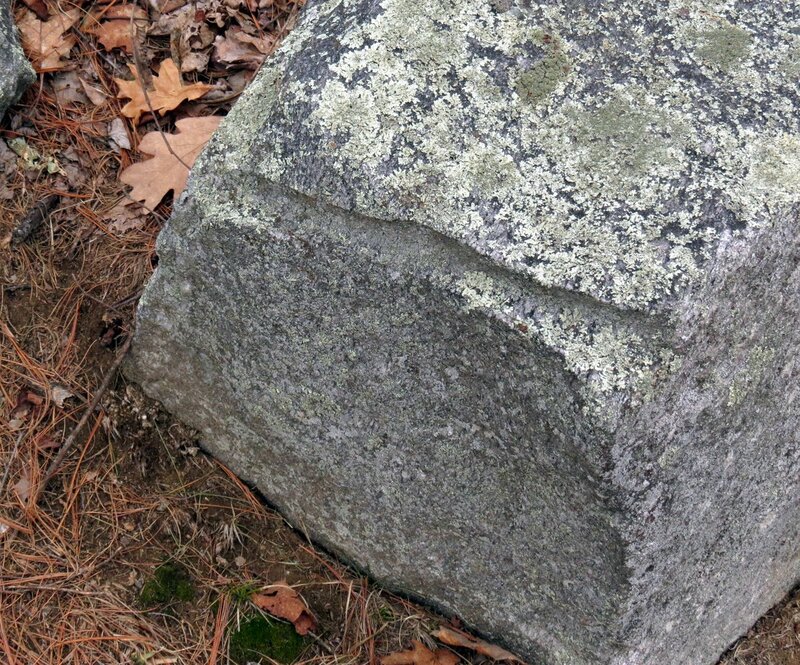 The short 3 inch deep lines around its edge are what’s left of the holes that were drilled so tools called feathers and wedges could be pounded in them to split the stone. The holes were most likely drilled by hand with a sledge hammer and star drill. One person would hold the drill while the other hit it with the hammer, and that says a lot about both skill and trust. 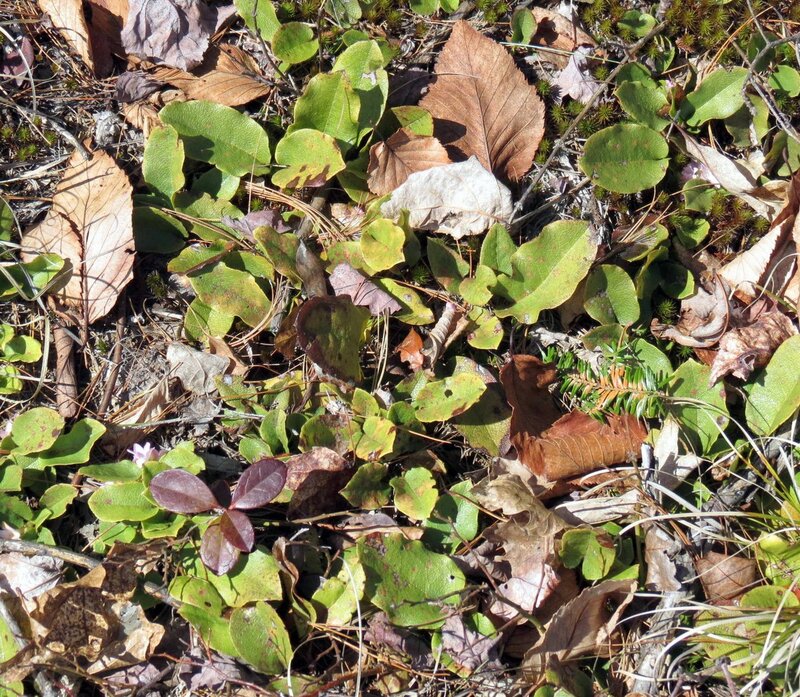 The cutting of the forest has also thrown sunlight on many shade loving plants, including this trailing arbutus. Its leaves should be deep green rather than the yellowish green seen here. 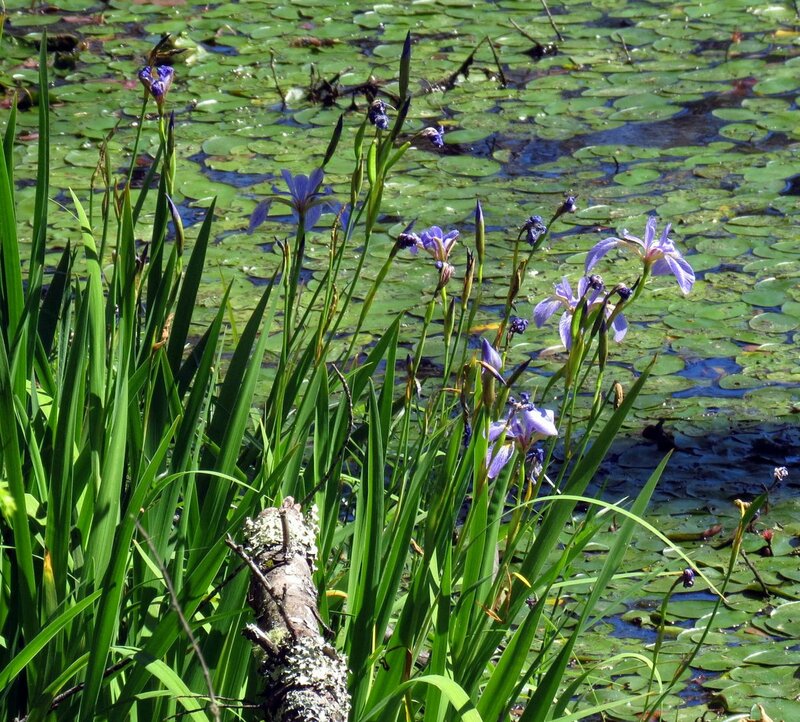 There were a few flowers tucked under the leaves but the plants don’t look as healthy as many other examples I’ve seen. The skidder used to haul the logs out of the forest turned the trail into a logging road and in places it’s so muddy that people have been forced to make a new narrow trail above the now 2 foot deep trench. It works fine until you meet someone going the opposite way. I doubt that it will ever be repaired until the trail becomes a stream and washes half the hill into the road that borders it. 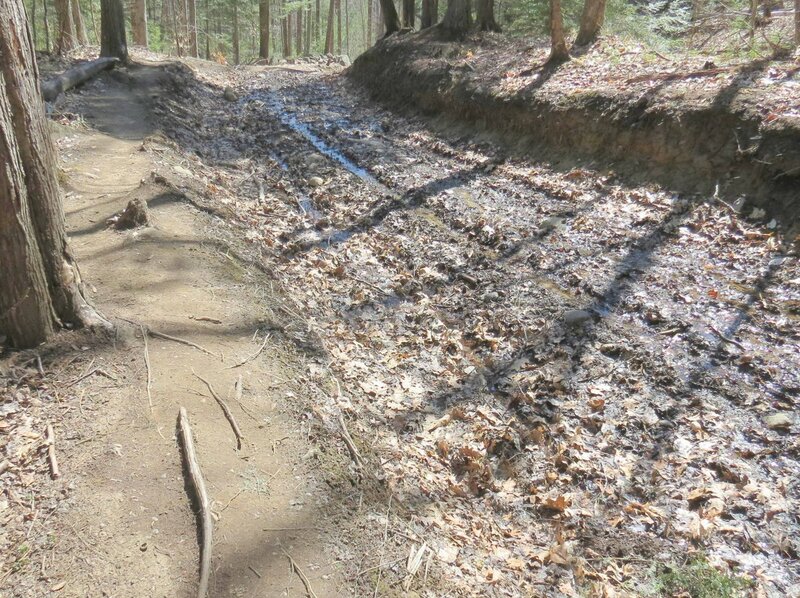 Parts of the trail are showing signs that this is already happening, and they look more like dry stream bed than trail. In a pouring rain the water must really rush through. When I was building dry stone walls I always thought of them as giant puzzles, because I knew that there was always a perfect stone that would fit in the space that I was trying to fill; all I had to do was find it. These days I just admire the work of others, and I thought that this part of an old wall looked particularly puzzle like. This isn’t a “thrown wall” where someone just tossed stones on top of each other in a long pile. This wall was thought about and a certain amount of care was taken when it was built. Sometimes you see stones in walls that have a story to tell, like this one that I assume probably had the deep grooves worn into it by a glacier. I imagine the father and son, brother and brother, or master and slave had a lot to talk about as they cleared the fields of the many rocks they found. They were talking about glaciers and ice ages in Sweden in the 1700s, but whether or not any of that knowledge would have reached the residents of Swanzey is a question I can’t answer. I do know that Native Americans burnt the town to the ground in the mid-1700s, so the residents probably had other things on their minds than glaciers and ice ages. 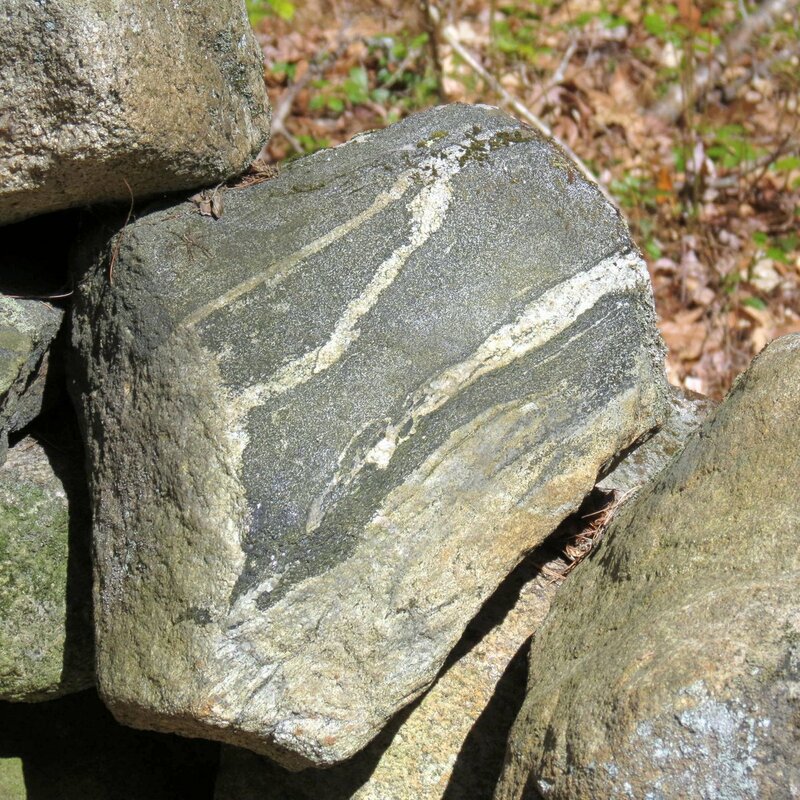 Other stones, instead of being shaped by ice, show traces of the hot magma that formed them. 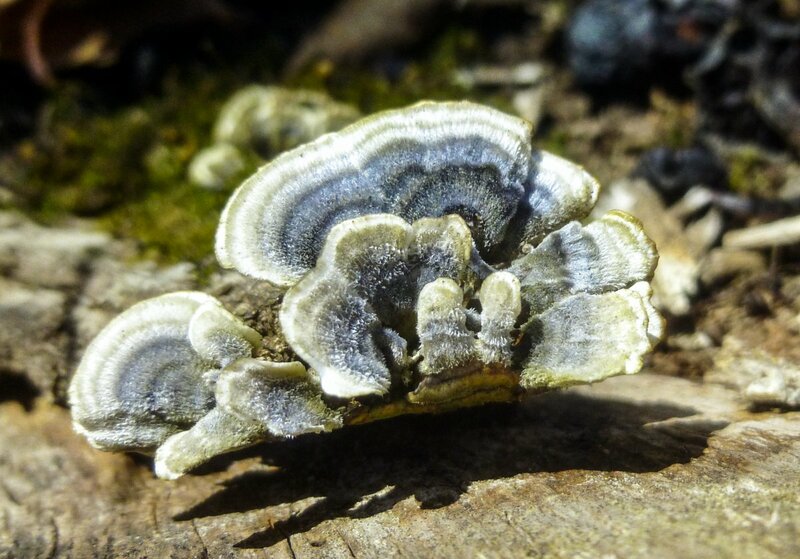 These young turkey tail fungi (Trametes versicolor) grew on a piece of bark that had pulled away from the stump it grew on. They reminded me of the old song Blue Velvet by Bobby Vinton, and I had it playing in my head for the rest of the hike. There is a very big old log lying beside the trail just before you reach the top and I usually stop here to catch my breath. 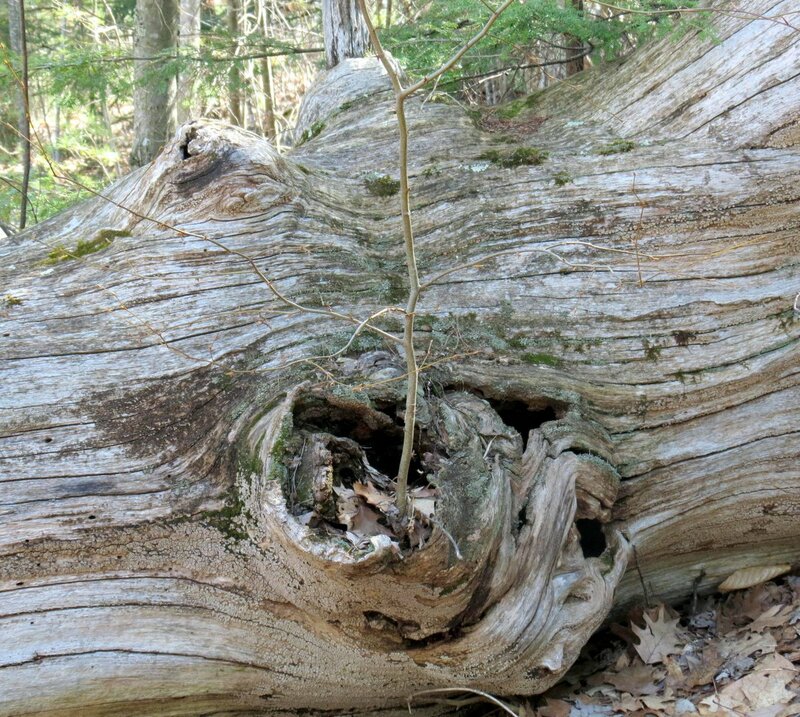 When I did that this time I saw that the old log had become a nurse log, with a small cherry or black birch growing out of the hollow where a branch once grew. 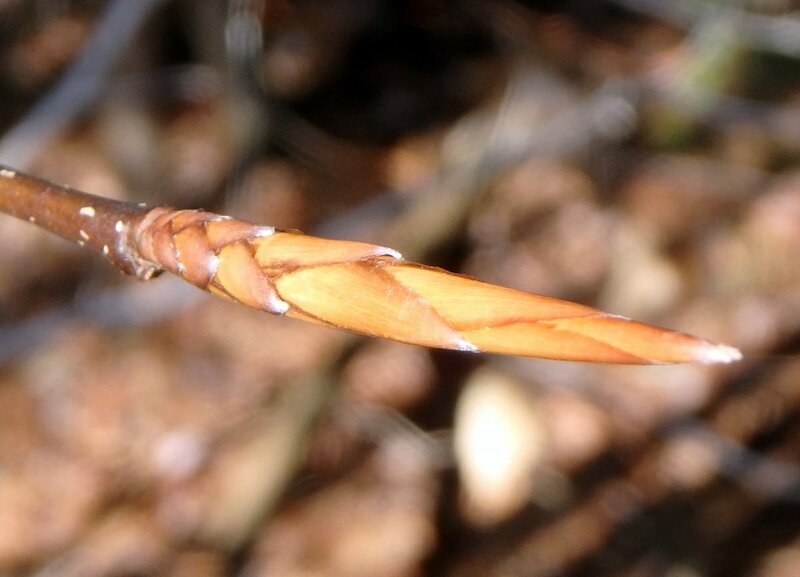 I should have tasted a twig; the taste of wintergreen would have meant it was a black birch (Betula lenta,) which is also called sweet birch, cherry birch, and mahogany birch. It’s an unusual place for a tree to grow and it’ll be interesting to watch. I think, out of all the hills I climb, if I climbed them for the view I’d be disappointed about 80% of the time, but since I don’t really care what the view looks like I’m never disappointed. I climb more for the things I see along the trail than what I see from the top, and I see interesting things along the trail every single time I climb. Today’s view would have been among the 80% I’m afraid, with its harsh sunlight and flat blue sky. A deeper blue in the sky and some puffy white clouds would have made a beautiful view but you can’t have everything, and I need to stop and remind myself that I should be thankful that I can even make it up here. There was a time not that long ago when Mount Caesar might as well have been Mount Everest. 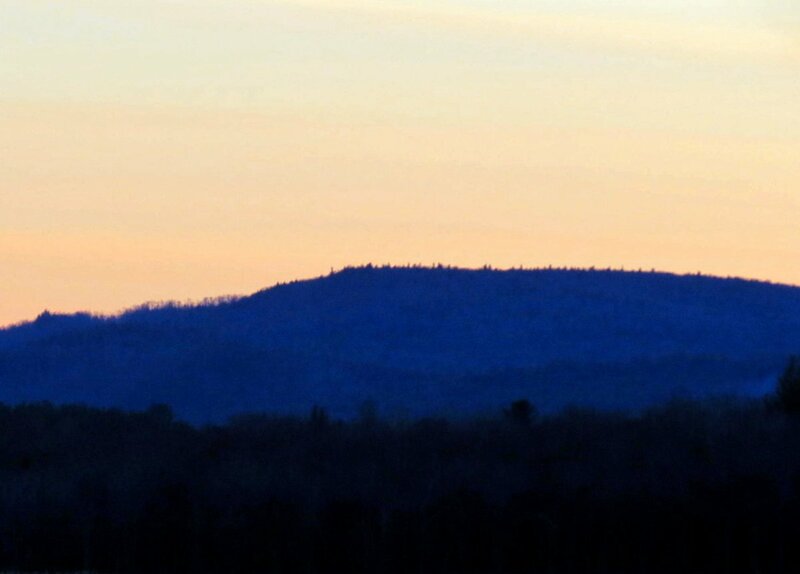 Mount Monadnock sat in a sun washed haze over in Jaffrey. 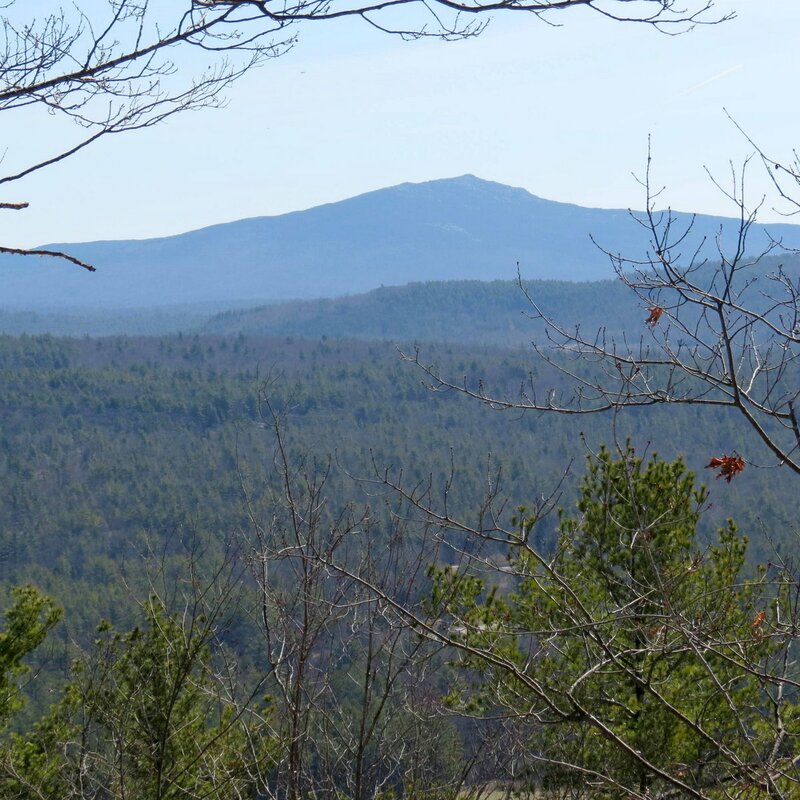 The word Monadnock is thought to originate with the Native American Abenaki tribe and is said to mean “mountain that stands alone. 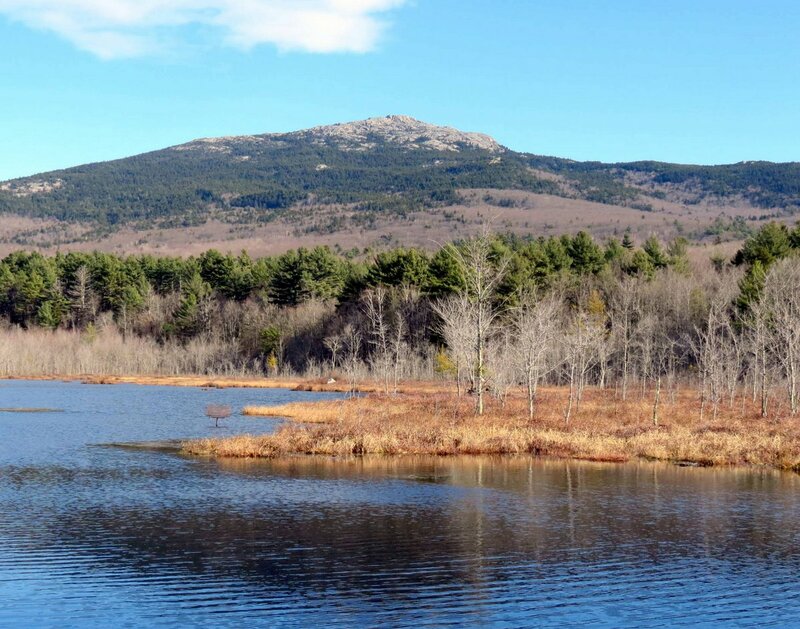 “ At 3 165 feet Mount Monadnock is taller than any other feature in the region and is visible from nearly every surrounding town. It rises about 2203 feet higher than where I stood when I took this photo. A large bird soared above me on the thermals. 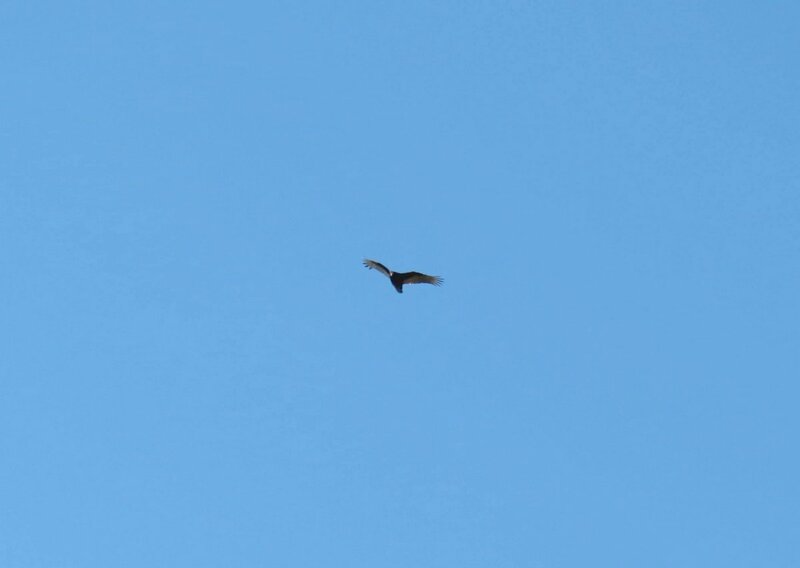 I think it was a turkey vulture and I wondered for a moment if it thought I was a turkey. 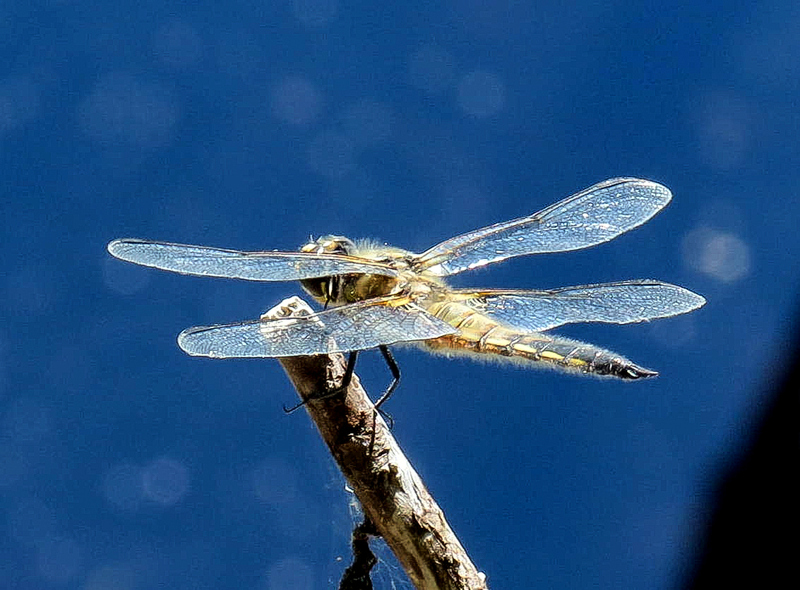 It seemed very interested and circled a couple of times before flying off. 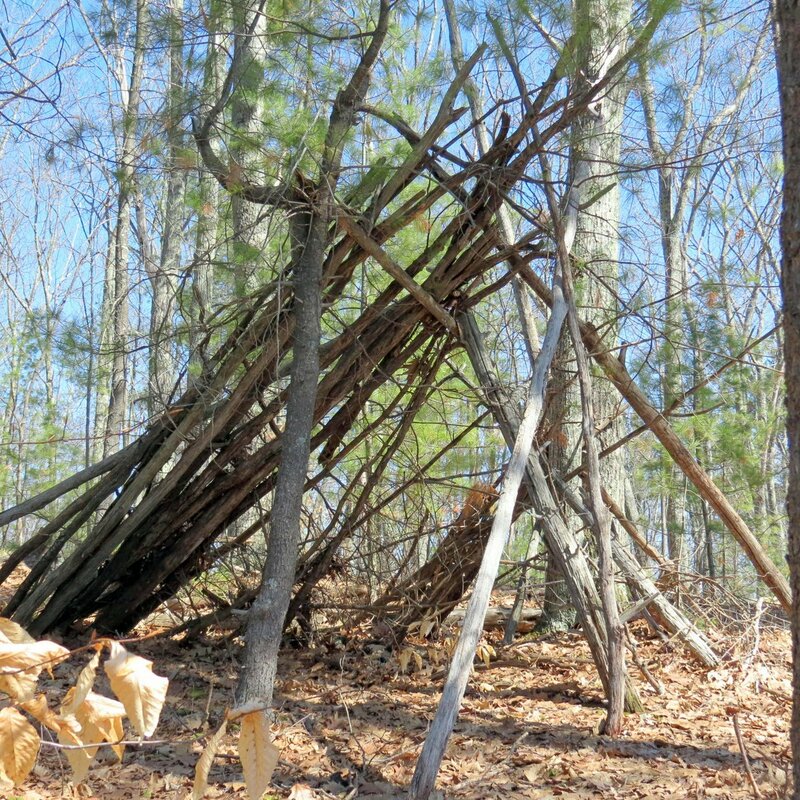 Someone built a lean-to near the summit sometime in the past. If they stayed up here at night I hope they had a good flashlight and an excellent sense of direction. The cliffs here are quite high and stumbling around up here in the dark would not be wise. 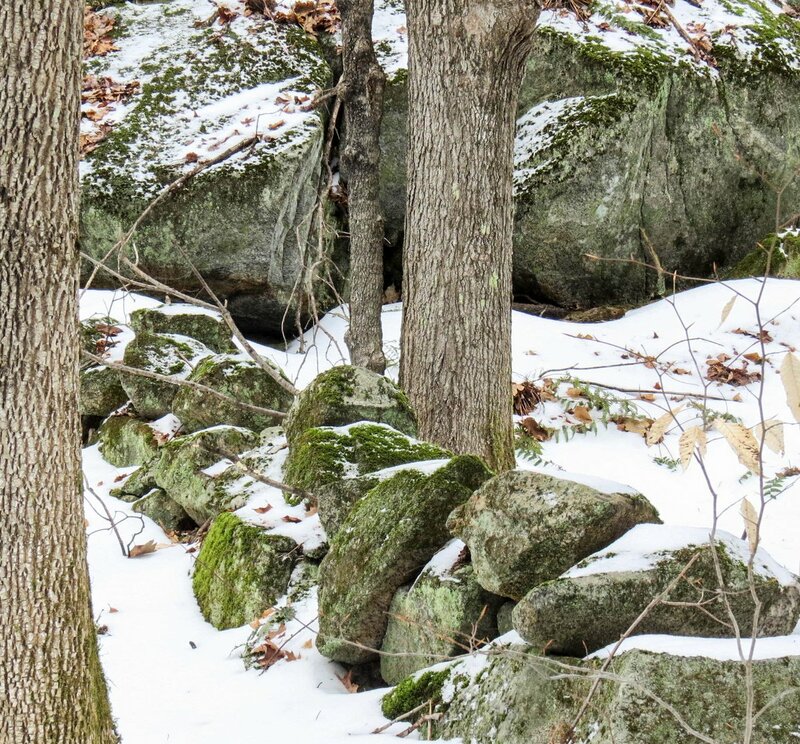 There is a large glacial erratic that sits on top of Mount Caesar but for some reason I’ve never shown it in a blog post. It’s smaller than a Volkswagen Beetle but not by much. It sits on the granite bedrock where the glacier left it, simply too big and heavy to do anything with. 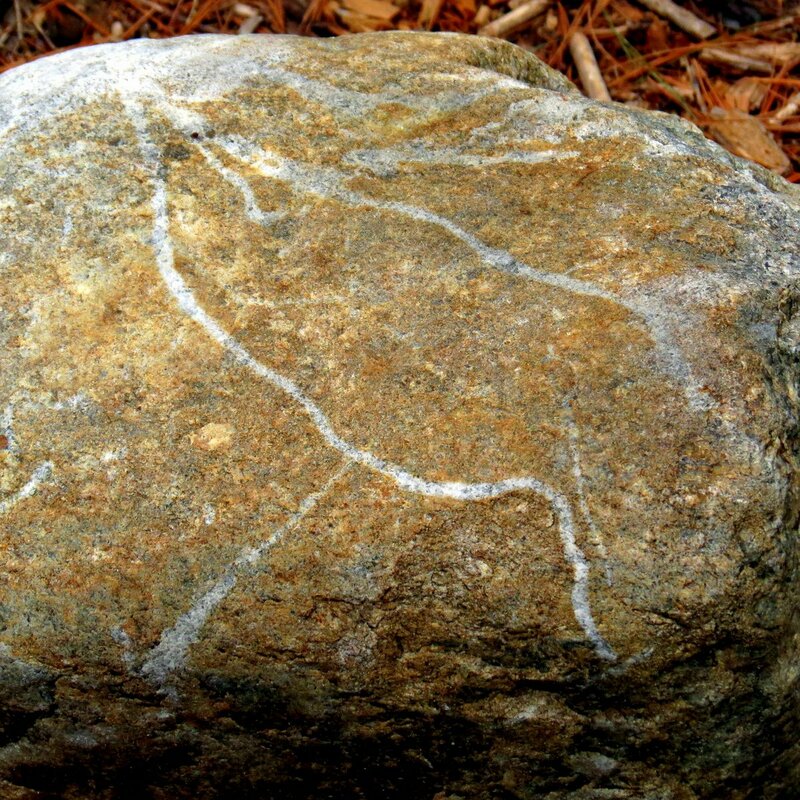 It could have been drilled and split with feathers and wedges like the boulder we saw earlier in this post but that was a lot of work, and what would have been the point? Then you’d just have had to drag the resulting stone slabs all the way down the trail. 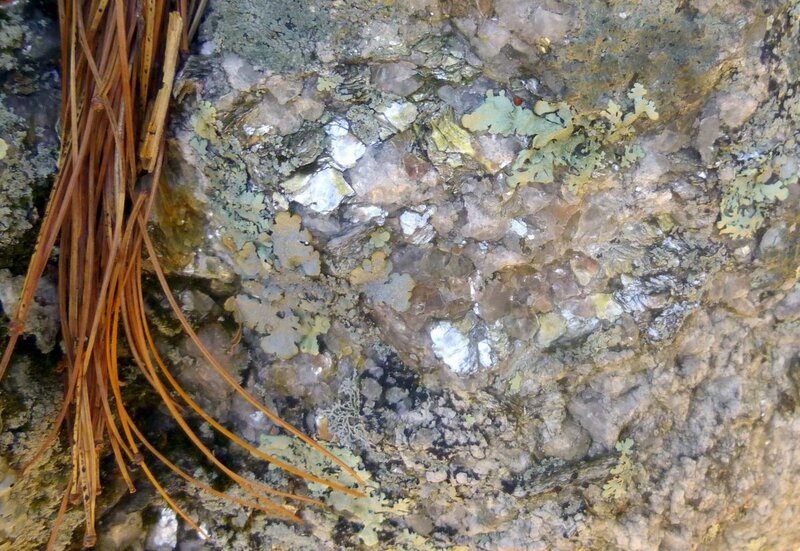 This erratic has a lot of mica and feldspar in it, which are minerals I’ve never seen anywhere else here on Mount Caesar. Maybe the glacier carried it from Gilsum to the north. There is plenty of both there. 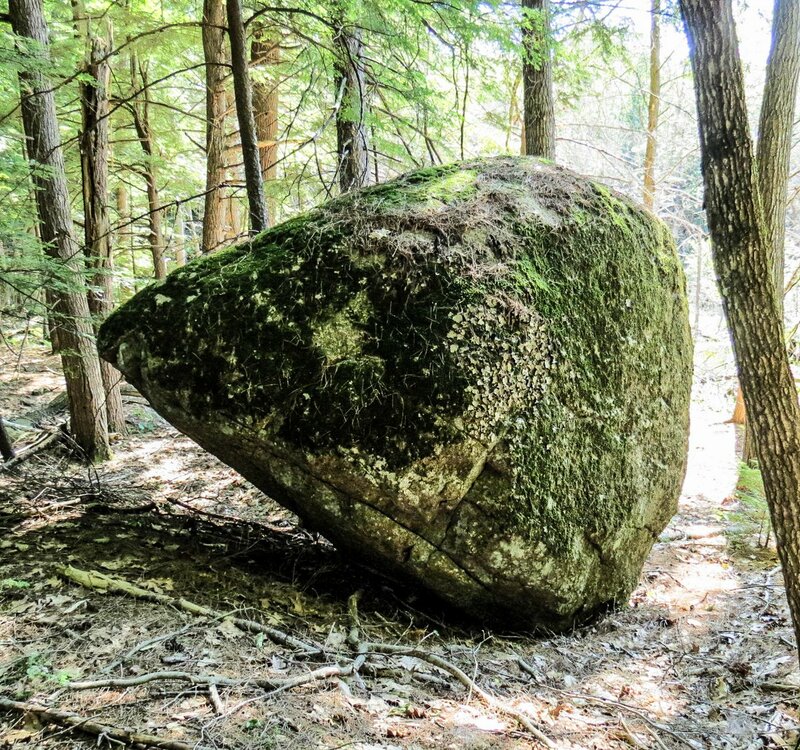 Of course the definition of a glacial erratic is “a piece of rock that differs from the size and type of rock native to the area in which it rests” and this example seems to fit that definition perfectly. I had to sit by my friends the toadskin lichens (Lasallia papulosa) for a while and study them a bit, because the more I look the more I see. On this day they were very dry to the point of crispness, but were still beautiful. 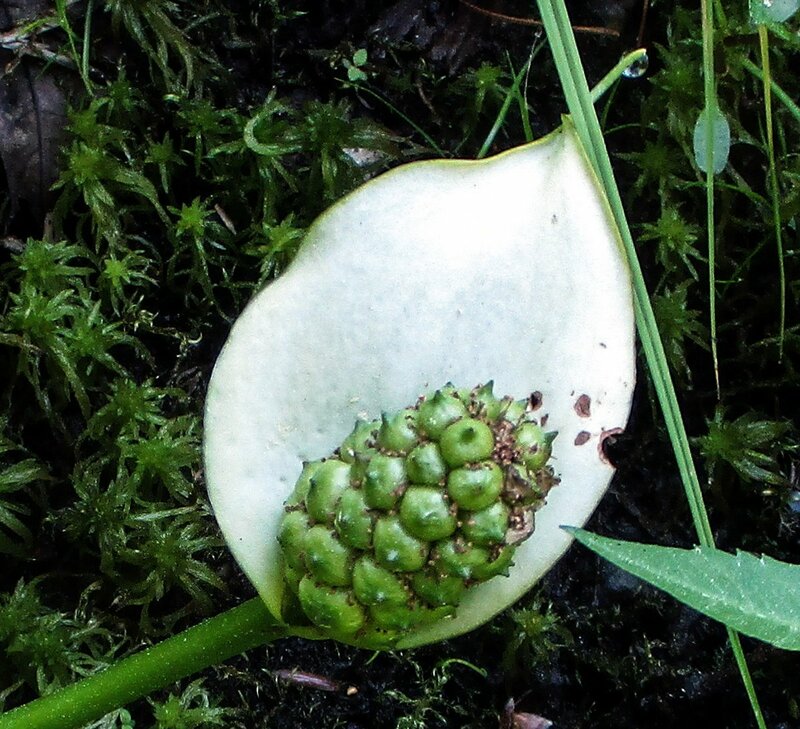 The smaller one on the right was pierced by a pine needle, so if you know the size of a pine needle that will tell you the size of the lichen. They aren’t very big; I think the biggest one I’ve seen was about the same diameter as a ping pong ball. I keep hoping to find them at lower elevations but so far the only place I’ve ever seen them is on hilltops. More sunshine? Cleaner air? I don’t know what attracts them to only the high places. 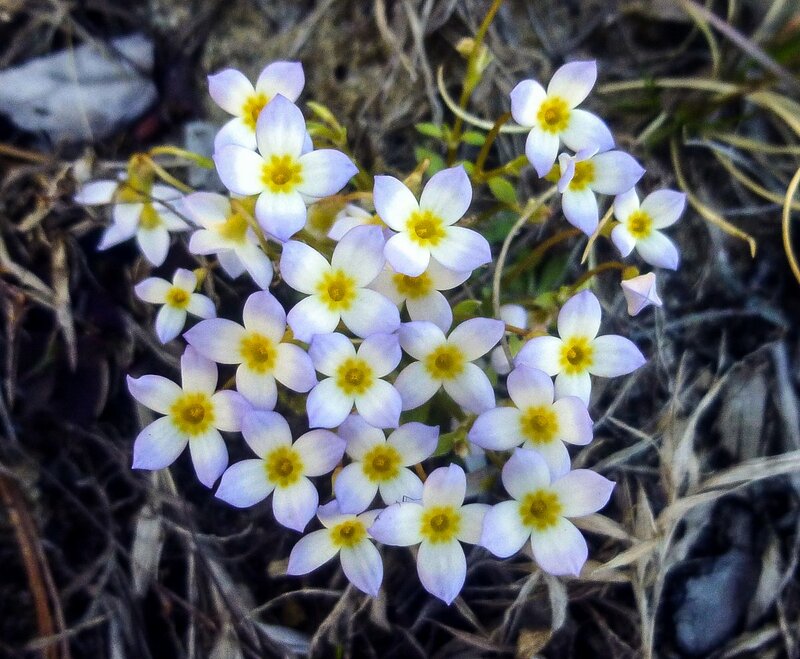 The only wildflowers I saw on this morning were bluets (Houstonia caerulea,) and that was okay. They’re beautiful little things but I’ve never seen such an even division in the white and blue on the petals. 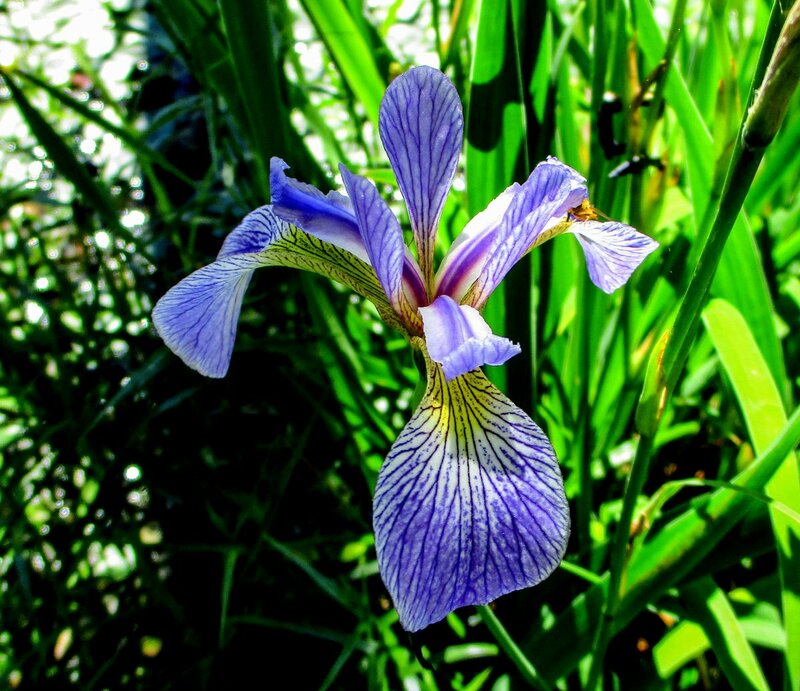 Usually they have more of one color or the other, and often the white makes a narrow band around the center and the blue colors most of the rest of the petal. I’d have to call these examples bicolor. They were a surprise, and a real treat to see. 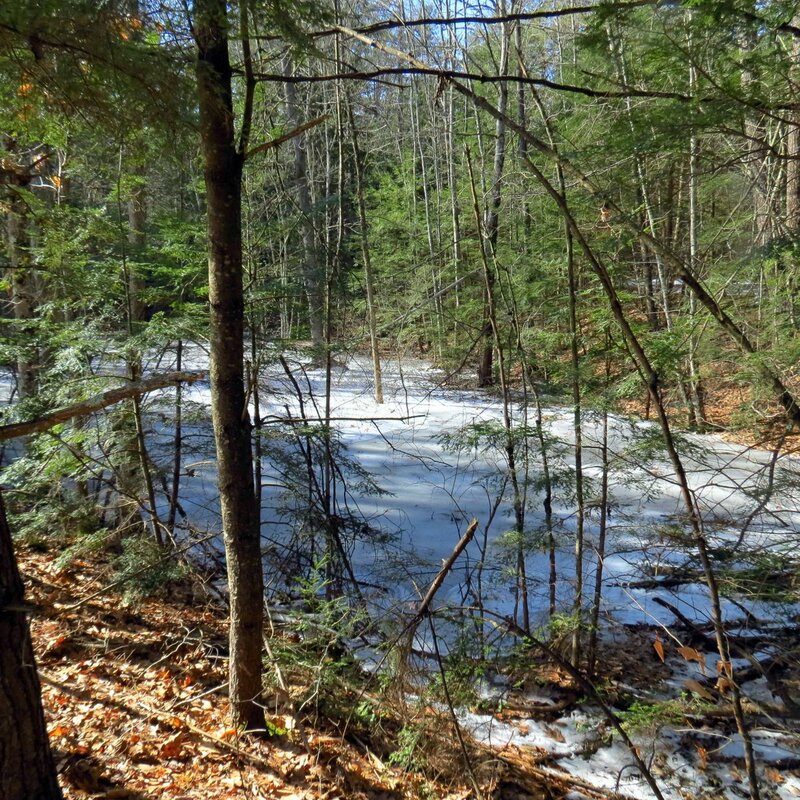 When I visit a place I like to visit it in all four seasons and get to know it a bit, and that’s why I decided to walk in Yale Forest in Swanzey last weekend. It was a cloudy, gray day that wasn’t great for photography but I saw plenty of interesting things and came home happy. 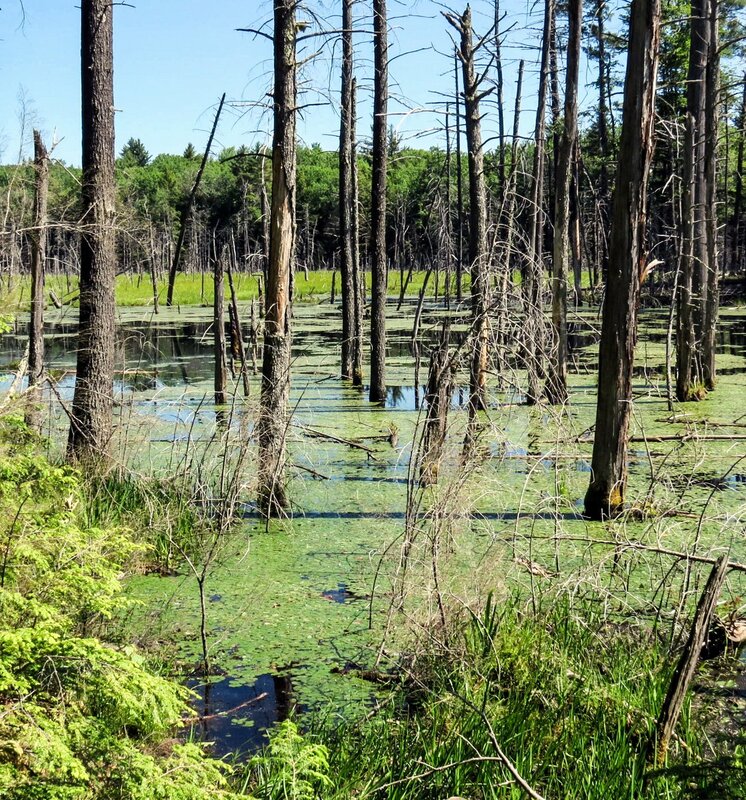 It’s amazing how much the look of a place can change between winter and summer, and how many unseen things are revealed when the trees and shrubs no longer have leaves. The road I followed was once called Dartmouth College Road because if you followed in north far enough, that’s where you would have ended up. 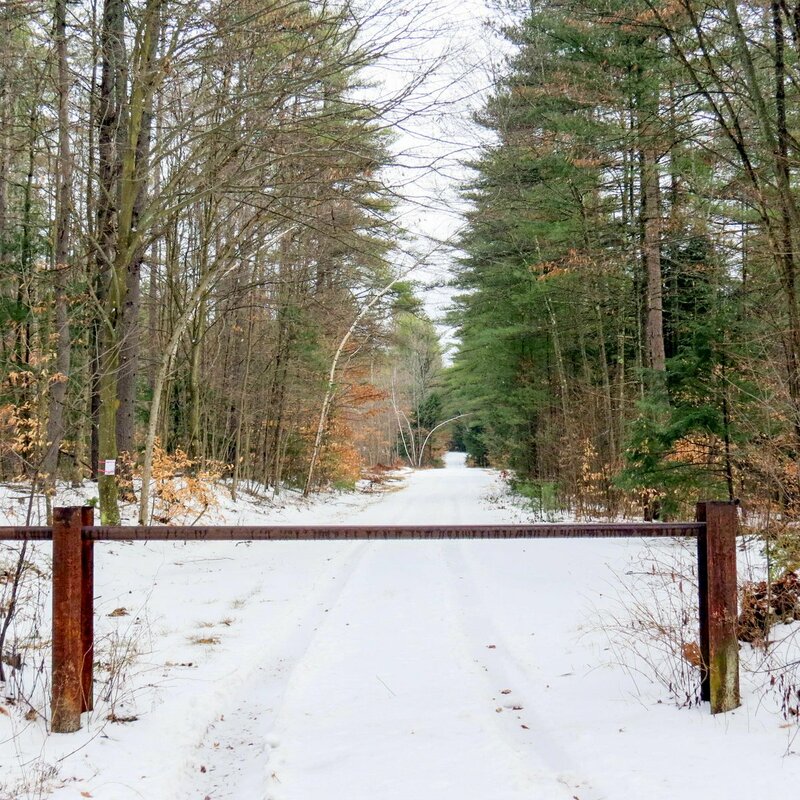 When the State Department of Transportation built what is now route 10 this section of road was abandoned and from what I gather by talking to the county forester and others, was taken over by Yale University. I’m not sure exactly how it worked but apparently, since they owned the land on both sides of the road it became theirs when it was abandoned by the state. 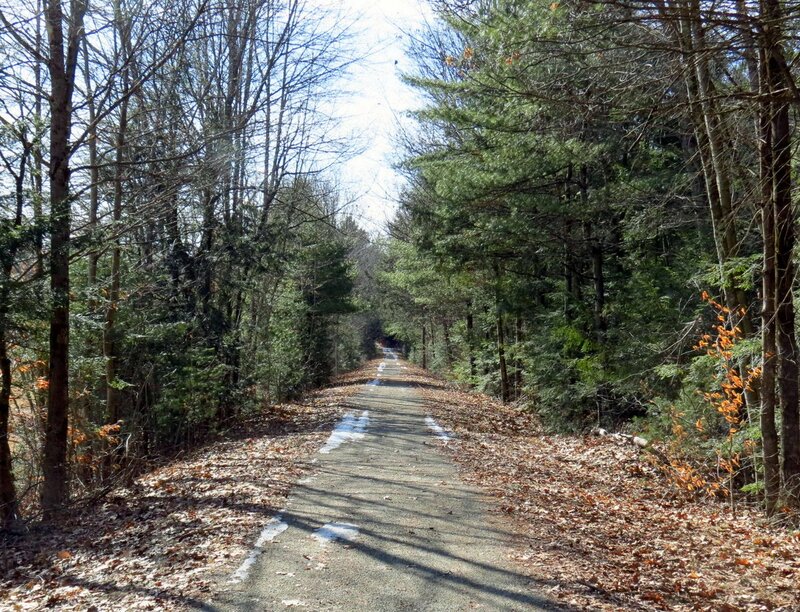 In any event it is now considered a private road but Yale University is very good about letting locals use the forest for hiking and biking. Since gates on both ends of the road are locked I’m assuming that the tire tracks were made by someone from Yale. 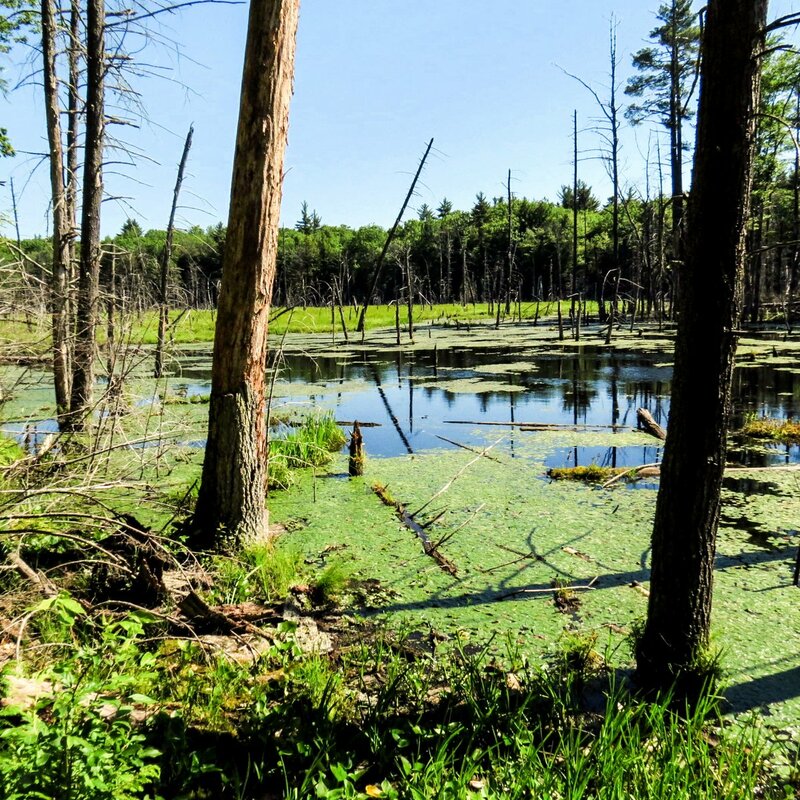 Yale founded a School of Forestry & Environmental Studies in 1900 and owns parcels of forest all over New England. Alumni donated land to the school or it was bought or sometimes even traded, and over time good sized pieces of forest were put together. The first land was bought by the school in 1913 but this particular parcel dates from the 1920s or 30s. 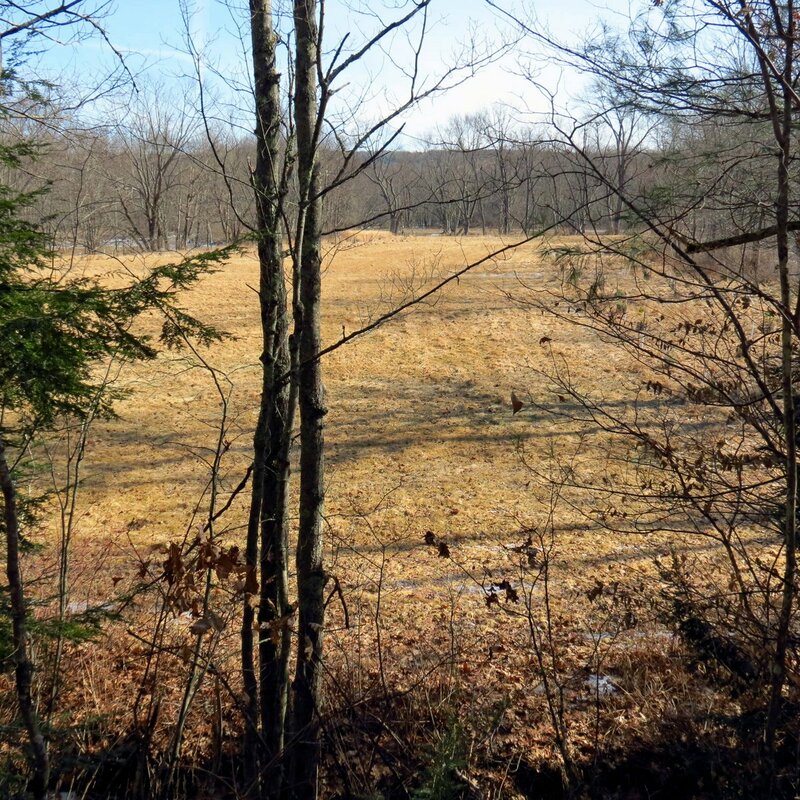 It is 1,930 acres in size. A forestry school can’t train foresters in proper forest management without a forest, so this is one of the places where they come to train, and part of that training includes how to maintain healthy woodlands. 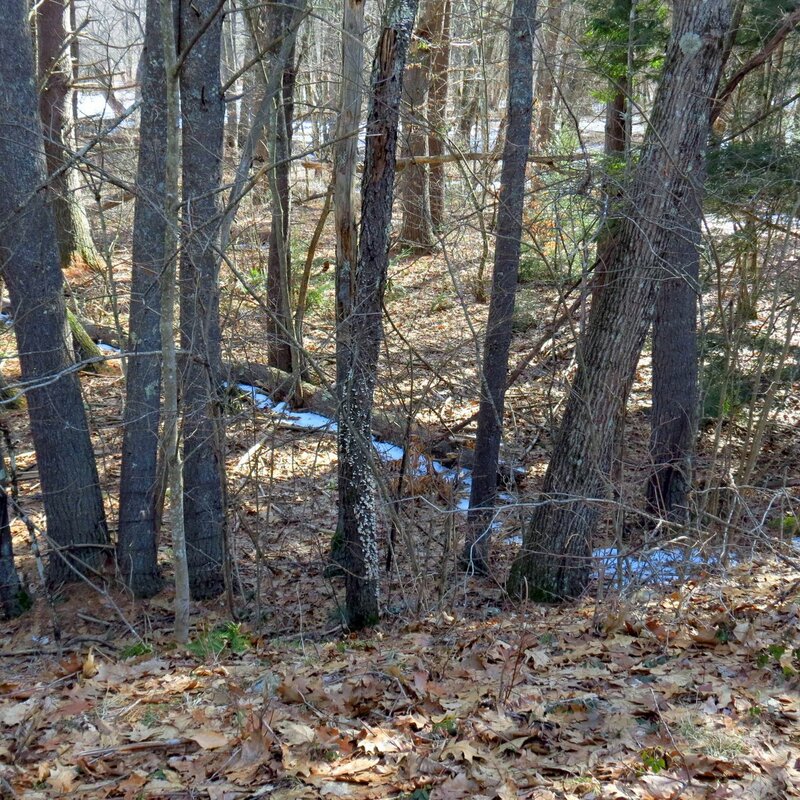 This parcel is mostly red and white pine that was planted or seeded naturally after the hurricane of 1938 blew down many of the trees that stood here, so none of it is original old growth forest. Sure enough the deer had eaten the tender tip of every shoot. Deer have their front cutting incisor teeth only on their bottom jaw and these teeth meet a cartilage pad on their top jaw so they tear rather than cut through cleanly, and that tearing can be clearly seen in the photo. This won’t kill the new shoots but it will make them bushier. 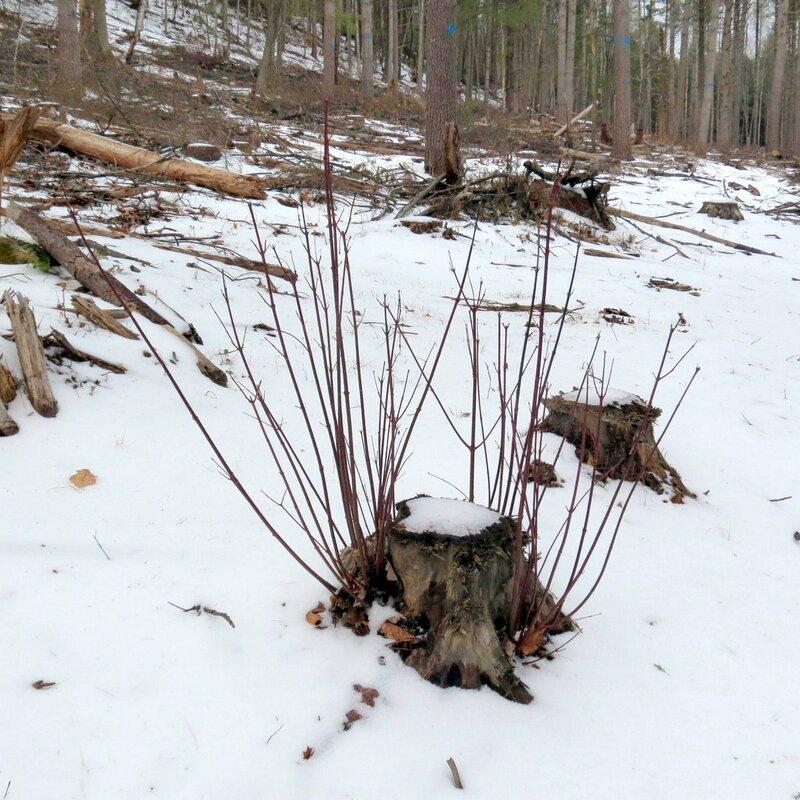 Selectively cutting a forest and leaving the stumps to re-grow provides valuable winter food to deer. 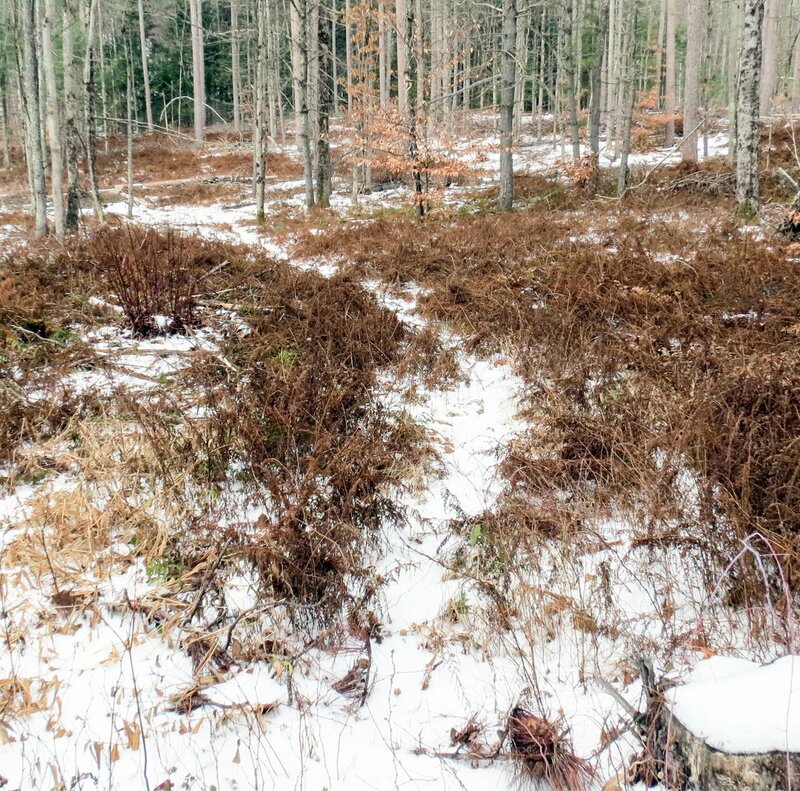 Now that the ferns and other undergrowth have died back game trails could be seen clearly. 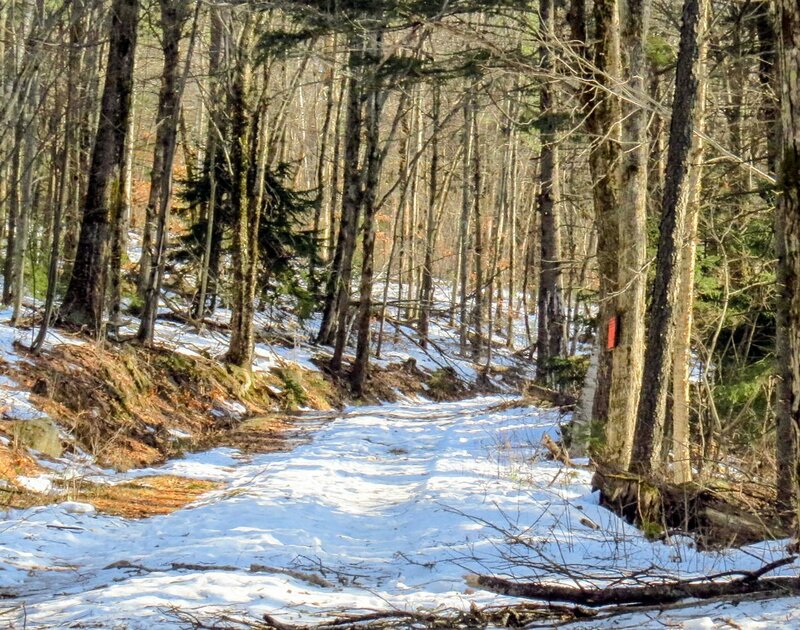 The deer use these trails year round but they aren’t as easy to spot in summer and fall. 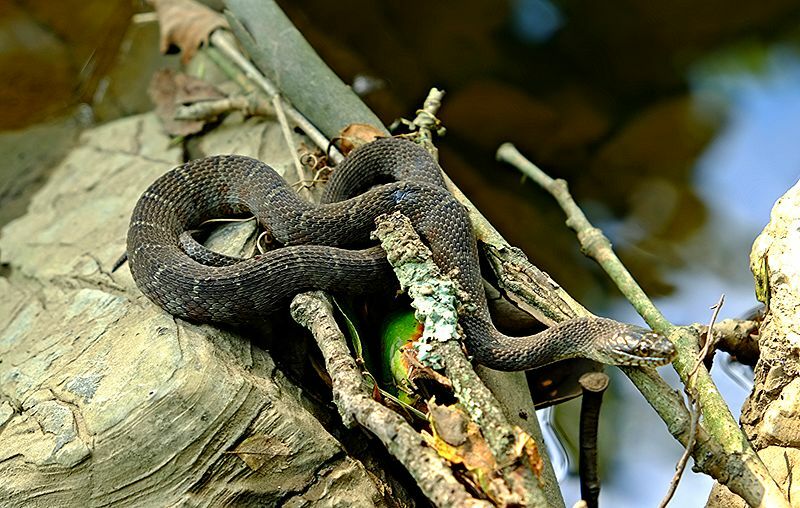 They can be seen in any New Hampshire forest and have probably been used since the dawn of time. Stone walls and cellar holes are all that’s left to tell of all the back breaking work that once went on here. This particular piece of land is very stony and parts of it are low and wet, so I doubt much crop farming was done here. I’m guessing that it was sheep pasture. Sheep were big business in this area in the 1800s but then railroads came through and the industrial revolution happened and many of these smaller farms were abandoned or sold. 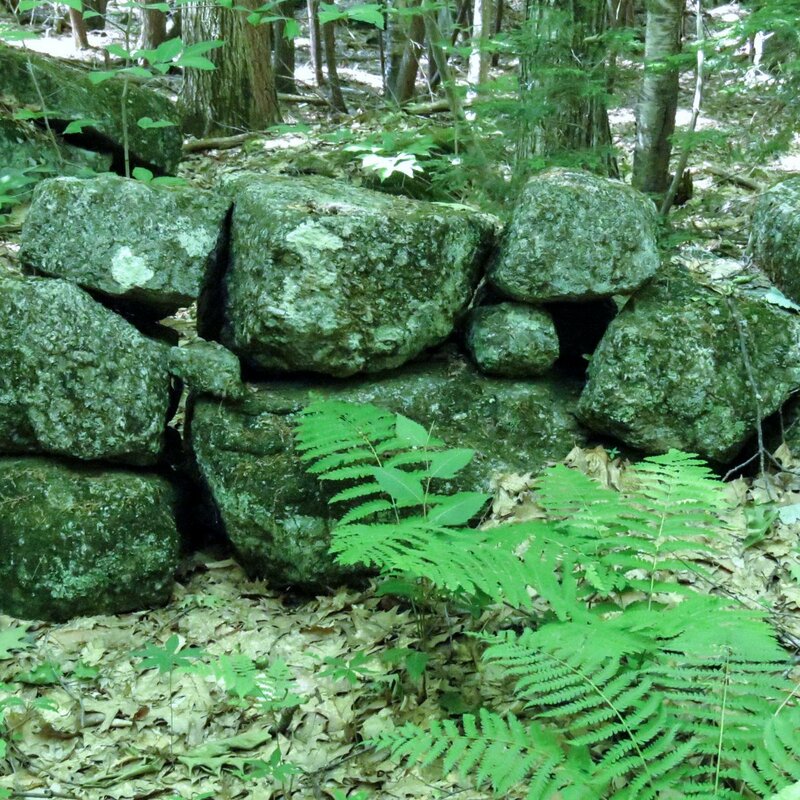 The forests grew back and now it’s close to impossible to walk into a New Hampshire forest and not see a stone wall. 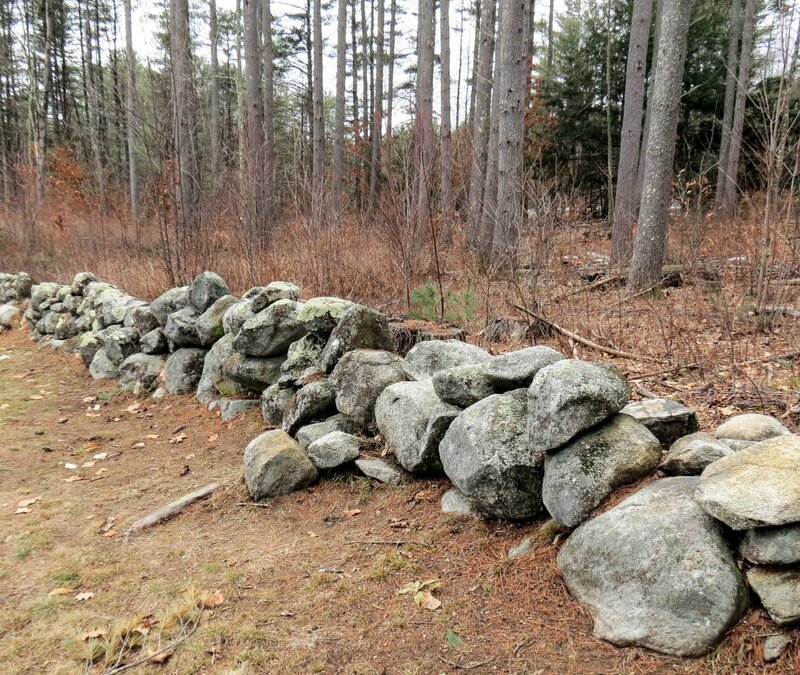 At one time there were an estimated 250,000 miles of stone walls in the northeast. 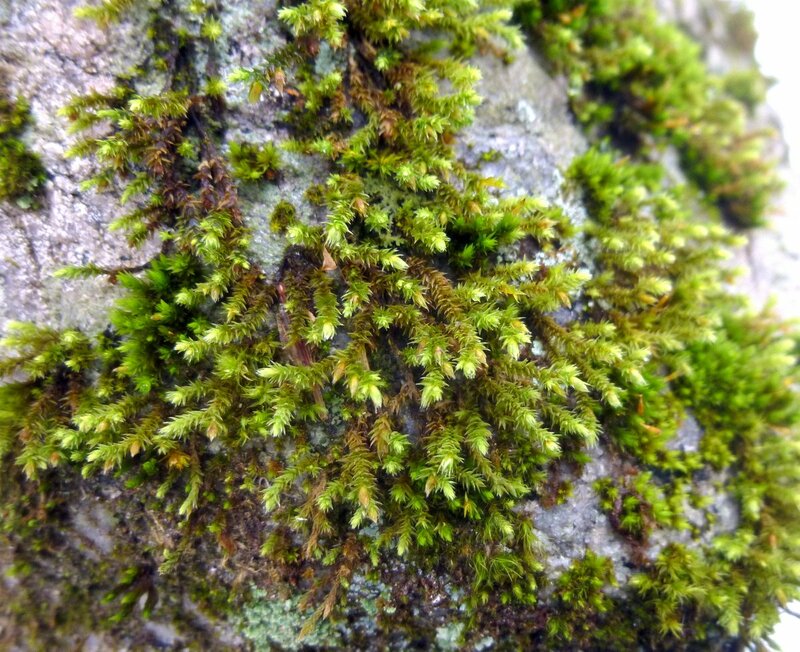 White-tipped moss (Hedwigia ciliata) grew on one of the stones in the wall. This moss was very green and healthy looking and part of that probably had to do with the previous night’s dusting of snow. It was warm enough so the snow had melted and the water from it rejuvenated the mosses and lichens. 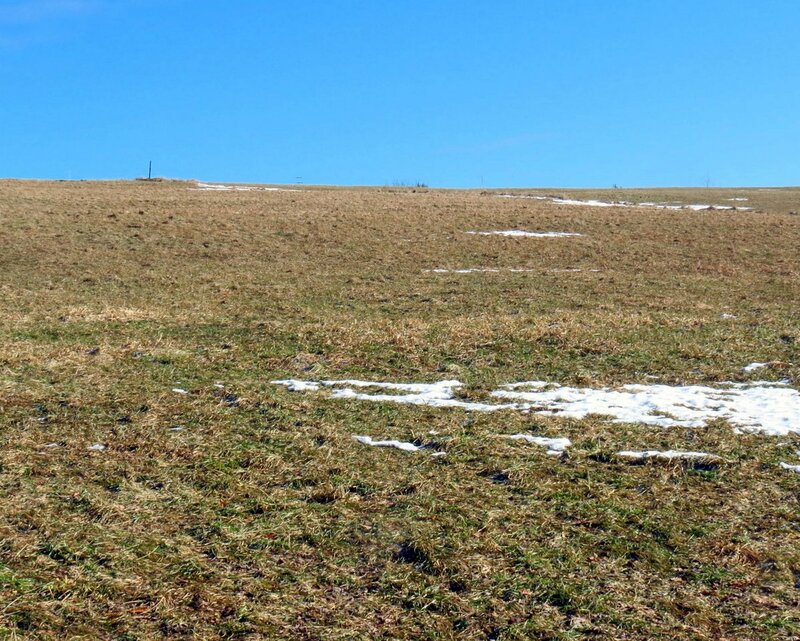 Many people don’t seem to realize that in spite of the snow the winter landscape can be as dry as a desert until it warms up enough for the snow to melt. 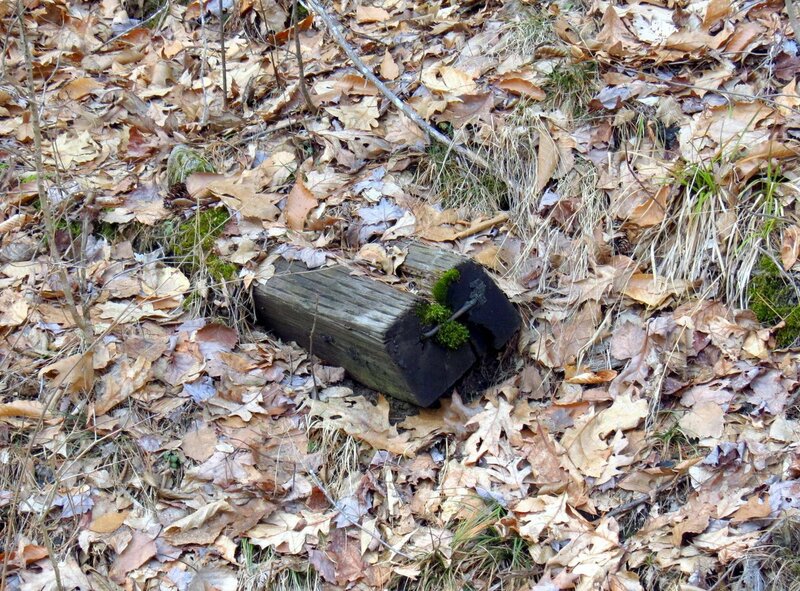 I see many mosses and lichens that are as shriveled in January as they are in July. 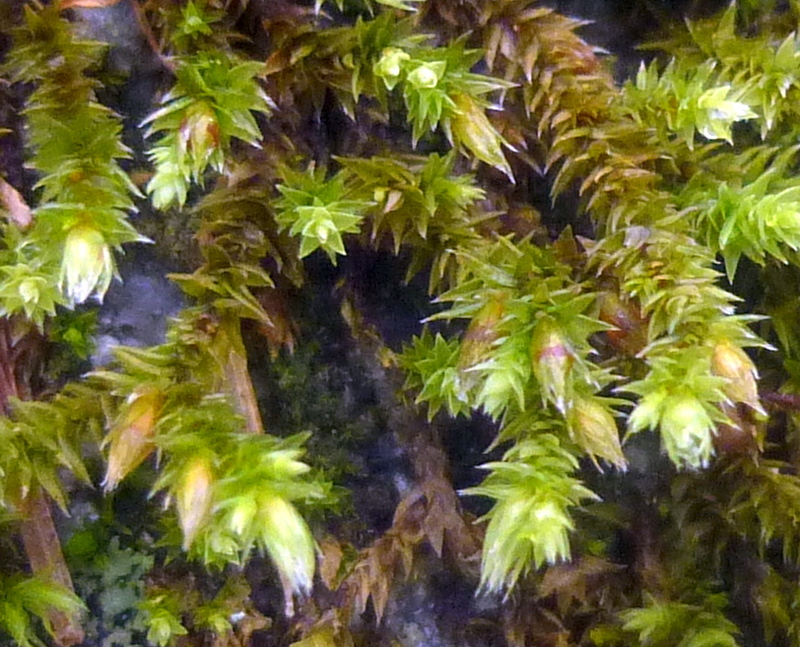 I like seeing mosses close up, and this is about as close as I could get to the white tipped moss in the previous photo. At this scale it’s clear where it got its common name, and it’s also clear that it’s a very beautiful thing. Crowded parchment fungi (Stereum complicatum) jostled for space on a log. 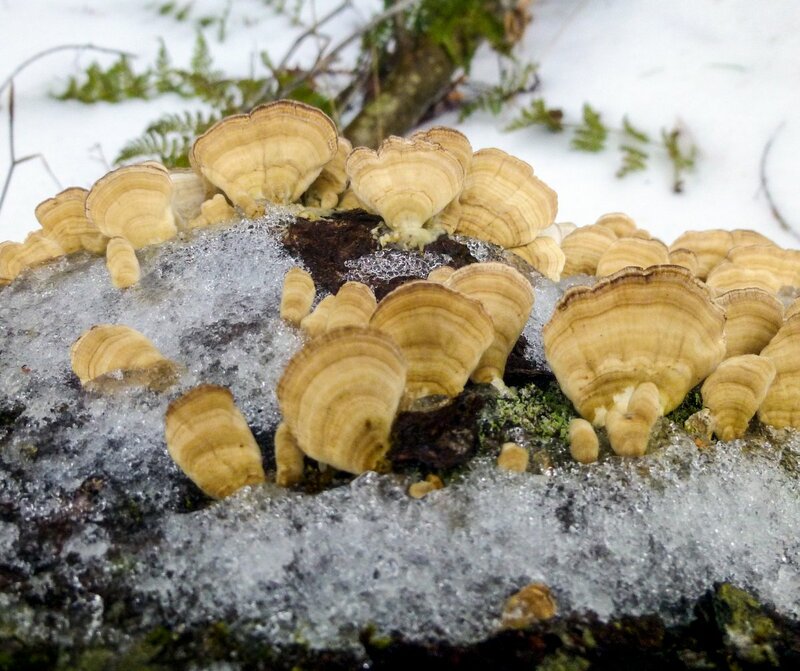 There must be some way that growing so close together and in such large numbers benefits this fungus, but I haven’t been able to find out how. I probably see more of it than any other mushroom. A small tree had fallen between 2 others and was supported so it hung out into the road at about eye level. I was surprised to see how much growth covered the trunk of the fallen tree. 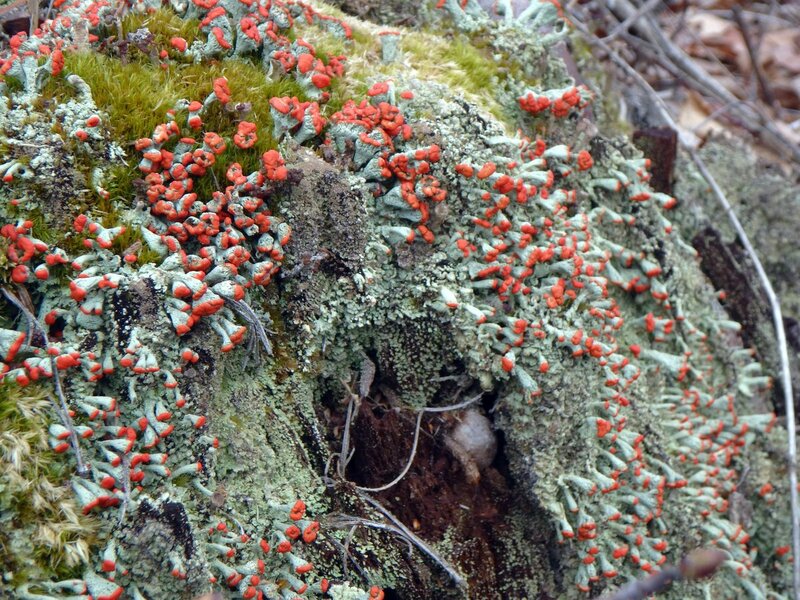 It was like a garden, with several kinds of mosses, lichens and fungi growing all along its entire length. 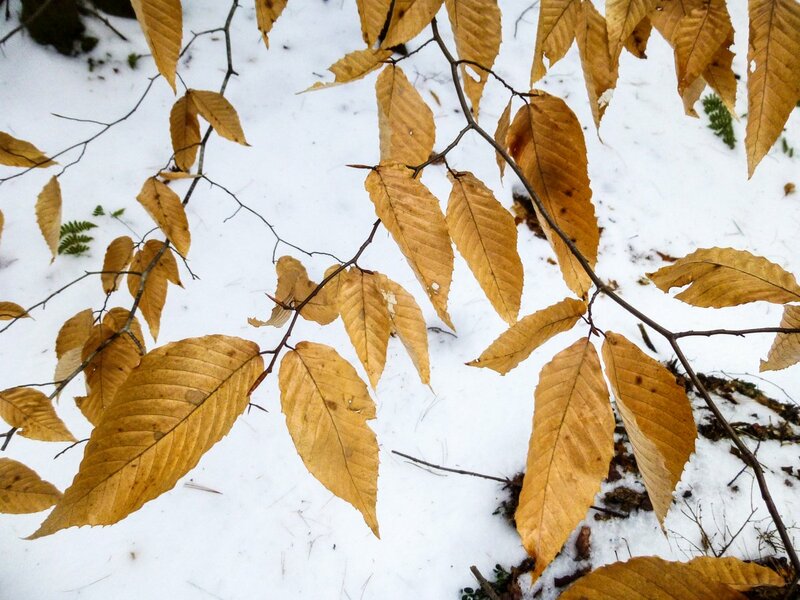 For years I’ve seen certain dead beech leaves as a kind of peachy orangey-pinkish color but I always thought that I was simply seeing the wrong color due to color blindness. Imagine my surprise when my color finding software told me that these leaves were the color that I thought I’d been seeing all along. Color blindness is very strange in how it works differently for virtually every color. Blue can be purple and red can be brown but apparently peach is always peach. 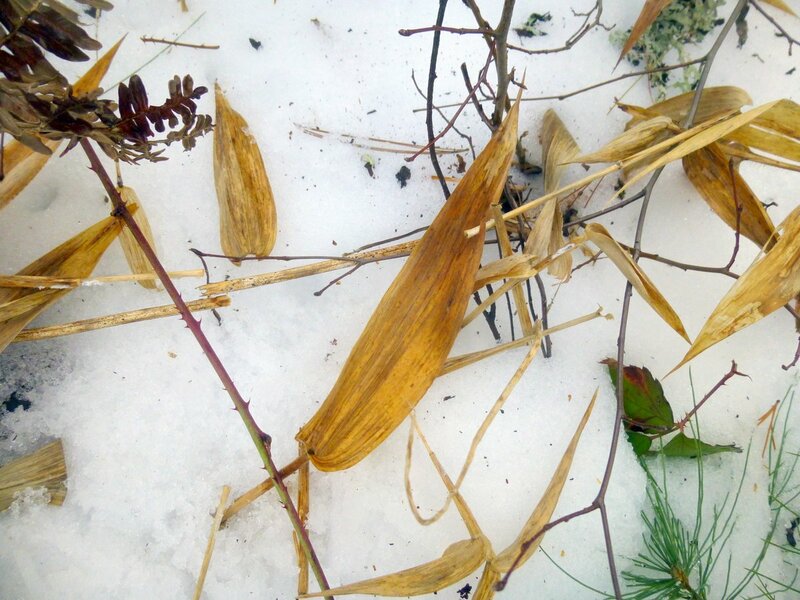 Deer tongue grass (Dichanthelium clandestinum) added some color to the forest floor. 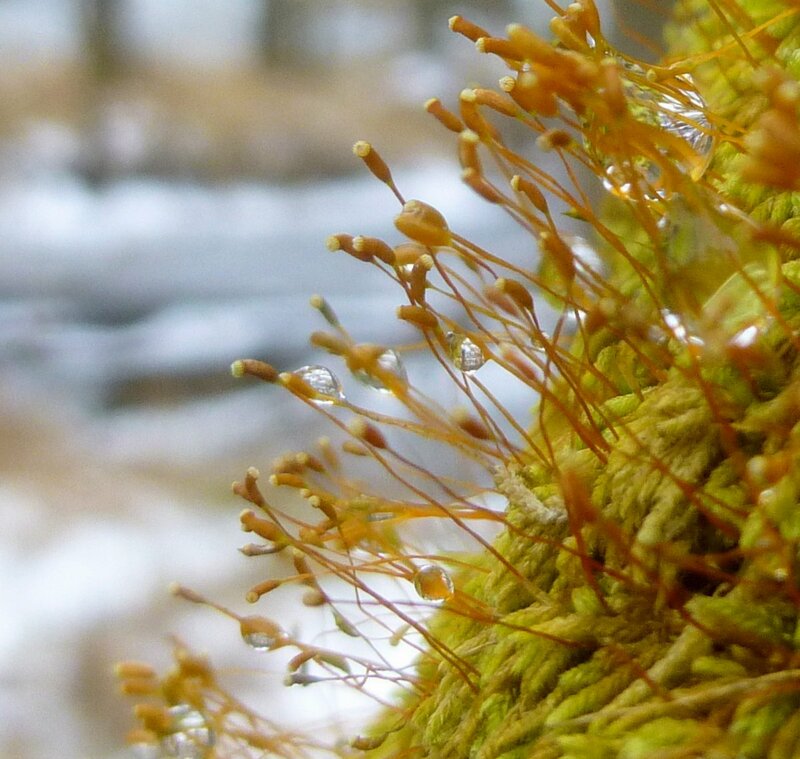 This beautiful moss grew in a rather large patch on a tree trunk, but too high up to be tree skirt moss (Anomodon attenuates.) 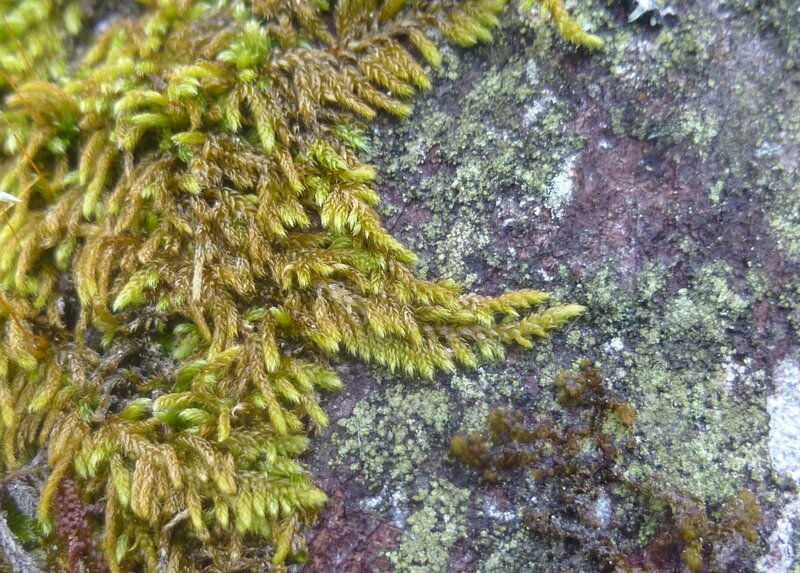 Instead I think it might be lesser plait moss (Hypnum pallescens,) which is supposed to be a “shiny, dark ochre-green moss with light green tips that creeps like satin threads over bark and rock.” Its tiny leaves are triangular and egg shaped, and have a long curved tip like a sickle. Its orange spore capsules were very small and hard to get a good photo of. 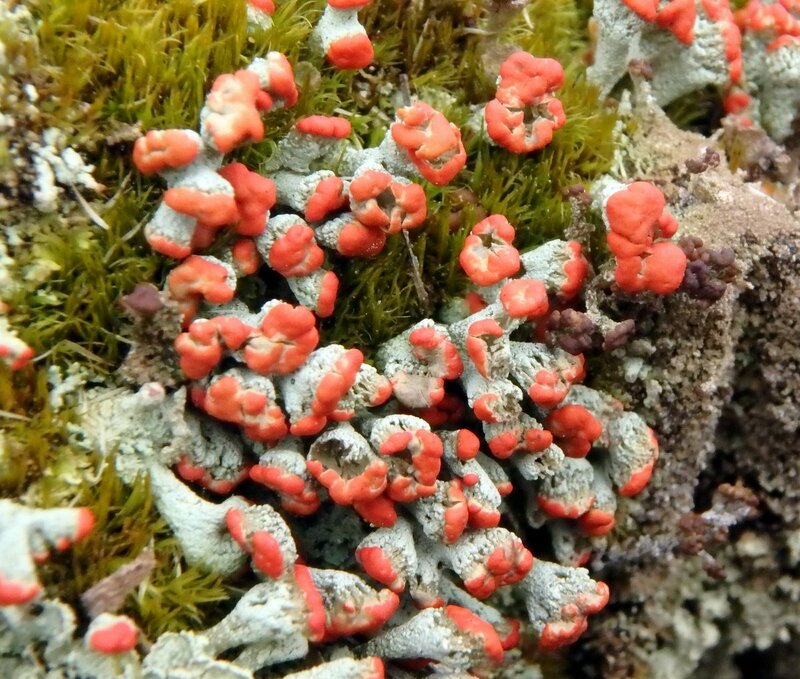 Unfortunately my moss book doesn’t say if the spore capsules of lesser plait moss are orange. 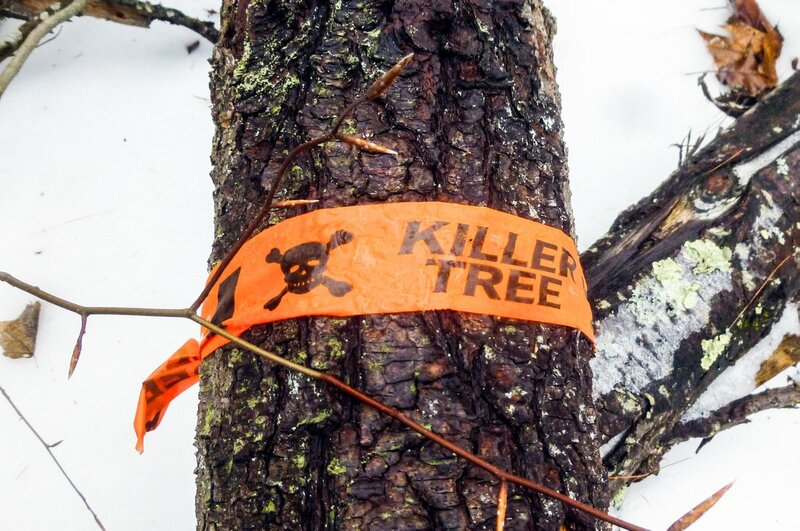 Ironically (or maybe not) a tree with a “killer tree” tape on it had fallen. 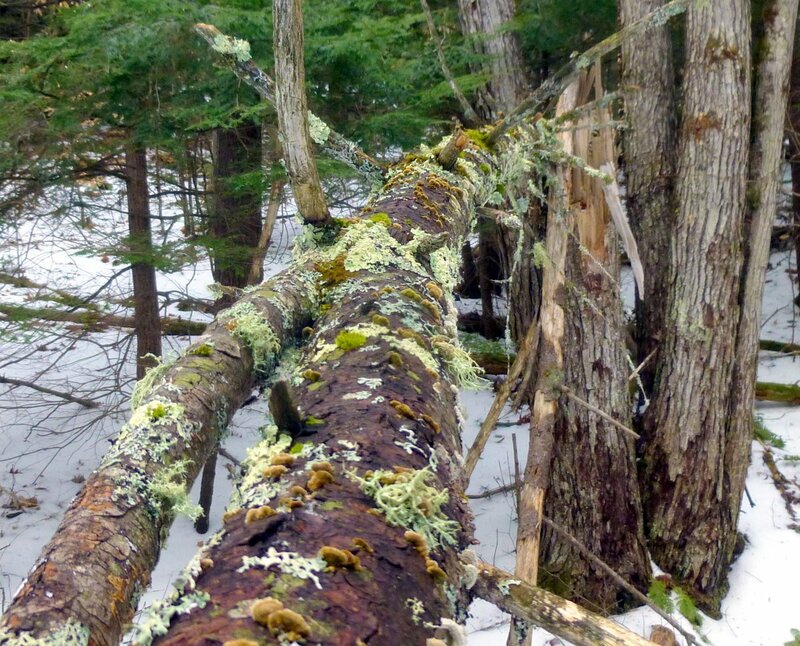 These warnings warn loggers that the tree is dead, diseased or has some other condition that might cause it to fall. In this case it was a valid warning and I was glad it wasn’t windy because there were more still standing. The killer tree’s wood was orange. I don’t think I’ve seen that before and I’m not sure what would cause it other than a fungus. 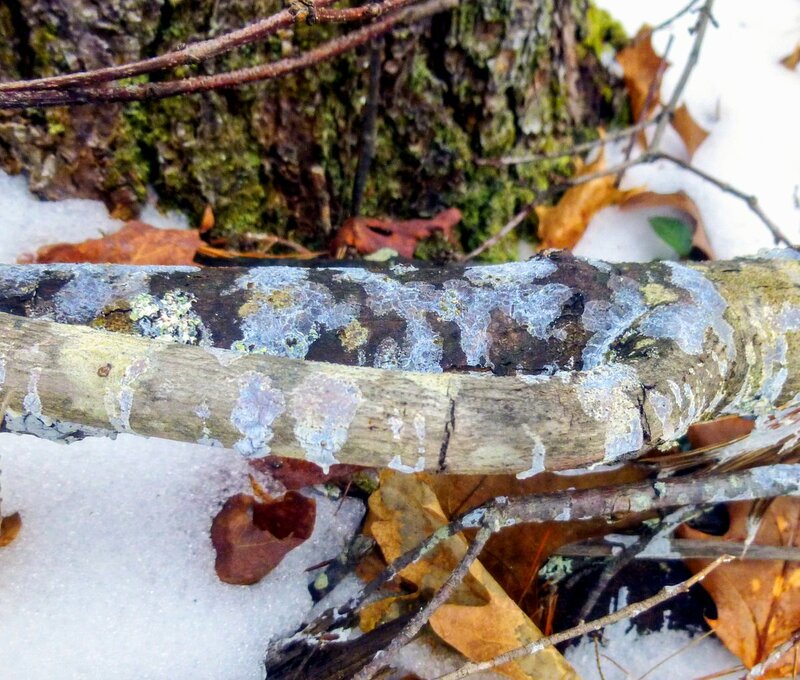 I was fooled once into thinking that I had found a blue lichen, but I hadn’t paid attention and didn’t know that the sticky sap of white pines (Pinus strobus) turned blue in cold weather. Now whenever I find a blue lichen I look around to make sure that I’m not standing near a pine. 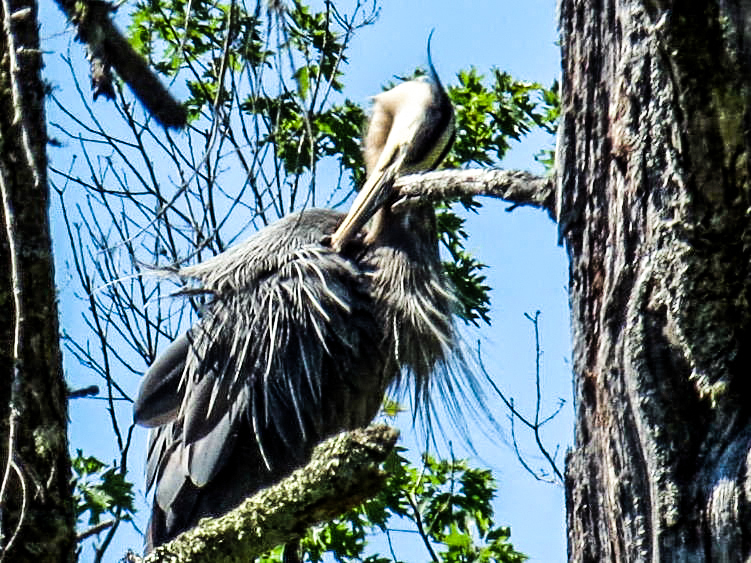 This one had lost a limb and had dripped quite a lot of sap onto the forest litter below. I don’t know how old the tree that was dripping sap was but it was huge; easily three feet across. White pines can reach 200 to 250 years old and some can live over 400 years. Its needles contain five times the amount of the vitamin C of lemons and were used by Native Americans to make tea. This knowledge saved many colonists who were dying of scurvy, but instead of using the tree for food and medicine as the Natives did the colonists cut them down and used the wood for paneling, floors and furniture. 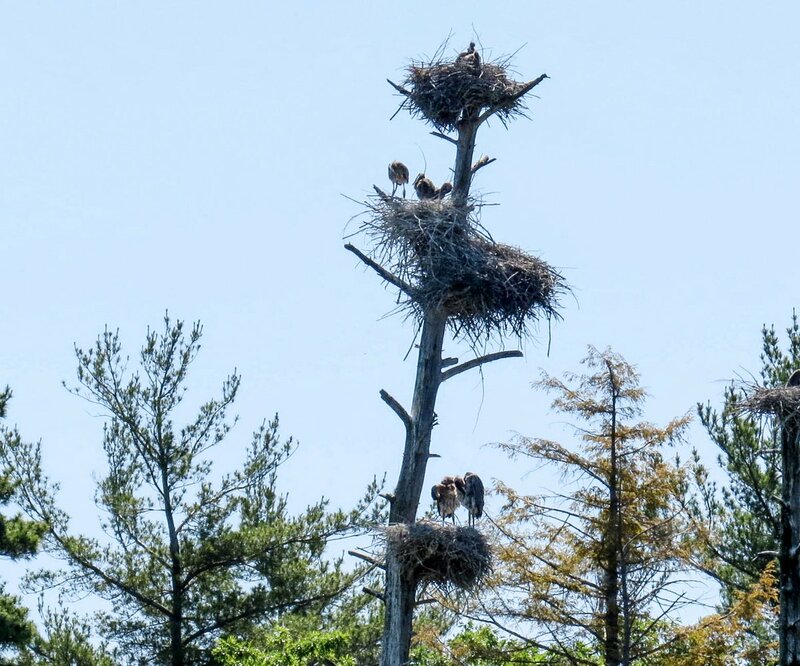 When square riggers roamed the seas the tallest white pines in the Thirteen Colonies were known as mast pines. They were marked with a broad arrow and were reserved for the Royal Navy, and if you had any sense you didn’t get caught cutting one down. This practice of The King taking the best trees led to the Pine Tree Riot in 1772, which was an open act of rebellion. Colonists cut down and hauled off many marked mast pines in what was just a taste of what would come later on in the American Revolution. 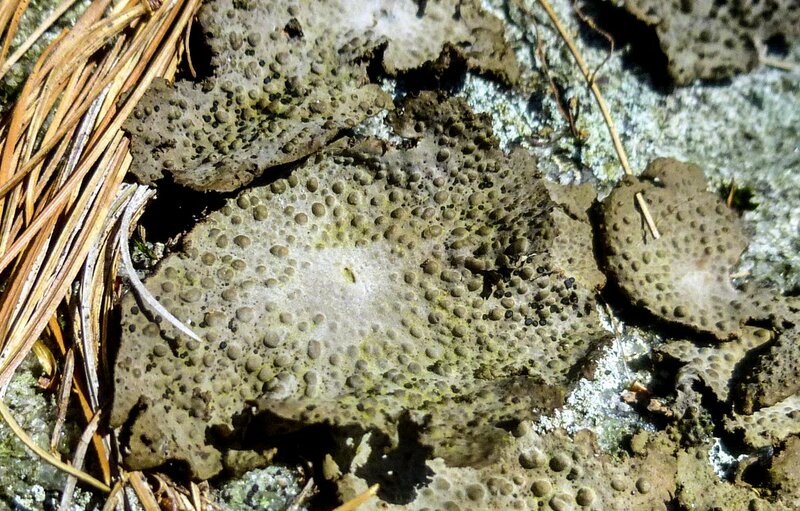 I found a maple dust lichen (Lecanora thysanophora) by accident a few years ago and have hoped to see one again ever since. 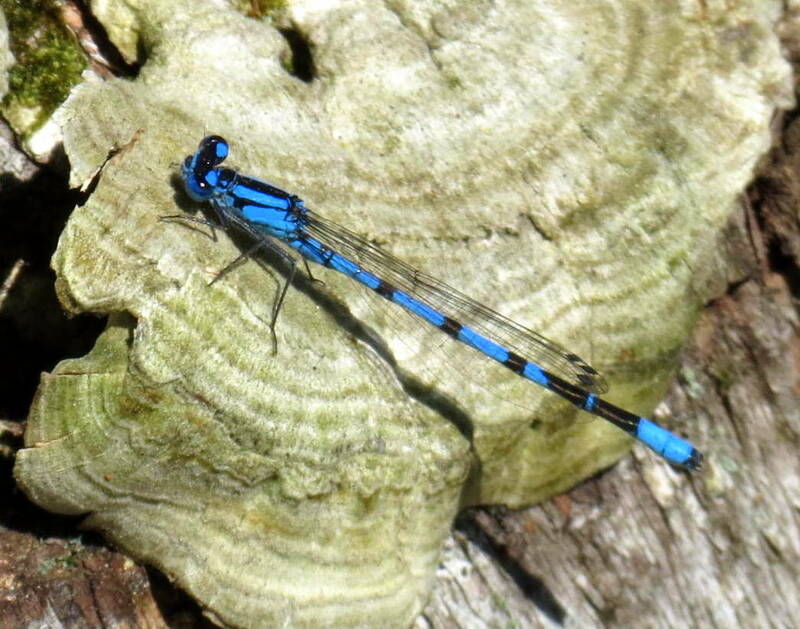 I finally saw one on the bark of a maple in Yale Forest and this is it. 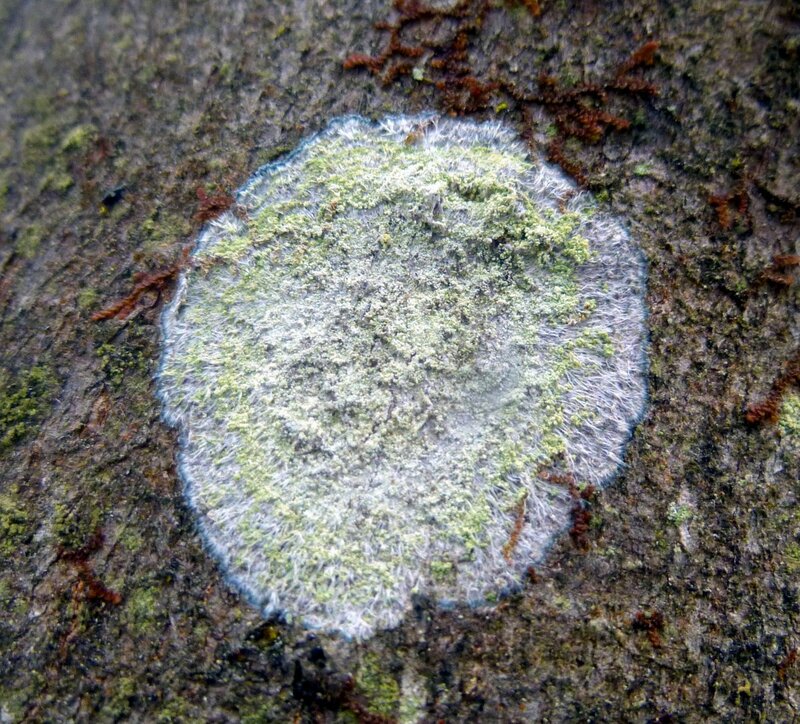 It was maybe an inch across and if I understand what I’ve read correctly you can tell that it’s a maple dust lichen by the tiny fringe around its outer edge. I stood and gazed at it as I would if I were in an art gallery viewing paintings by DaVinci or Rembrandt, because it’s every bit as beautiful. Thanks for coming by. Part 2 of this post will be along on Saturday. I don’t think I’ve ever shown much of what our landscape looks like in November. Some people think there’s nothing worth seeing at this time of year; that everything is either brown or white, but that simply isn’t true and I hope the following photos will prove it. I don’t usually do too much landscape photography because I find it much harder than any other kind and because I’m not that good at it, but I probably can’t lose by starting off with Mount Monadnock. A three year old couldn’t mess up a photo of this mountain from this spot. 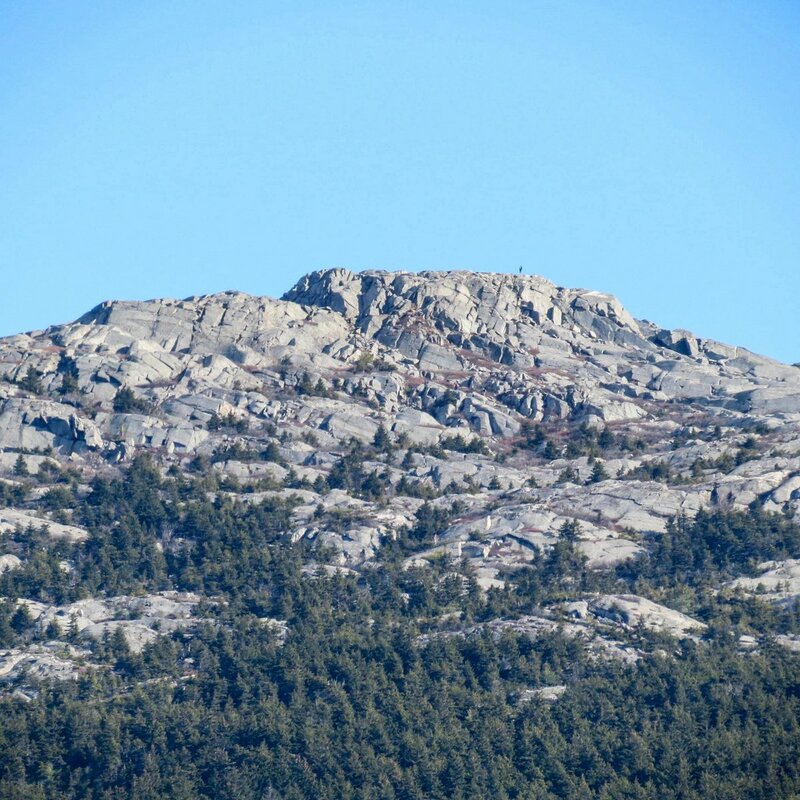 3,165 ft. high Mount Monadnock has bald granite on its summit because a fire set in 1800 to clear the lower slopes for pasture got away from the settlers and burned every tree on its summit. Between 1810 and 1820 local farmers thought that wolves were living in the blowdowns left from the first fire, so they set fire to the mountain again. This fire raged for weeks, burning so long and so hot that it even burned the soil, which the wind and rain eventually removed, leaving the bare granite that we see today. 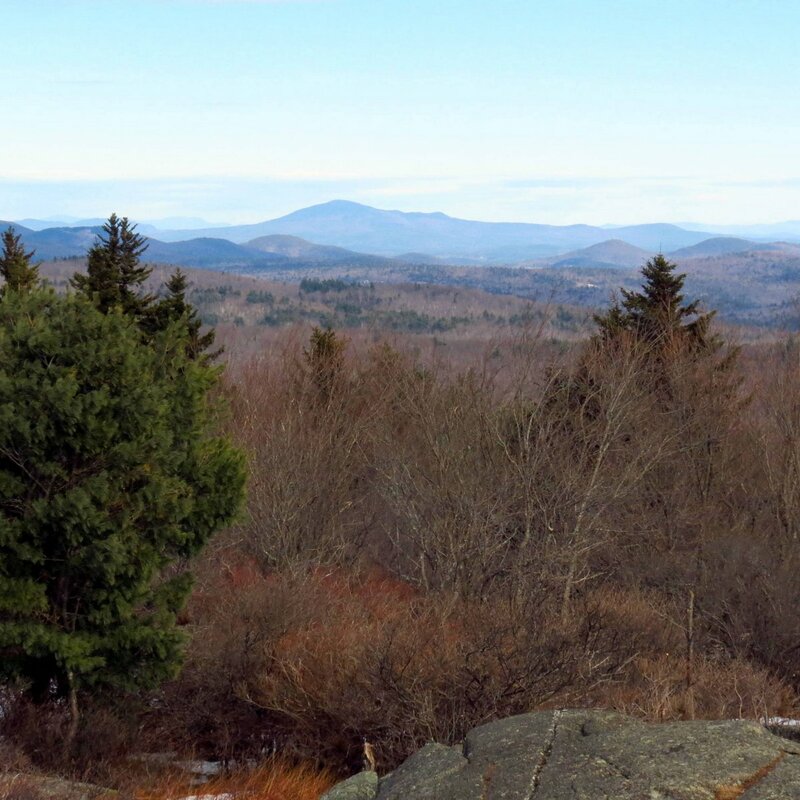 Monadnock is the most climbed mountain in the United States and the second most climbed in the world after Mount Fiji in Japan. 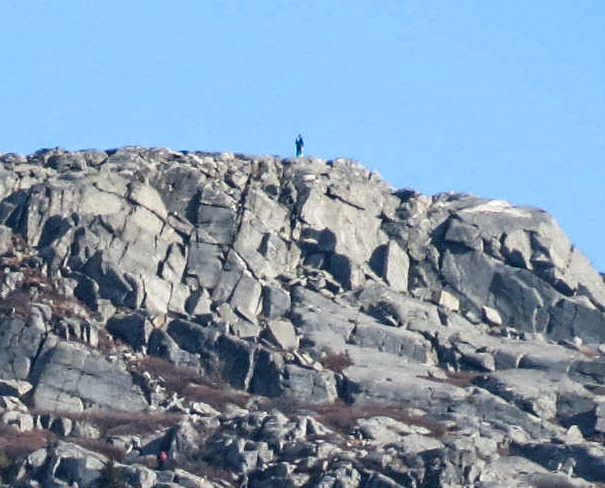 It’s not unusual to find standing room only on the summit on a fall weekend, but on this morning it looked like one climber had the whole thing to himself. I’d bet that it was pretty cold up there and that probably kept people away. It won’t be long before it’s covered by many feet of snow. 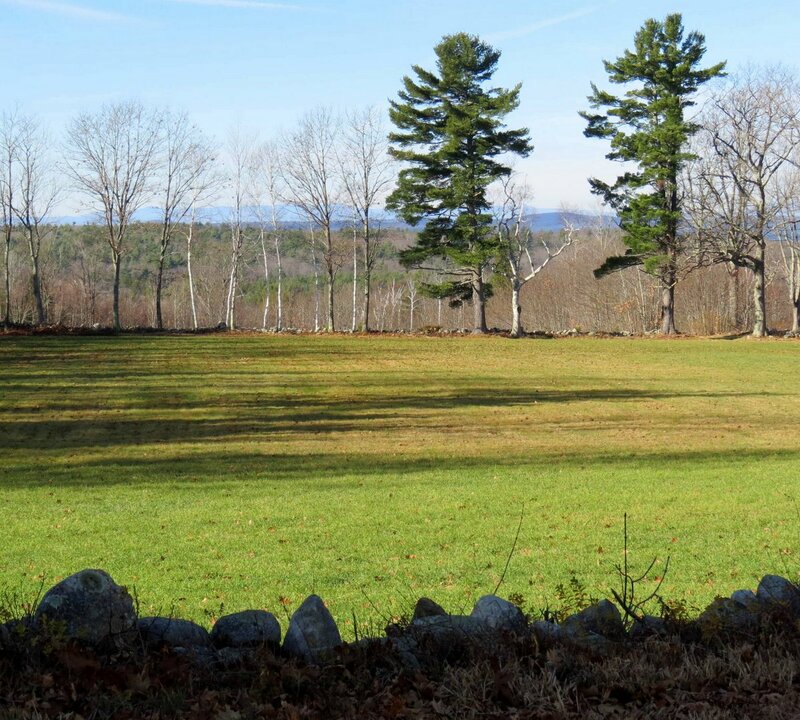 Something that really says New Hampshire to me is a field surrounded by stone walls. The stones were found when the field was being cleared and to get rid of them the farmers put them along the edges of the field. Stone walls built in this way are among the earliest and most common, and are called thrown or tossed walls since that’s how the stones were put there. 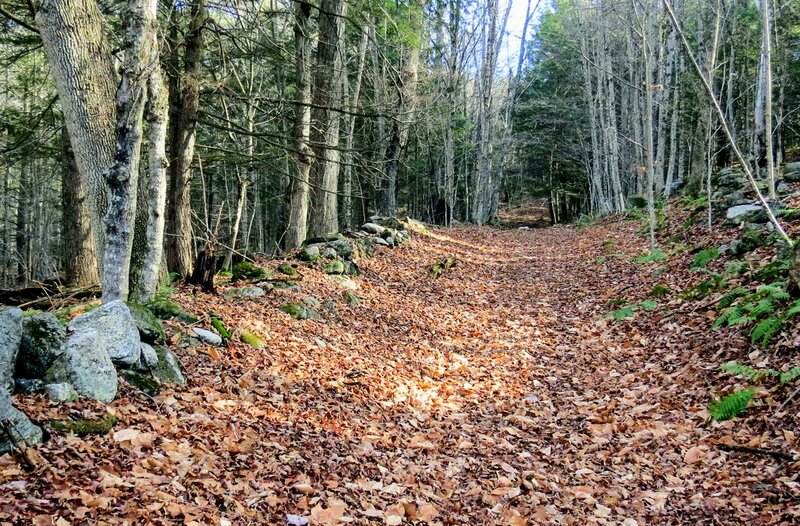 Since forests were being cleared rapidly wood for fencing was in short supply and stone walls eventually replaced the earlier wooden fencing. 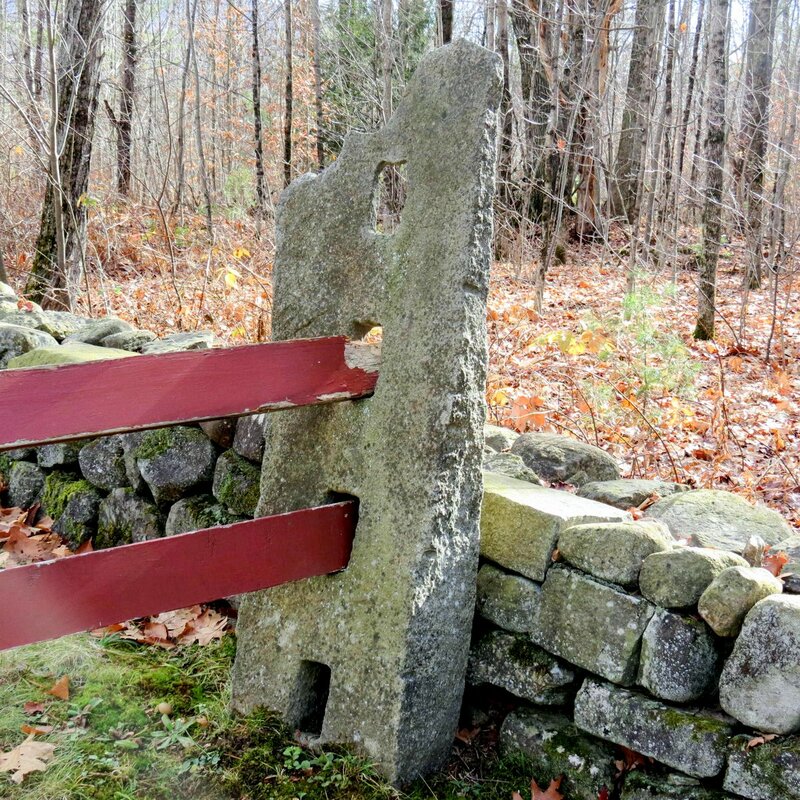 If the field was used as pasture wooden rails were often added to the tops of stone walls to keep animals from jumping over them. Laid walls took more care and time to build and were often used for show along the front of a house or other places that were seen by the public. 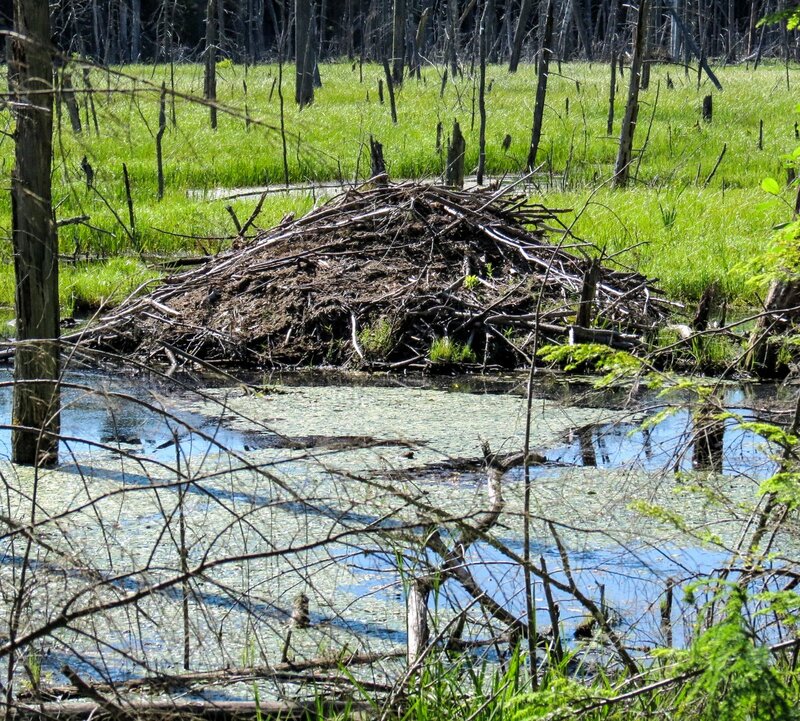 They are more orderly than dumped or thrown walls and show the skill of the builder. This wall had a gate with granite gate posts. You don’t see these very often. 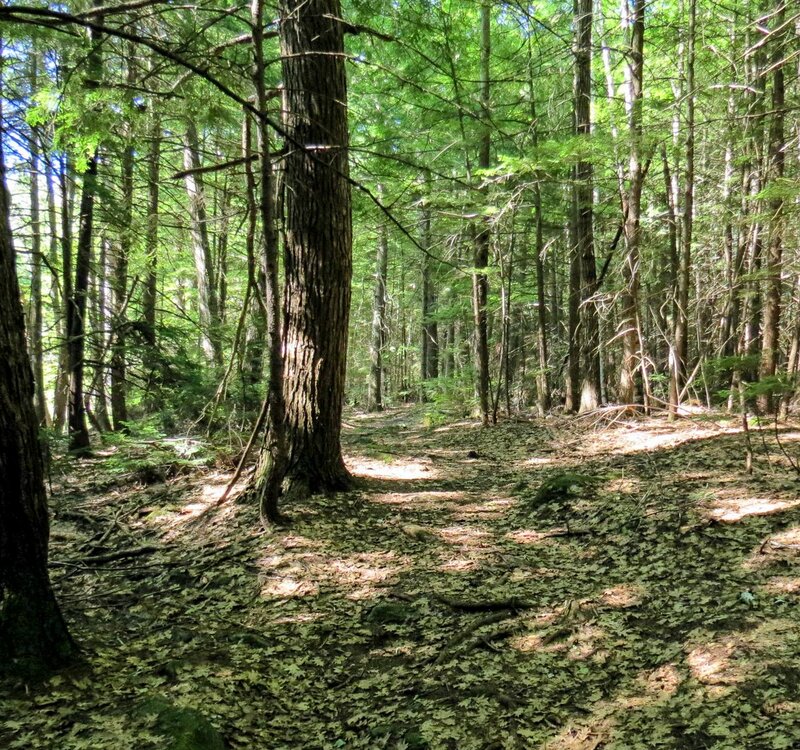 I’ve been walking in these forests almost since I learned how, so I can’t think of this state without thinking of them. 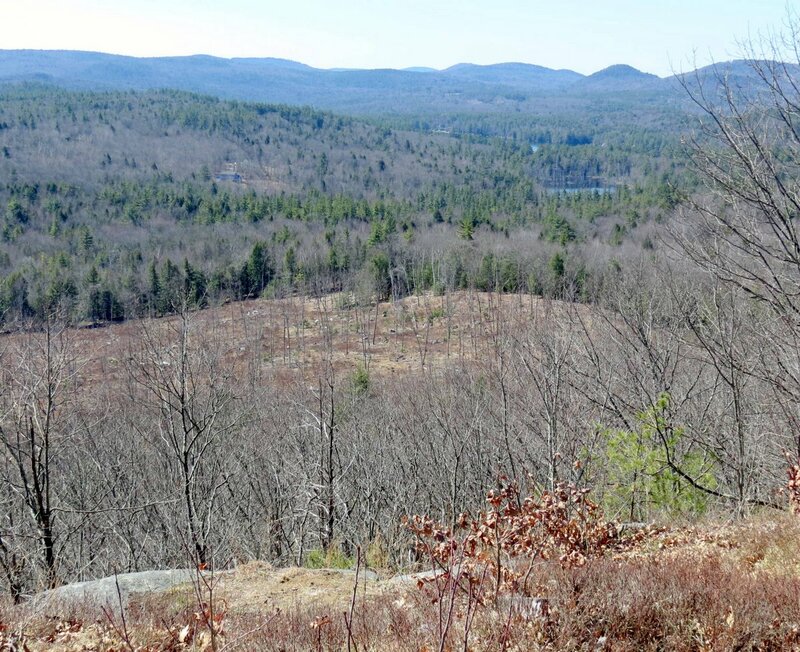 New Hampshire has 4.8 million acres of forest so the woods become a big part of life here. Big open spaces are rare and often have cows in them. I should have said that I’ve been following trails and old logging roads through these forests since I learned to walk. Though I’ve done it in the past just walking into these woods with no trail to follow is a very foolish thing to do. 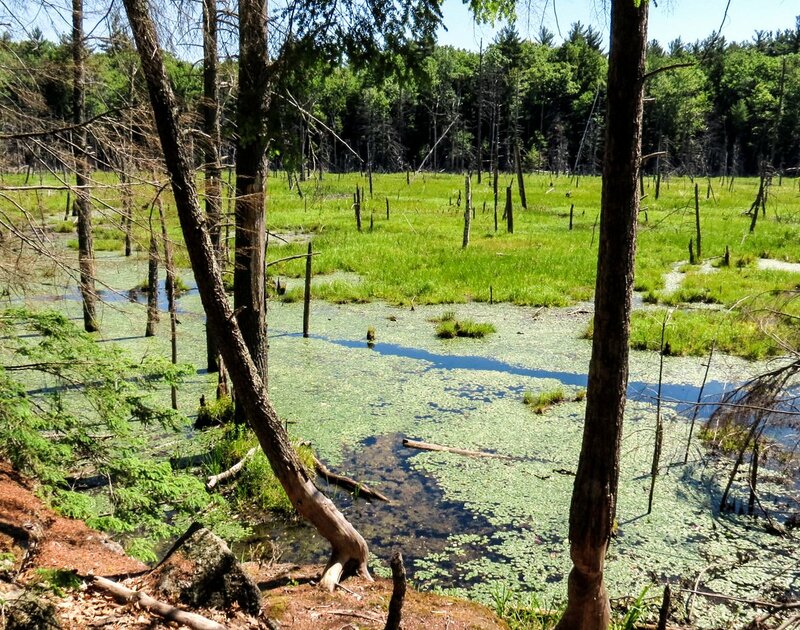 The New Hampshire Fish and Game Department handles between 150 to 200 search and rescues each year, and many are lost and / or injured. 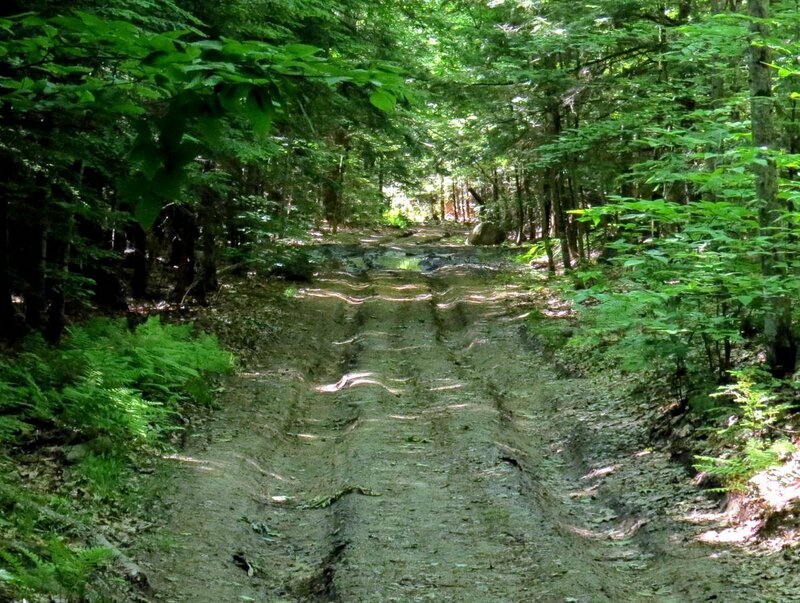 Besides, I love walking the old forgotten roads because there is often a lot of history to be found along them. Stone walls and cellar holes tell an interesting story. 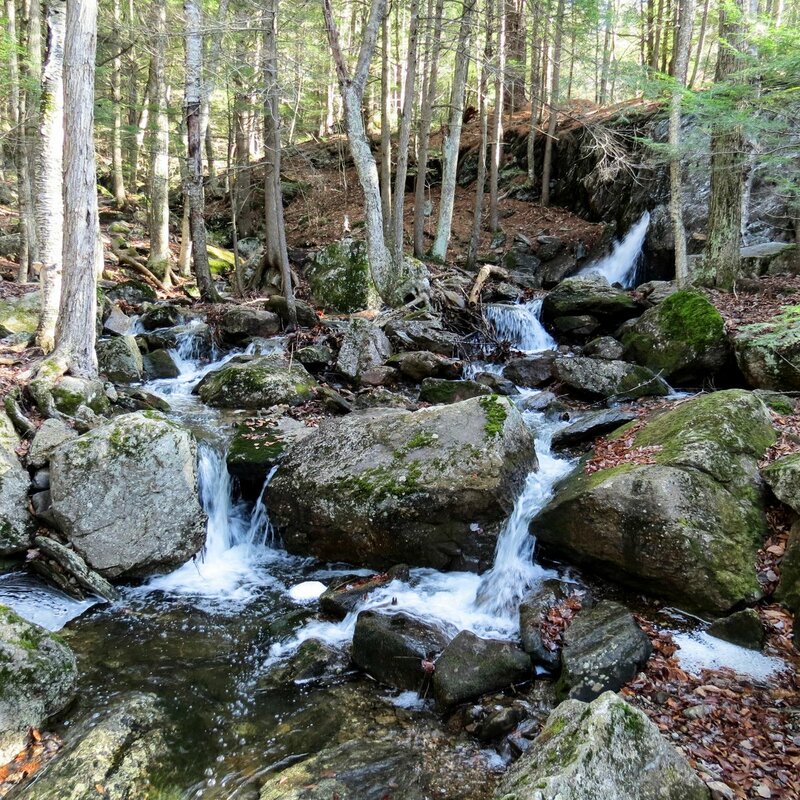 If there’s one thing New Hampshire has plenty of it is water, and even in a drought most of the streams run. The water is clean and clear and many people still fill bottles with it at local springs. I like to just sit and listen to streams chuckle and giggle as they play and splash among the moss covered stones. At times nature is like a little child and this to me, is that child’s laughter. 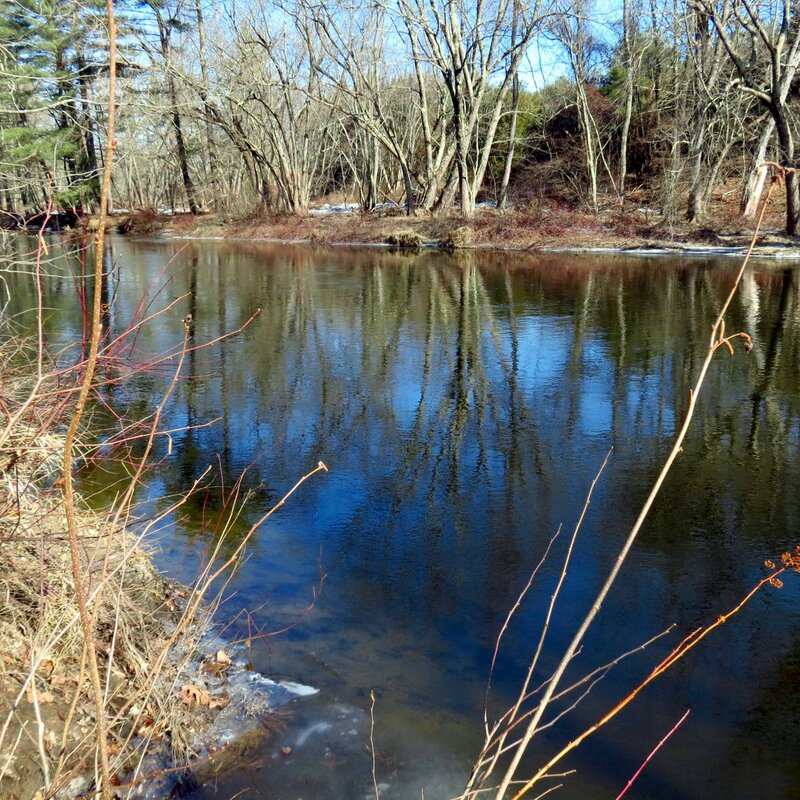 The Ashuelot River is also fairly clean now but it wasn’t always that way. I can remember when it ran all colors of the rainbow, depending on what color dyes the woolen mills happened to be using on any given day. To now see people catching trout in this river and bald eagles nesting along its course seems truly miraculous to me. 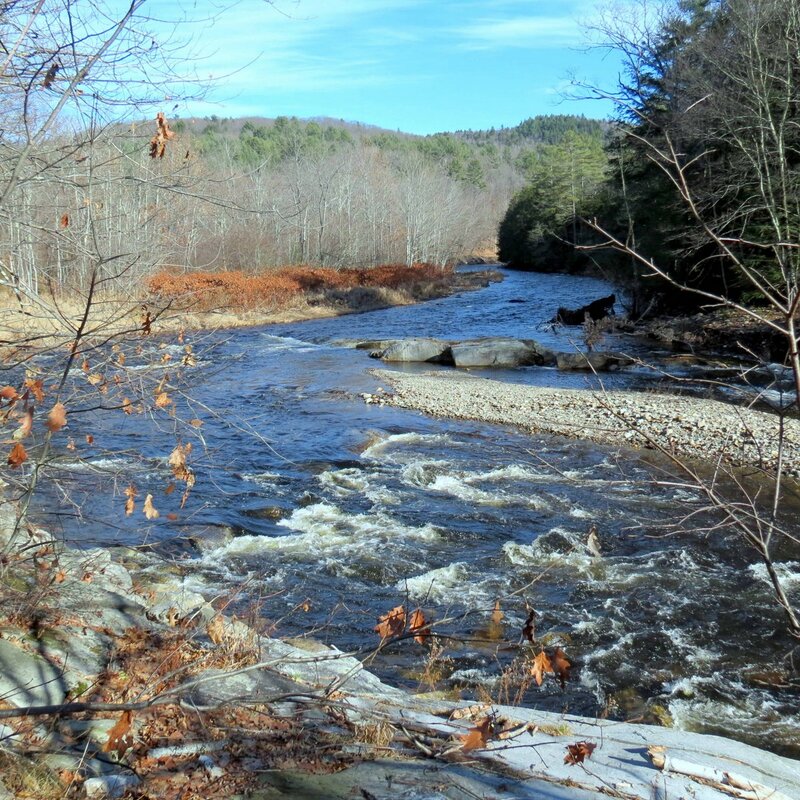 I like going to see parts of the Ashuelot River that aren’t that familiar to me like this section up in Gilsum, which is north of Keene. I particularly like this stretch because of its wildness. Major floods tore through here a few years ago and scrubbed the river banks clean of soil right down to the bedrock in places. A steel suspension bridge that crossed near this spot was torn loose and wrapped around trees and boulders like it was made of aluminum foil and pieces of it can still be found bent around various immoveable objects to this day. 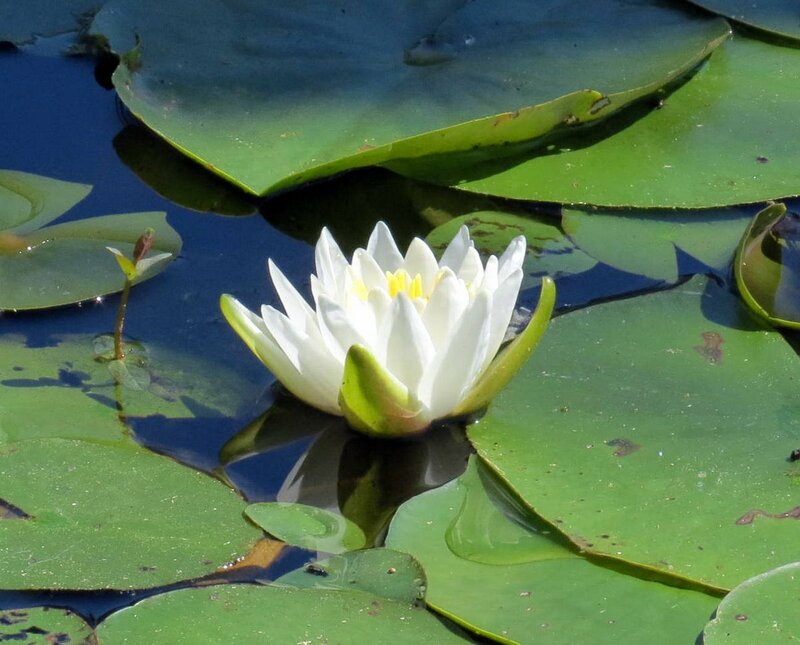 But enough about flooding; I prefer the placid waters of our many lakes and ponds. 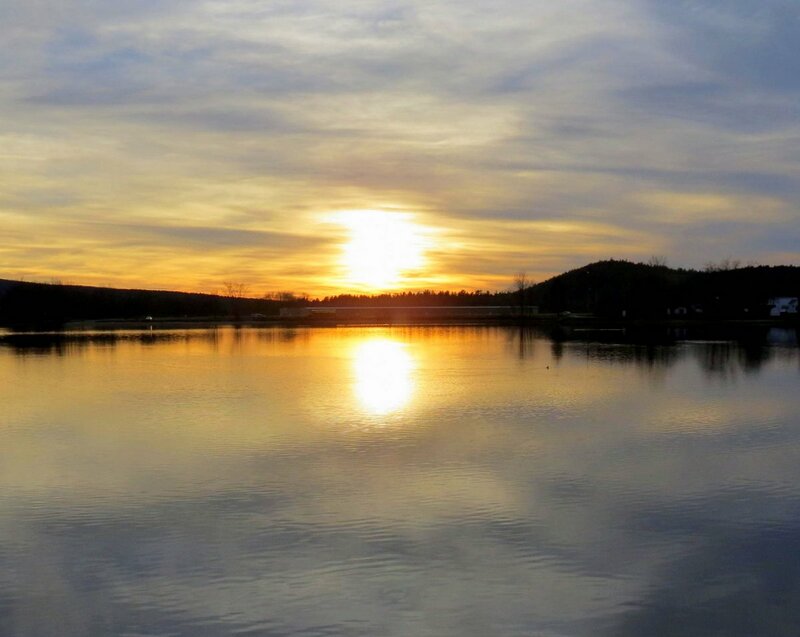 I was thinking as I started putting this post together that I can’t think of a single town in this region that doesn’t have a lake or pond, and most have both. 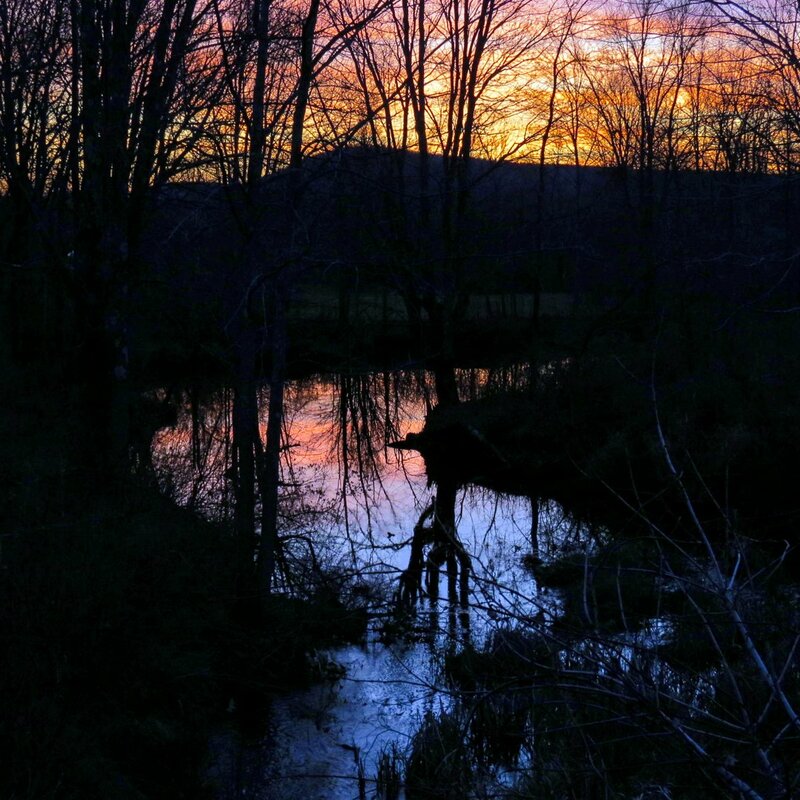 The pond pictured is Wilson Pond in Swanzey last Saturday at sunset. 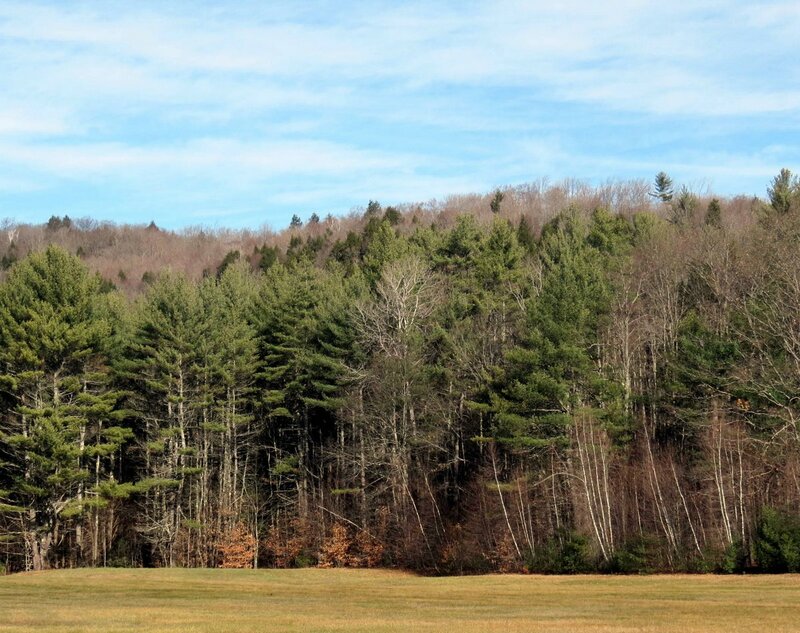 Other things we seem to have a great abundance of, at least in this part of New Hampshire, are hills. In fact Keene sits in a kind of bowl and no matter which direction you choose to leave it by, you have to climb a hill. So of course I wanted to show you hills, but I found that photos of hills in November aren’t very exciting. On this day though the setting sun in the previous photo turned the sky a peachy color and the hills a deep indigo blue, improving their appearance considerably I thought. 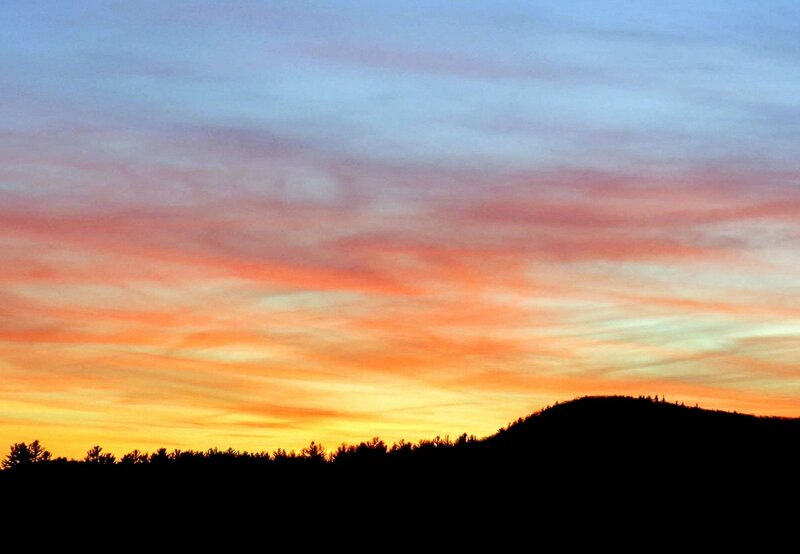 As the sun continued to set the color of the sky became richer and deeper. I was driving home at the time and had to keep stopping to take another photo because we don’t see skies like this every day. It was so beautiful that I spent more time just sitting and staring than I did taking photos. This kind of beauty isn’t just seen; it’s felt as well, as if you are bathing in it, and I don’t see how anyone could have room for anything but peace in their hearts after witnessing such a display. Just to see if I could do it all of the photos in this post were taken in one day, and what a day it was. But as every day must this one had to end, and I just happened to be near a stream when the light began to fade. I expected the pink and orange reflected sky but I didn’t expect the beautiful blues. A perfect end to a perfect day. Thanks for coming by. I hope everyone has a safe and happy Thanksgiving Day tomorrow, or just a plain old good day if you don’t celebrate Thanksgiving.